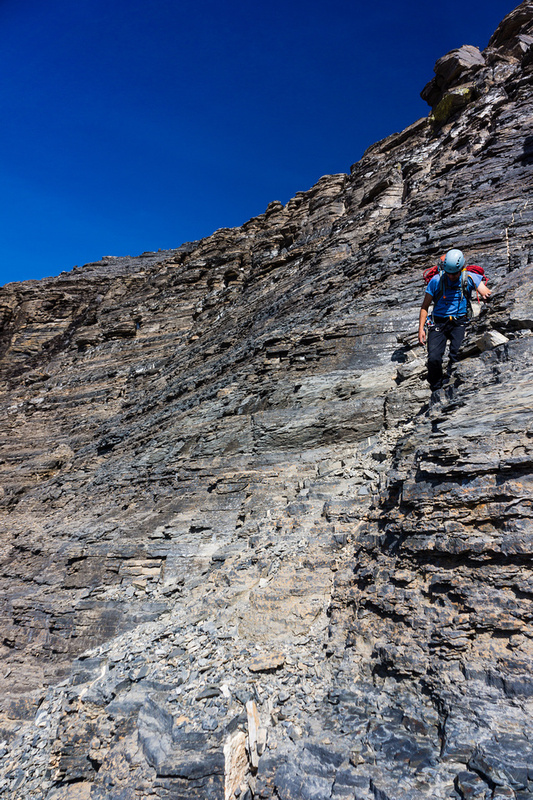 Difficulty Notes: Don’t underestimate this mountain! 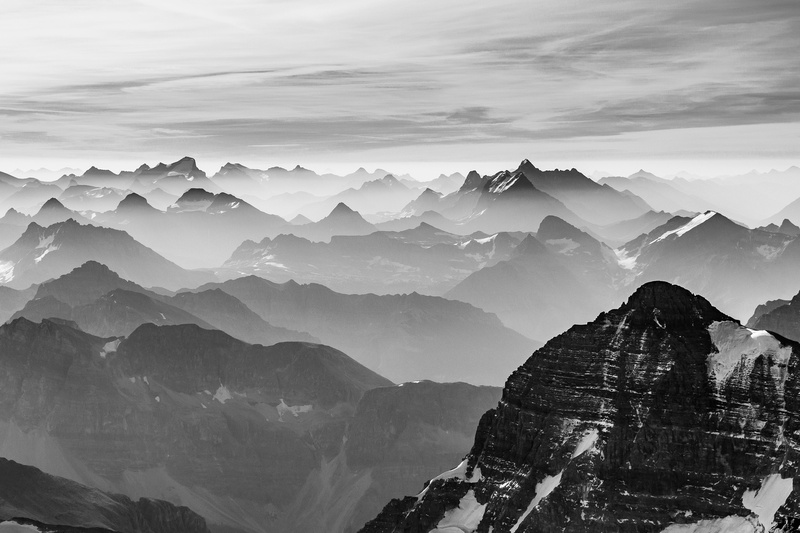 Many folks have and many have subsequently failed to reach the summit or worse. Just because it’s popular doesn’t make it “just a scramble”. Note: We combined Assiniboine and Lunette in a traverse from the north ridge to the SW face which has some unique challenges mainly around route finding. I’ve been dreaming of the Matterhorn of the Rockies since I first laid eyes on her while on a hiking trip to the area in 2008. I never actually thought I’d be climbing its NE ridge but it was fun to imagine! 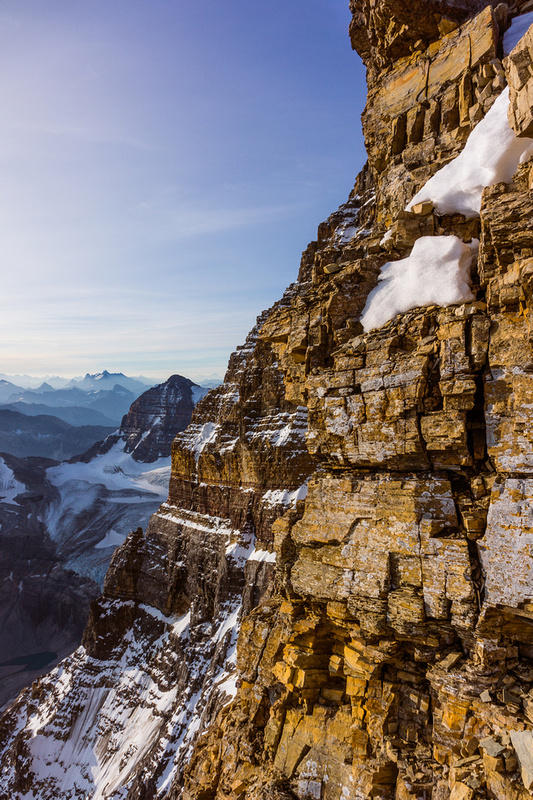 Towering over everything in its vicinity and visible from almost every prominent peak in south Banff and Kananaskis , Mount Assiniboine is a big, beautiful mountain that has inspired climbers from all over the world to test its charms. 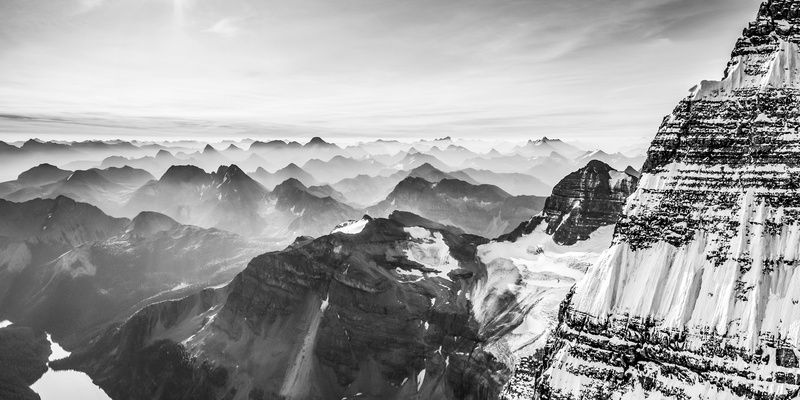 Many have succeeded but many have also failed – a number of climbers have even lost their life on the steep unforgiving slopes over the years. I’ve heard stories of people losing their way and rapping down the north face in white-outs. 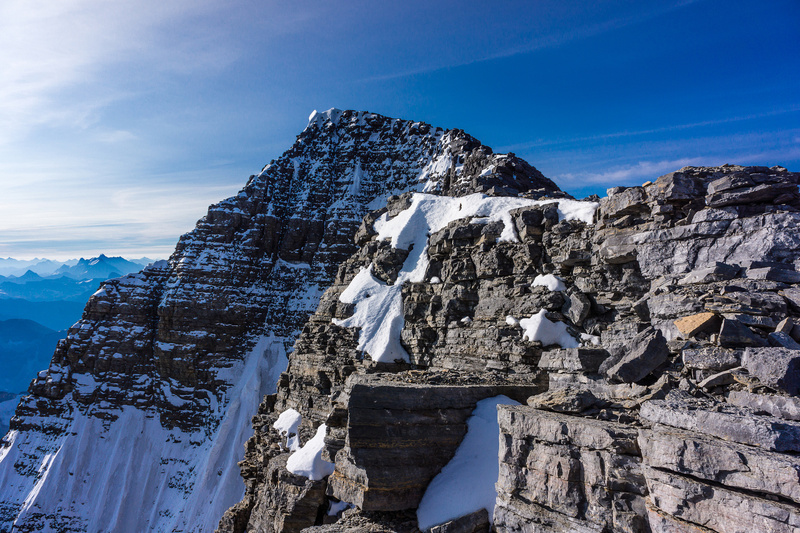 I’ve talked to people who attempted Assiniboine as their first peak and then watched others die from serious injury after slipping on descent – exhausted and inexperienced. 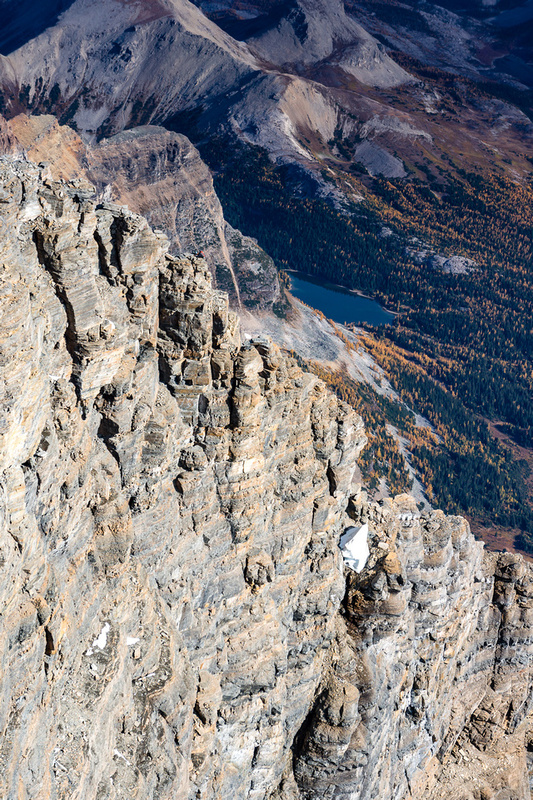 Falling at just under 12000 feet high, the weather and climbing conditions are extremely unpredictable on Assiniboine and this contributes to its charms and it’s bite. 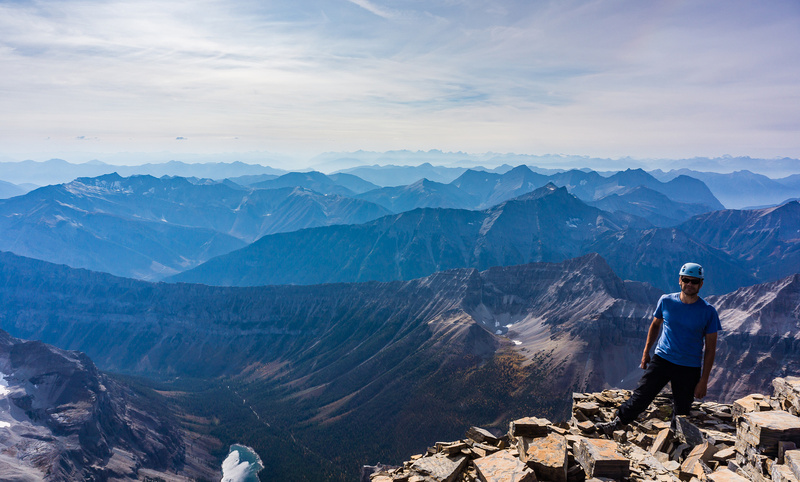 Experienced climbers call the ridge a ‘glorified scramble’ when dry and have soloed it in 5 hours hut-to-hut (including raps), but I have other friends who have taken 9 hours just to reach the top. 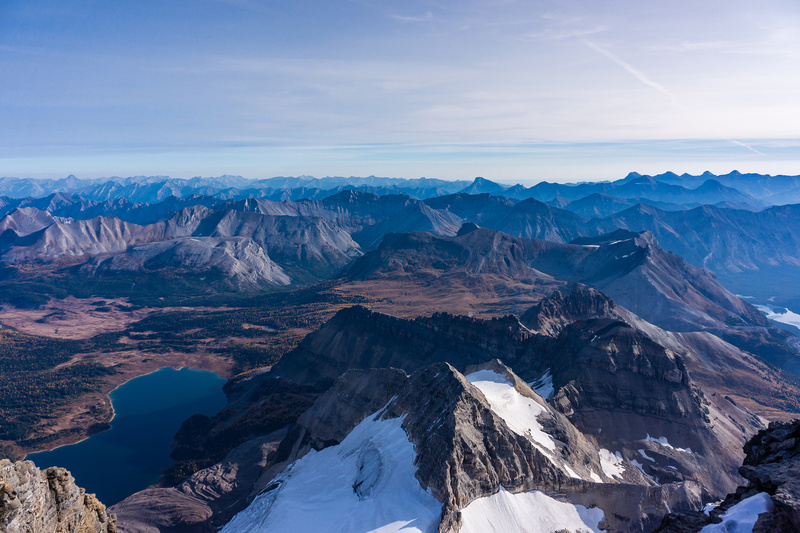 After recently climbing Fryatt with Kevin Barton, we made some plans on that long drive home to attempt another 11000er if the weather held into late September. 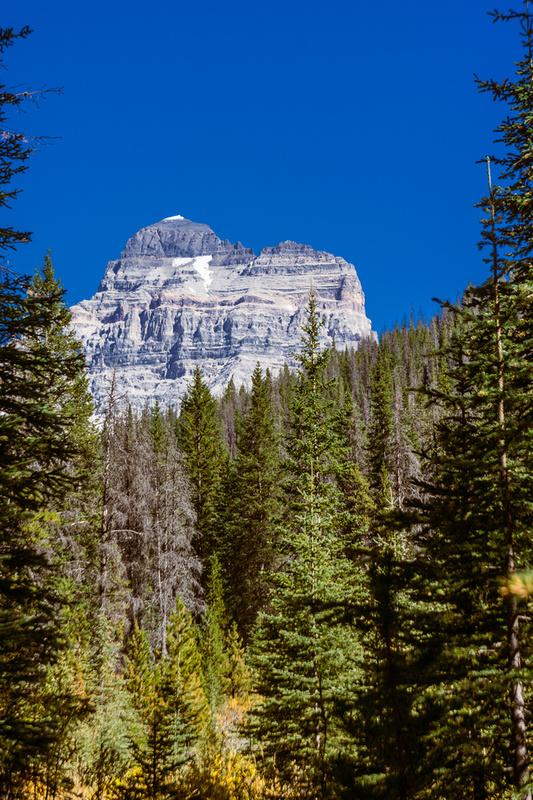 Against all odds, the weather DID hold and by the week of September 16th we were planning either an ascent of King Edward or Mount Assiniboine and Lunette Peak. Kev strongly preferred the ‘Big A’ and I wasn’t arguing so that was that. Given the unbelievable warm and dry weather in Sept 2012, I was caught a bit off guard when the reservation staff for the Hind (climbers) hut stressed repeatedly to me on the phone that big ‘A’ was plastered in snow and ice. She also gave me a tone that implied we were nutso for even thinking of climbing it this late in the season. 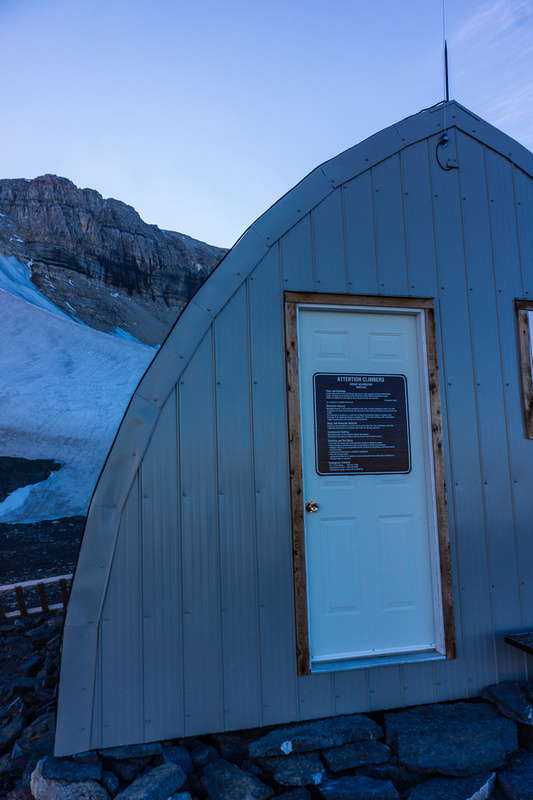 When I phoned the lodge on Wednesday to confirm the hut was still open I got the same vibe – the mountain is out of shape for the year but “good luck”! Apparently no one had even tried the peak for three weeks – that the lodge knew of. 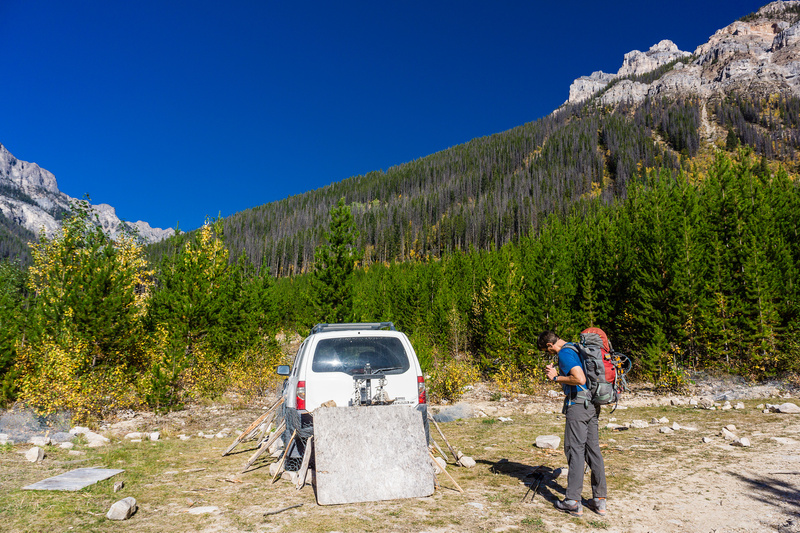 I picked Kev up at 0745 and we headed for Settlers Road in Kootenay National Park. The gravel mining road was in superb condition and I flew down it pretty quick in my xTerra. There were a few tight stretches where I’m glad we didn’t meet mining trucks but in the end we only ran past two of them in 38km so there aren’t that many on the road – they do drive very fast though. As we turned onto the much rougher and narrower Aurora Creek road for the last 4 km we started to realize how beautiful this area really is. We stopped the truck to take photos of Aye and Eon – both of them rising spectacularly above the valley beneath. With their fall coats and the brilliant blue sky they looked very inviting but also remote and a little intimidating. We parked at the trailhead (any vehicle should be able to make the drive but no guarantees about crossing the manky bridges…) and wrapped the truck tightly with available chicken wire. We used a lot of the material that was laying around because we were the only ones there. 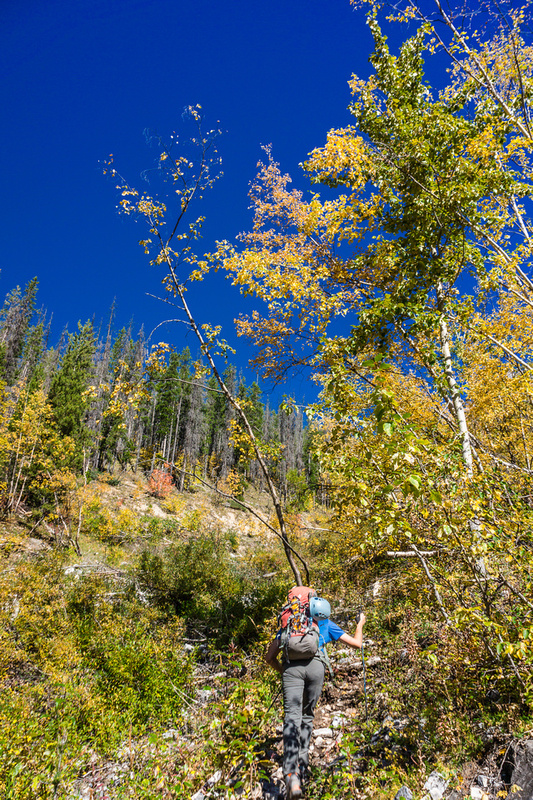 We loaded up our packs and headed up the trail – a hot sun beating overhead in a clear fall sky. 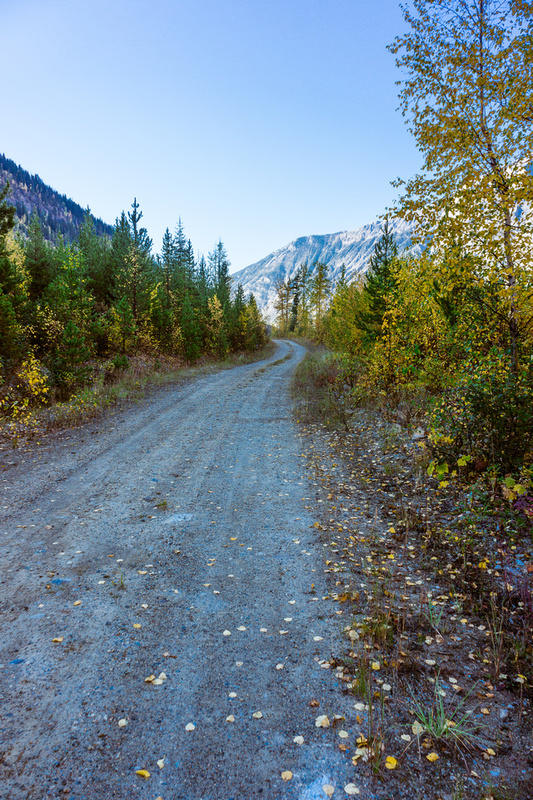 The Aurora Creek approach road is much smaller than Settlers Road but in great condition. This log was interesting to cross about 34 hours later in the dark… 😉 Thank goodness for the wire though – it certainly makes it easier. Almost immediately we ran into a registration box for people going in to do Assiniboine. We noticed that a party had completed the climb a week previous – there goes the theory that nobody climbed it in three weeks anyway. This was a good sign. 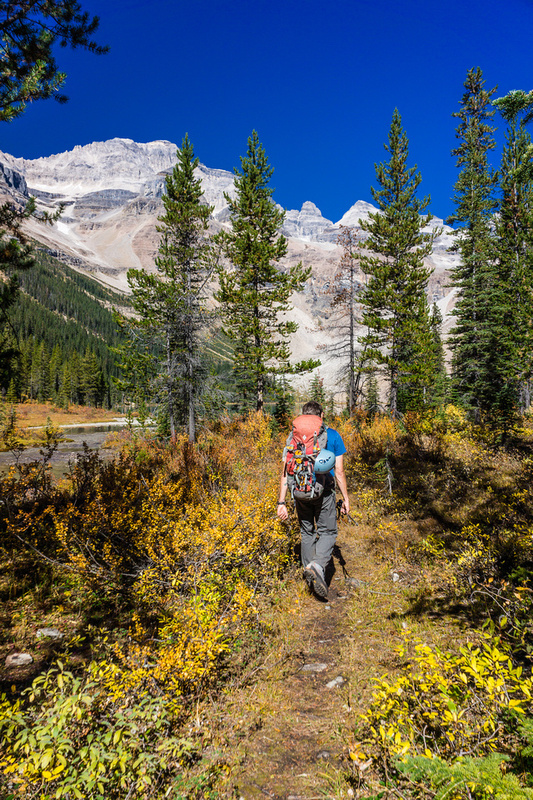 The trail to Assiniboine Lake is excellent. 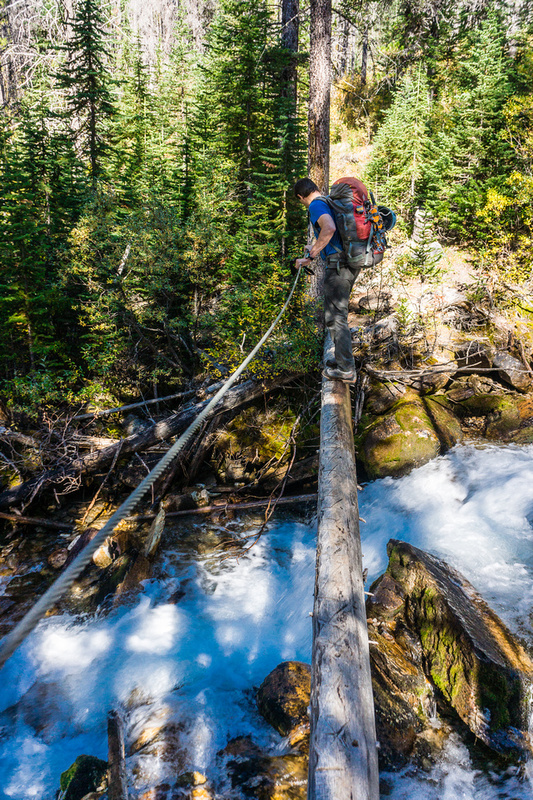 It climbs steeply at first and then more gradually, crossing a few streams (one log bridge with cable) before splitting at the Lunette Lake turnoff. I looked up that trail as we passed it, thinking that possibly we’d be coming out on it the very next day with a successful climb! It seemed impossibly far off at this point though! When we got our first glimpse of the SW face of the big ‘A’ I almost gave up – it looked ridiculously huge and steep from this angle! It looked awesome too though. 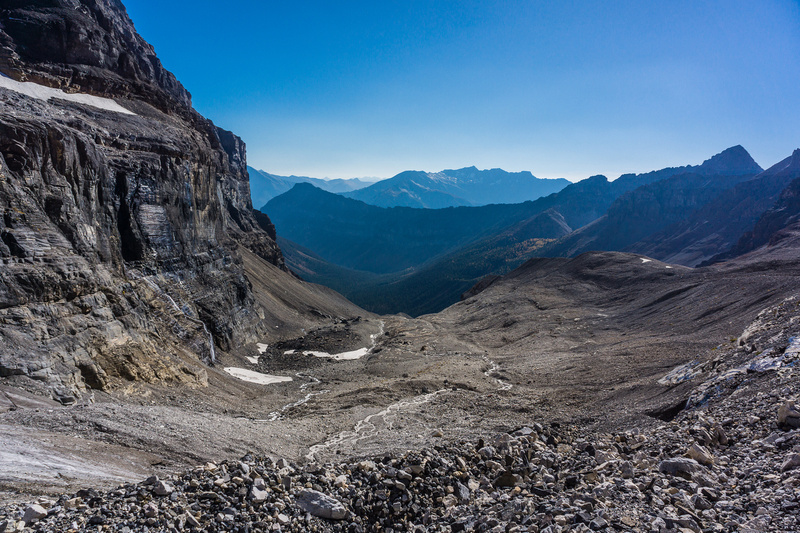 The mighty “A” reveals her SW side as we round the trail towards Assiniboine Lake. 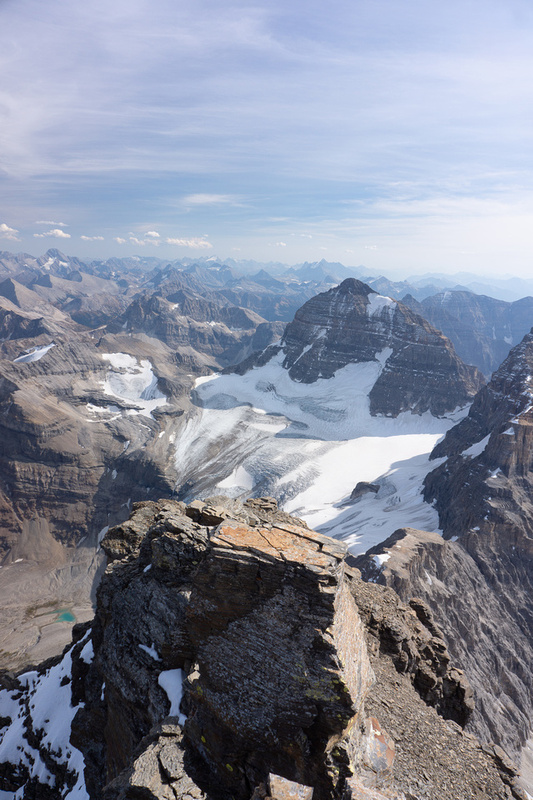 Assiniboine on the left and Lunette on the right. This is the face we will descend and it’s as big as it looks! 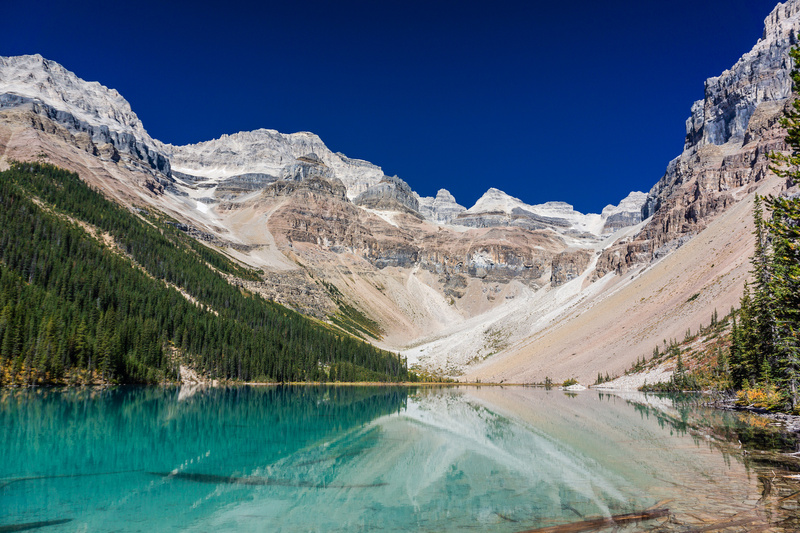 At the turquoise waters of Assiniboine Lake we took our first break – Kev’s feet needed some TLC. The trail ends just past the lake so we also took in some food for the climb ahead. 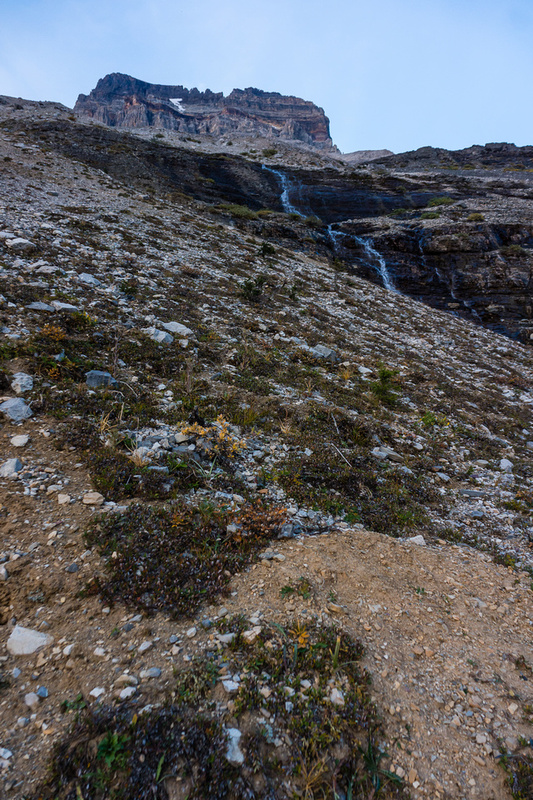 The route from the lake to the Strom / Assiniboine col is pretty straight forward but a bit of work. 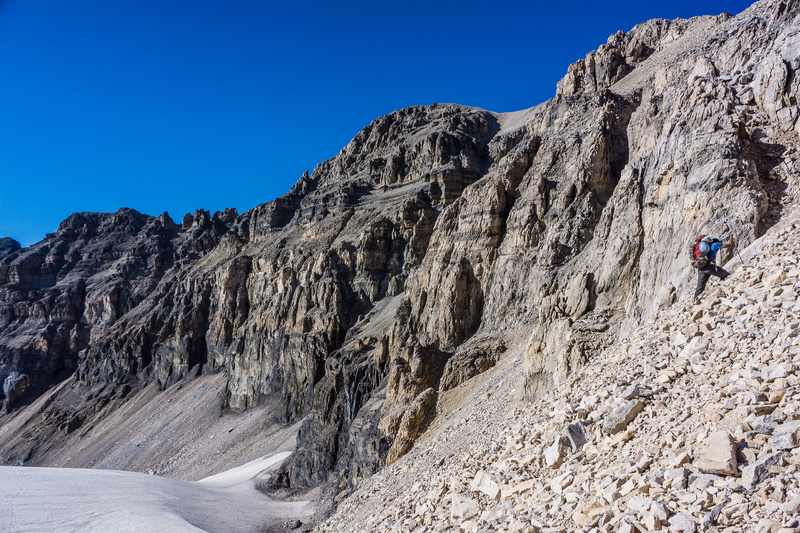 We went up scree slopes at the far end of the lake and around an obvious buttress on climbers right. 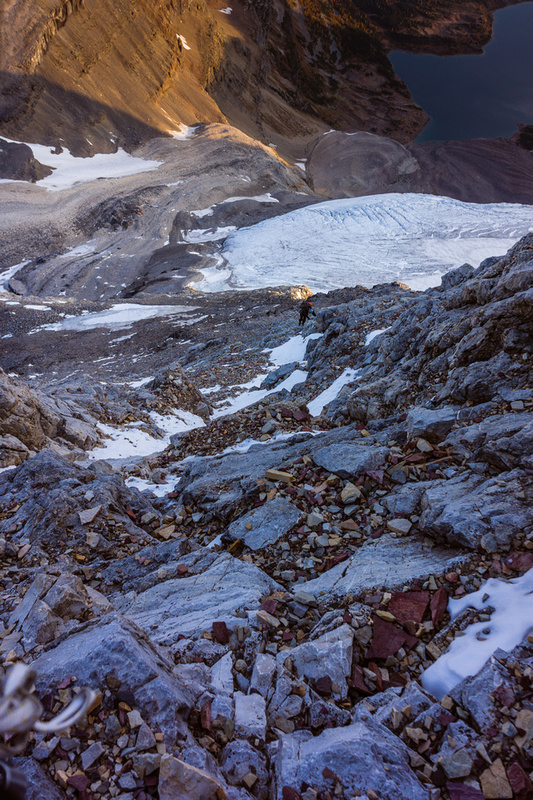 Soon after that we struggled up an old moraine and could see the Sturdee Glacier far off and to out right. 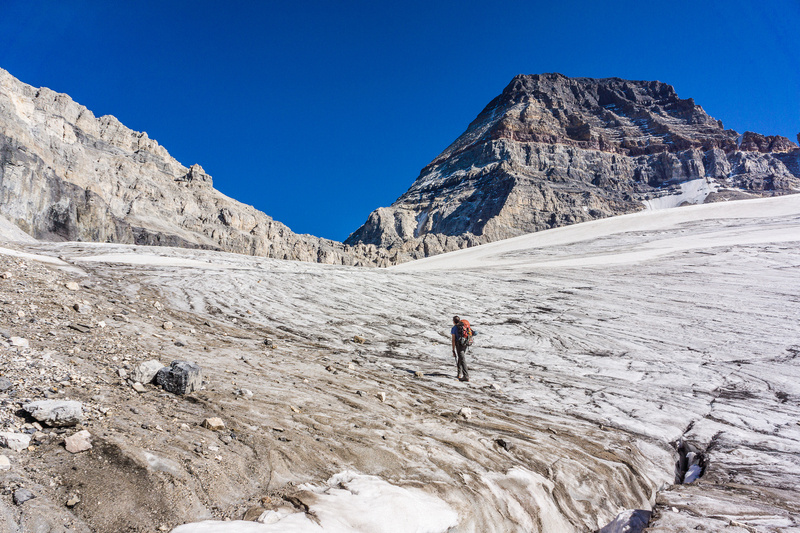 We headed for the glacier and ascended scree slopes to our left. By staying left we avoided using our crampons and also didn’t feel the need to pull out the rope and glacier gear. 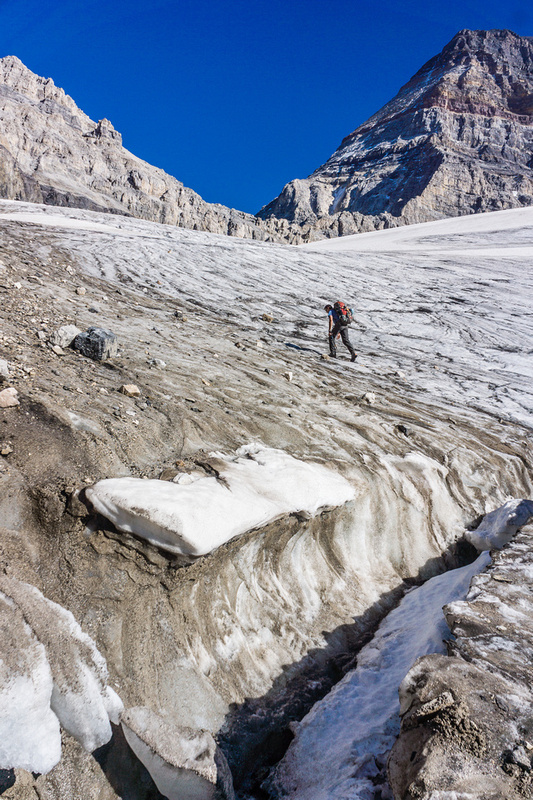 The glacier was mostly bare ice and we have experience on Rockies glaciers therefore you should not just assume you don’t need a rope for this glacier – you may have very different conditions and experience than us so please act accordingly. Assiniboine Lake is gorgeous! We have to go around on climber’s right and then up the large scree slope up to the right side of the photo on lighter scree. 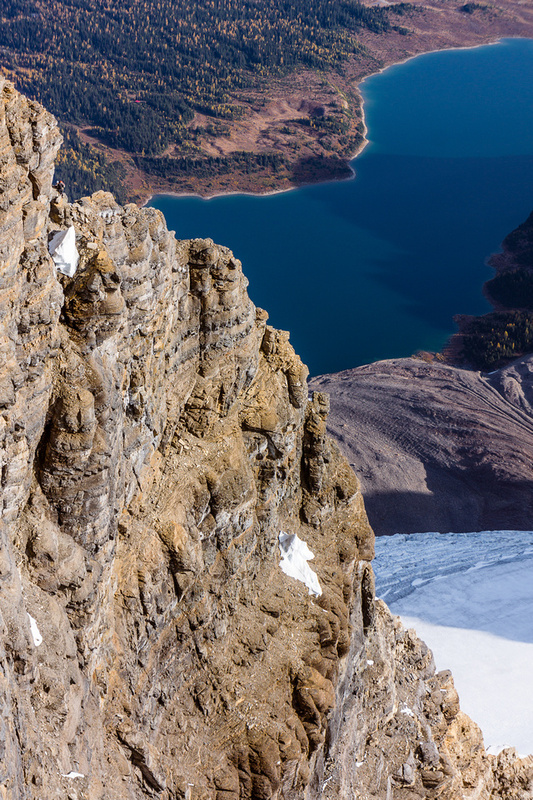 Looking towards the Sturdee Glacier with Mount Assiniboine looking impressive rising on the right. After crossing the glacier we had a horrible grunt on really ugly scree to the Strom / Assiniboine col. Our packs were starting to feel heavy at this point. 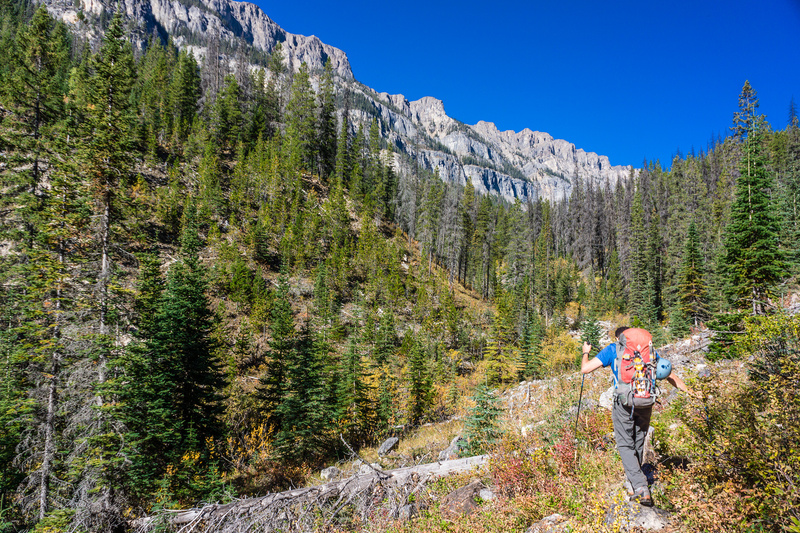 As I glanced over at the enormous north face of big ‘A’, my pack felt even more weighty. The hut was nestled on a ledge beneath us and we both realized how awesome it was going to be to sleep on a nice mattress instead of a bivy. But there was something else calling my name first – Mount Strom was only about 500 feet above us on fairly benign terrain. I suggested we go bag it “while we’re here anyway” and to my delight, Kev was all-in. I guess we are both peak baggers at heart. 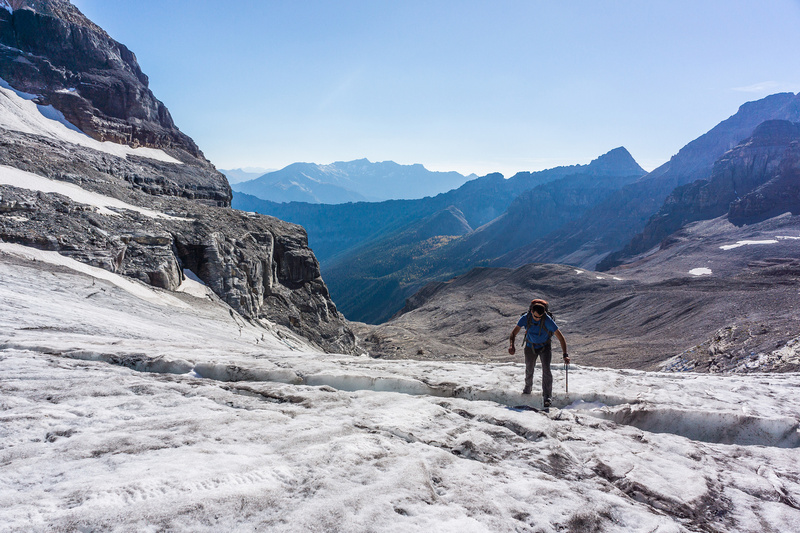 Kev on the rather tame glacier – but still big enough holes to swallow you if snow covered. 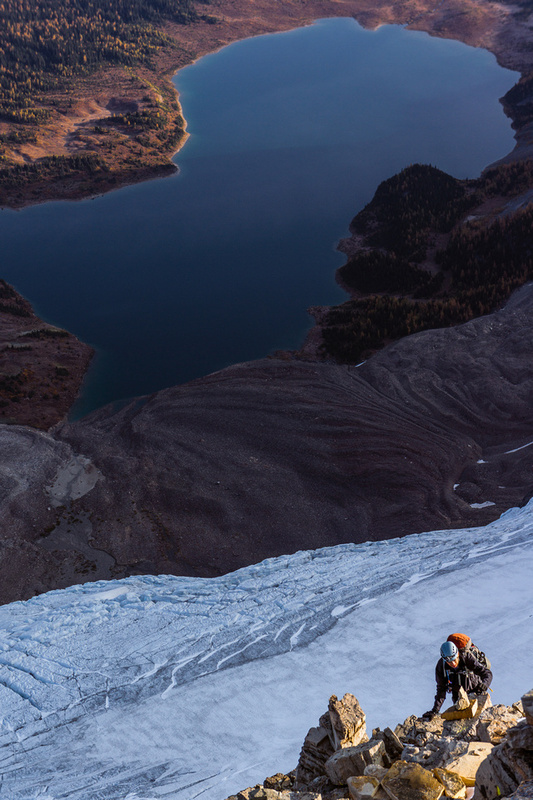 You can pretty much completely avoid the glacier on climber’s left though. 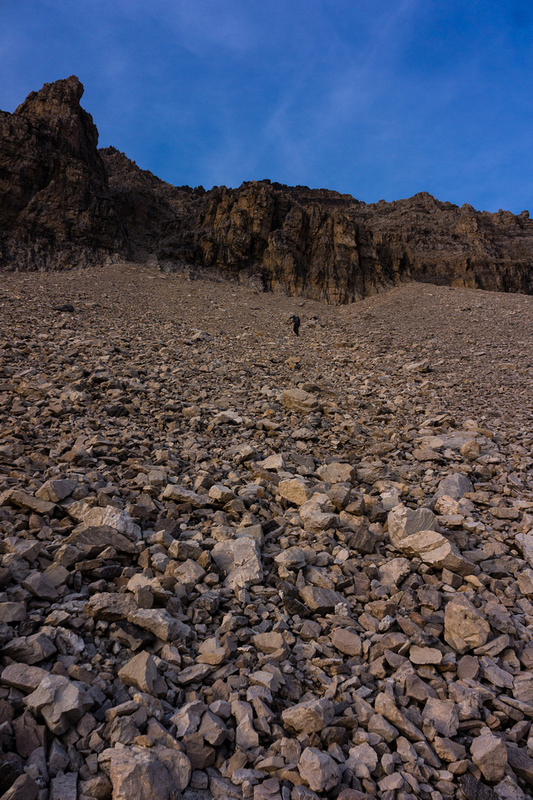 Brutally loose scree slopes from the Sturdee Glacier to the Strom / Assiniboine col.
Only twenty minutes later and we were snapping photos from our impromptu summit and soon we were headed back down – we needed food and sleep! 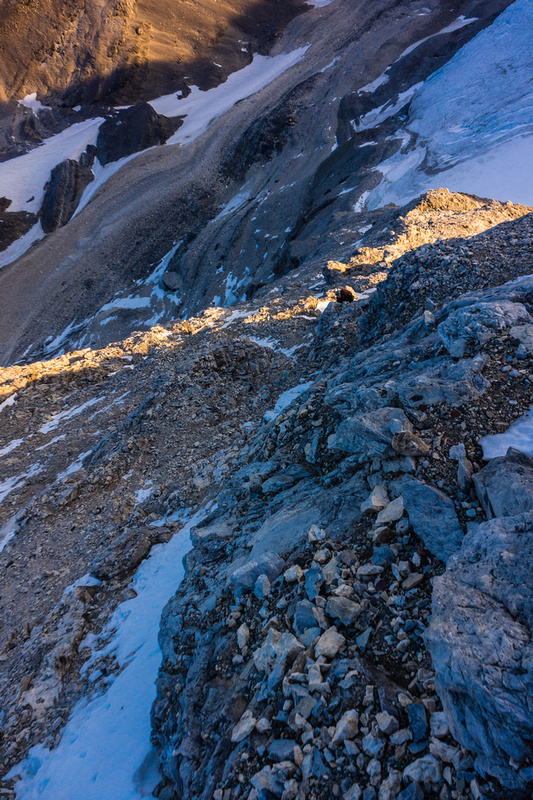 Another scree grunt to the summit of Mount Strom. 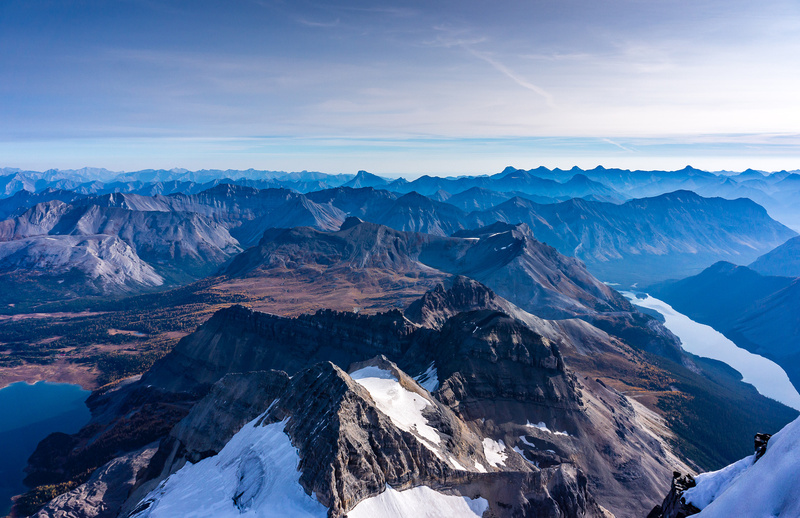 Looking over the Sturdee / Assiniboine col towards Mount Aye at right. 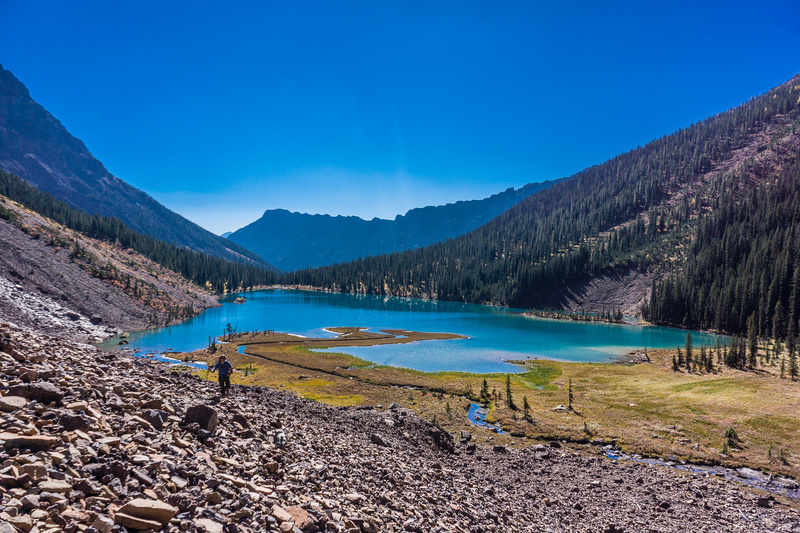 Wedgewood Lake at left, mountain at right with Indian Peak, Ferro Pass, Simpson Ridge, Nestor Peak and The Nub in between. 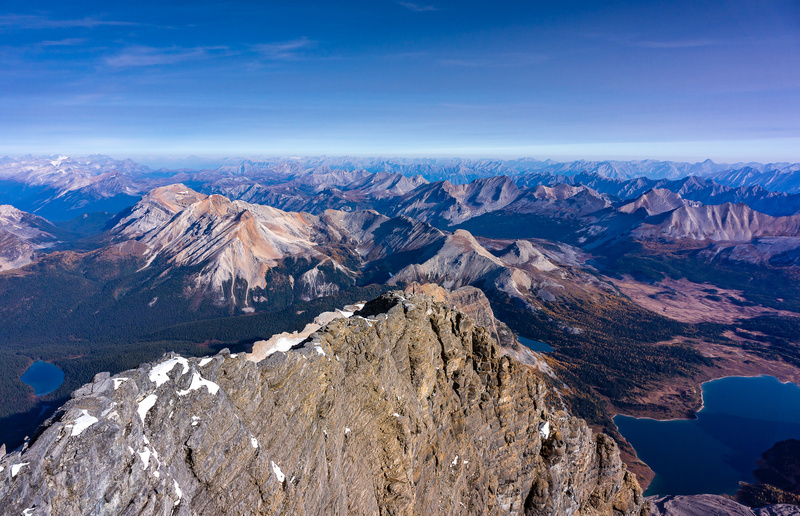 Wedgewood, Magog and Assiniboine from the summit of Mount Strom. We reached the hut around supper time, a 5.5 hour approach not including the push for Strom. 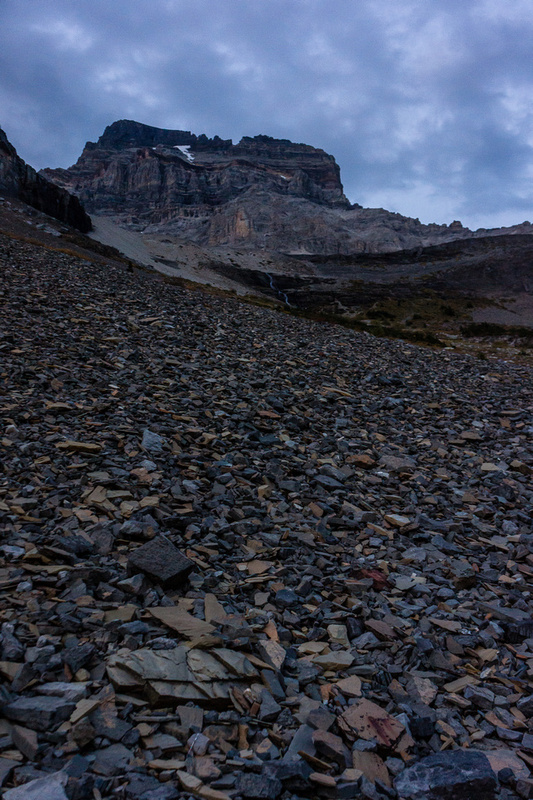 The hut was quiet and empty, we had the mighty Mount Assiniboine all to ourselves. This is not normal and is very rare – especially in the weather and conditions we were experiencing. The air was still and the north face was catching the warm afternoon sun and looked very snow and ice free. At this point I felt very confident of the climb and felt no nerves at all for the remainder of the night. Kev traverses a snow patch towards the Hind Hut just visible in shadows above him. 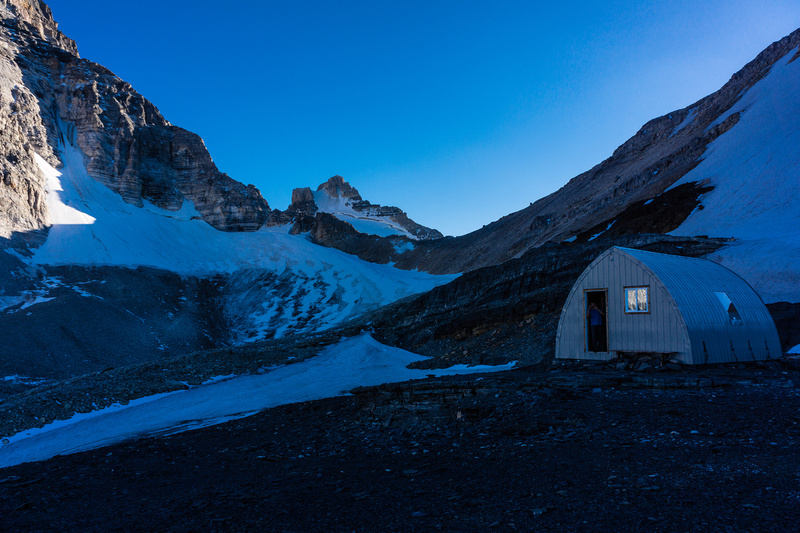 The Hind hut is an awesome way to spend the night before a climb – especially on the third weekend in September when it’s completely empty! 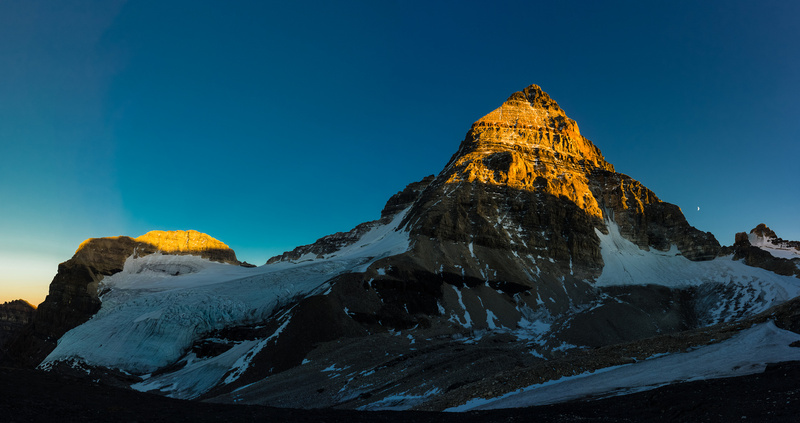 Mount Assiniboine with the moon as the sun sets. Our route goes up the ridge trending to skyline left from bottom left. I was excited but not at all nervous. I felt like I had a date with the mountain and was confident it would go very well. 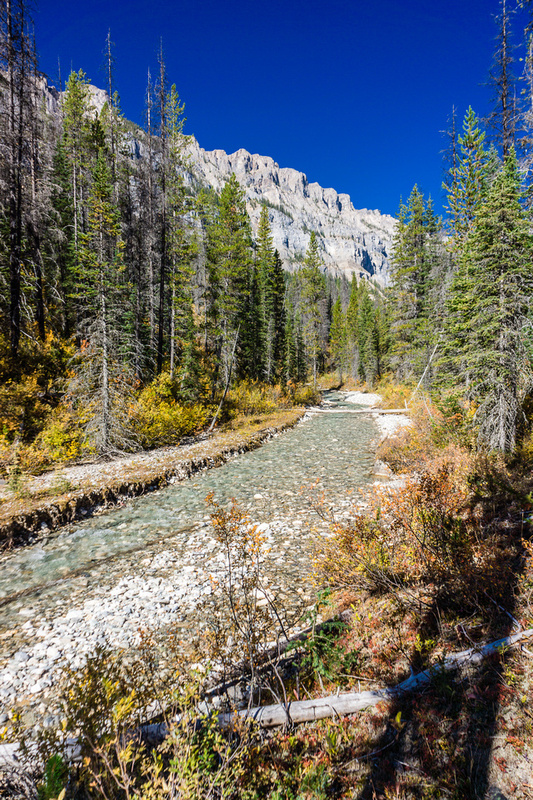 Driving up the Aurora Creek road towards Aye and Eon. The Aurora Creek road is much smaller than Settlers Road. The registration box at the Aurora Creek trailhead. This log was interesting to cross about 34 hours later in the dark... 😉 Thank goodness for the wire though - it certainly makes it easier. 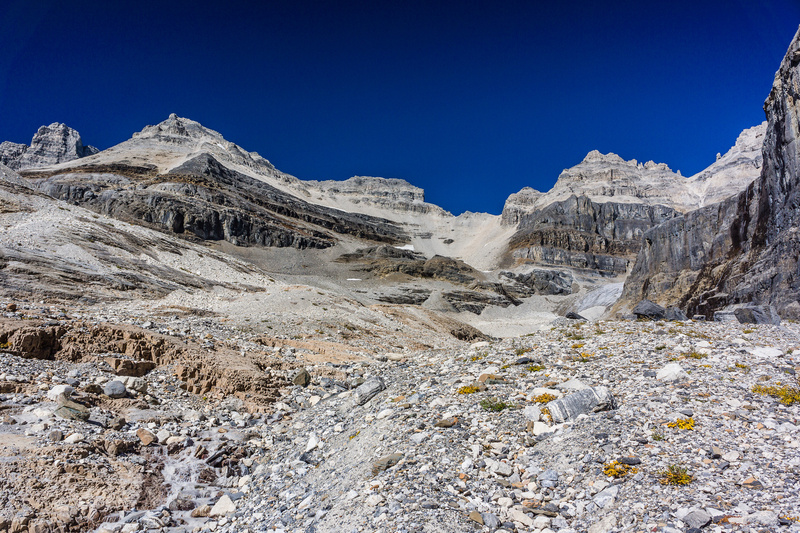 The mighty "A" reveals her SW side as we round the trail towards Assiniboine Lake. 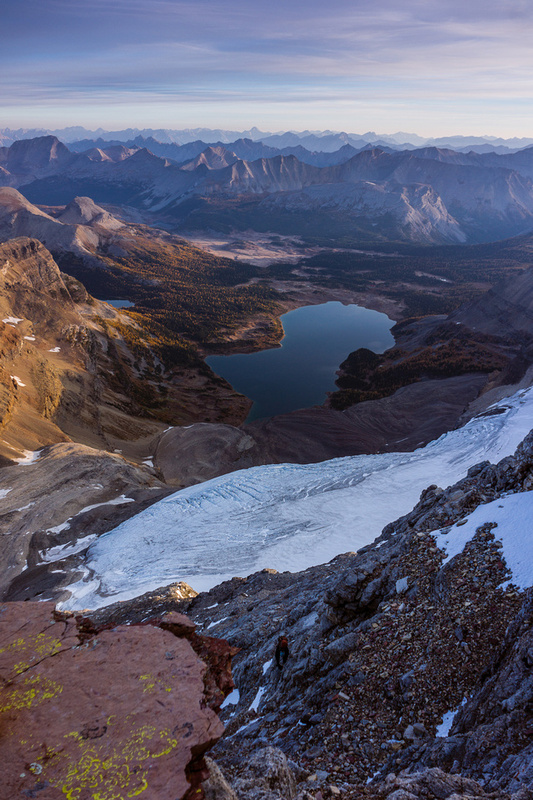 Assiniboine on the left and Lunette on the right. 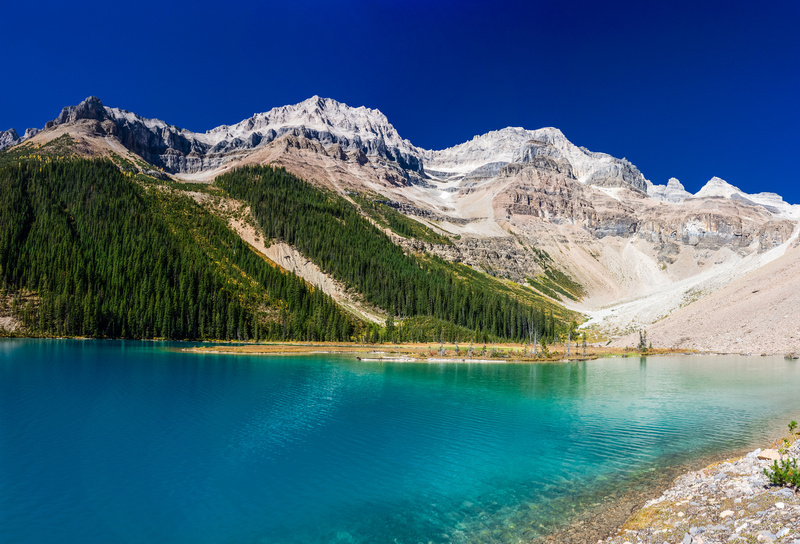 Assiniboine Lake is gorgeous! 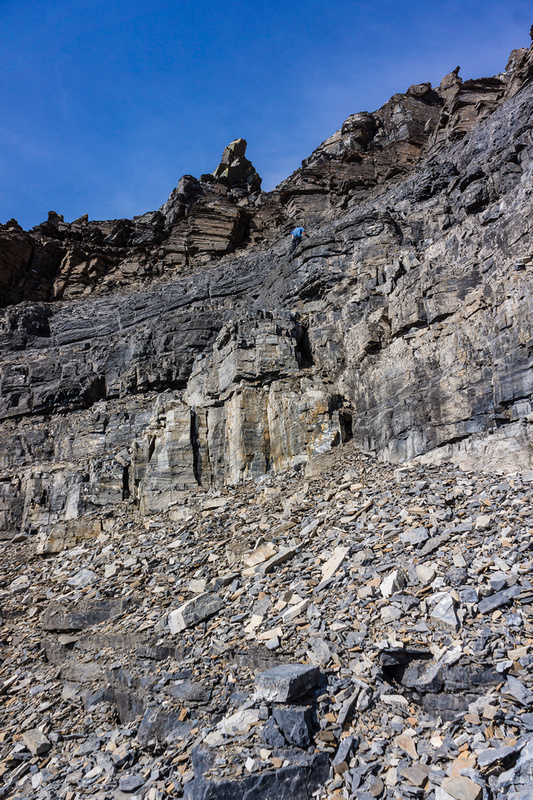 We have to go around on climber's right and then up the large scree slope up to the right side of the photo on lighter scree. Kev comes up behind me as we leave Assiniboine Lake. Looking ahead to a nice scree grunt! We go right of the buttress right of center on light colored scree. 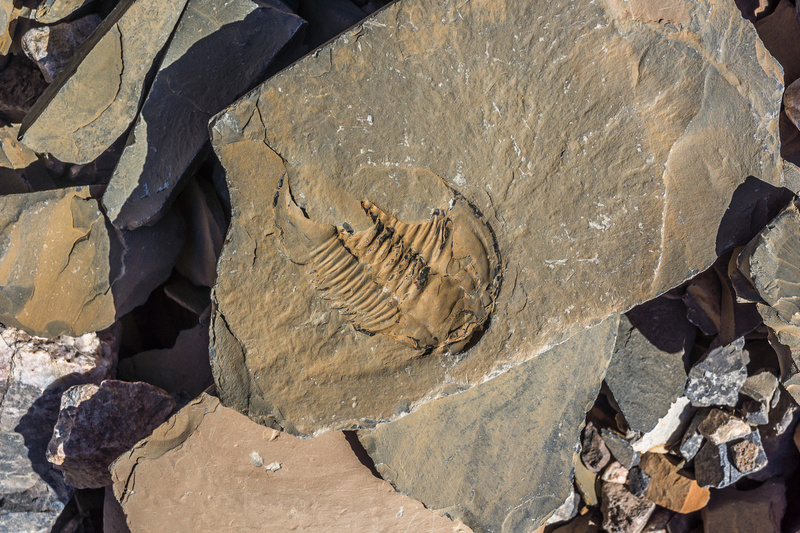 A pretty big fossil - this one was the size of my fist. 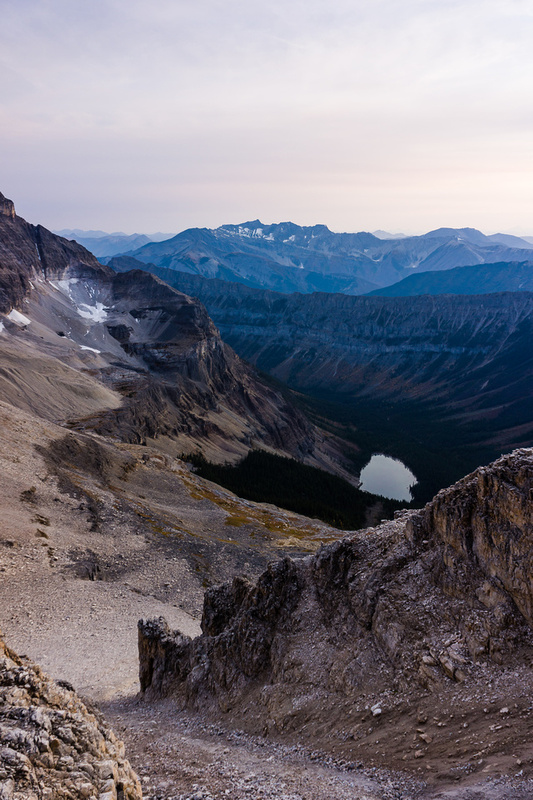 Another glance back at Assiniboine Lake from near the buttress. 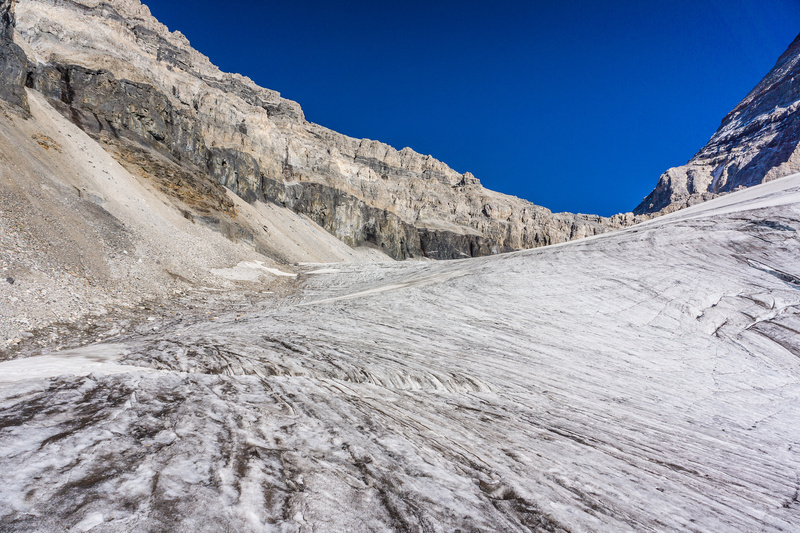 Loose slopes to the Sturdee Glacier. 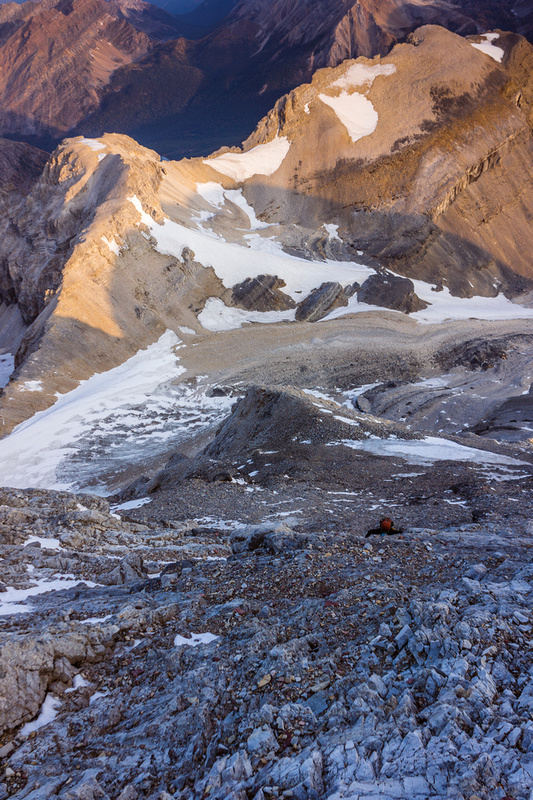 Looking towards the Sturdee Glacier with the might "A" looking impressive rising on the right. Looking back as we approach the glacier. We came from the lower left. Starting up the Sturdee Glacier. Kev jumps a small crevasse. 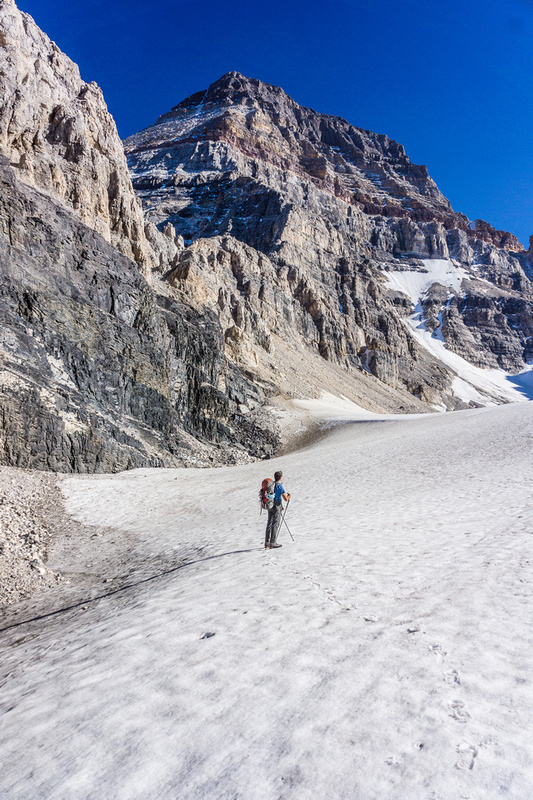 The hulking mass of Assiniboine is hard to miss as we continue up the glacier. Kev on the rather tame glacier - but still big enough holes to swallow you if snow covered. 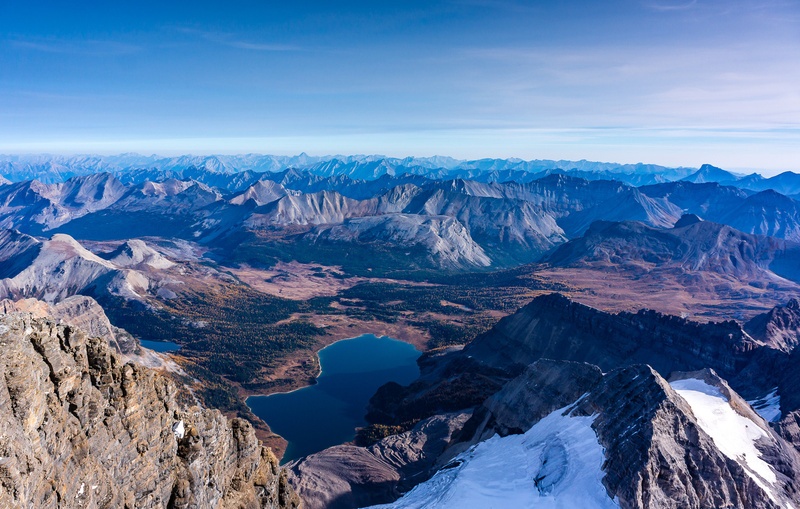 Assiniboine on the left and Sturdee on the right. 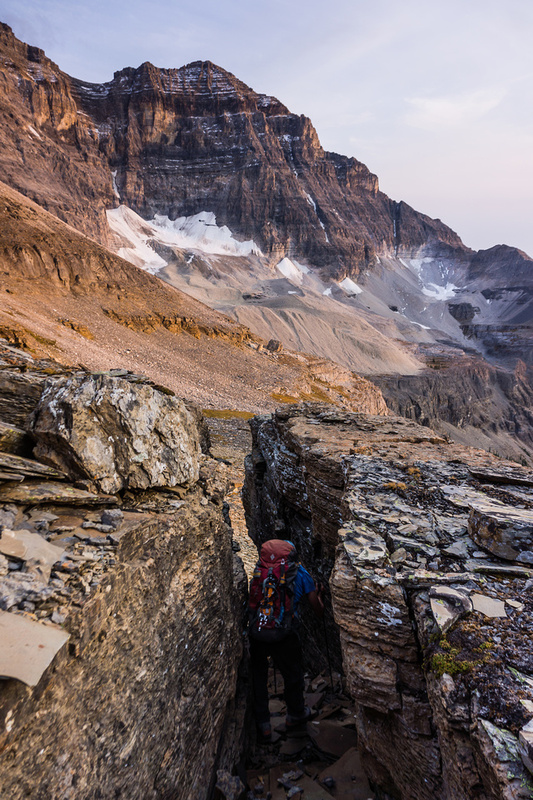 We access the Assiniboine / Strom col on the left. Loose slopes to the Strom / Assiniboine col.
View from the Strom (left) and Assiniboine (right) col looking towards Lake Magog (center). The hut is just left of the lake, obviously much higher on the scree bench. View of Strom from the col.
View of Lake Magog and the Assiniboine huts from Strom's south ridge. The Hind hut is also visible in the shadows. Just another darn scree grunt! An old register on Strom - in better shape than a lot of others around here. 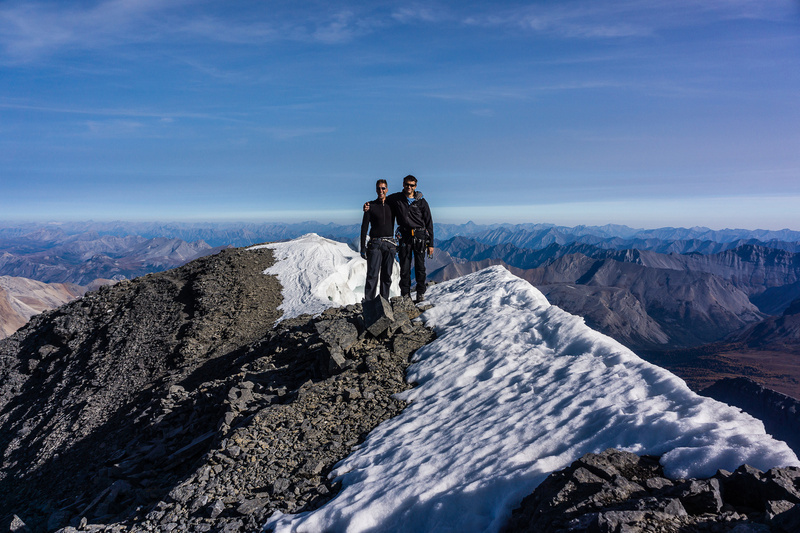 Vern and Kev on the summit of Strom with Assiniboine looming over 600 meters (2000 feet) above us. 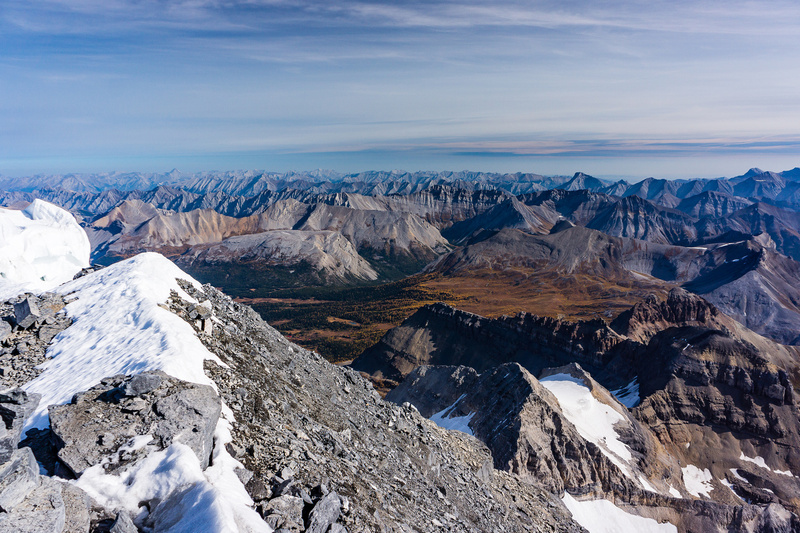 Looking over the Sturdee / Assiniboine col with Aye Mountain at right. 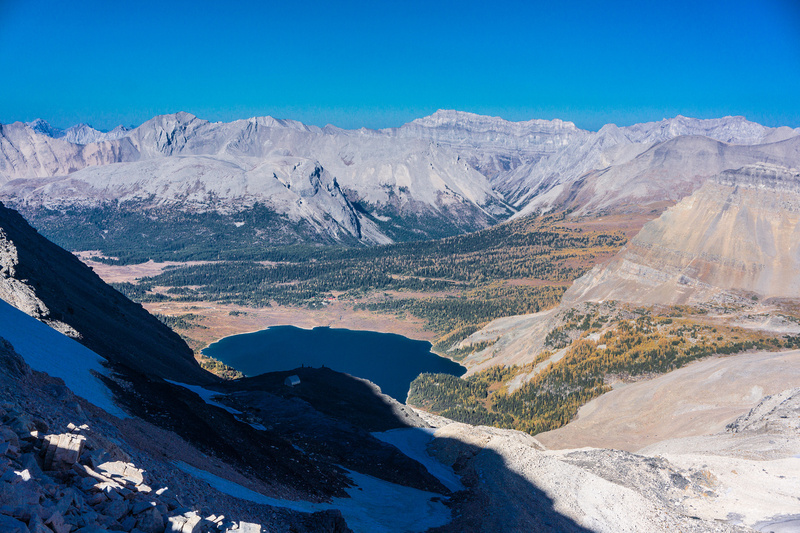 Looking past Wedgewood Peak and Lake to Nestor, Simpson with Indian Peak at left over Ferro Pass. 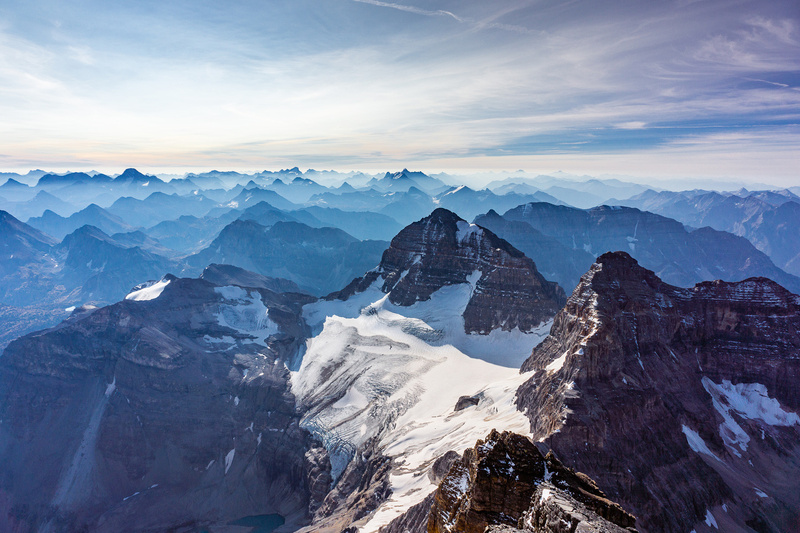 Wedgewood, Magog and Assiniboine from L to R.
Impressive views of Mount Assiniboine with Magog at left. Kev heads down the slopes to the col, Assiniboine brooding above. Looking over Lake Magog from near the Hind Hut. The Gmoser Highway route comes in from straight in front of me here - the opposite direction of our approach. 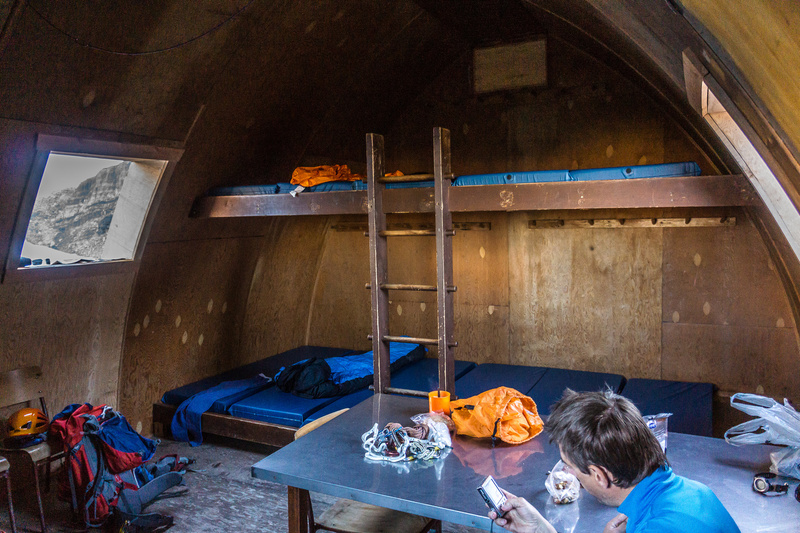 The Hind hut is an awesome way to spend the night before a climb - especially on the third weekend in September when it's completely empty! 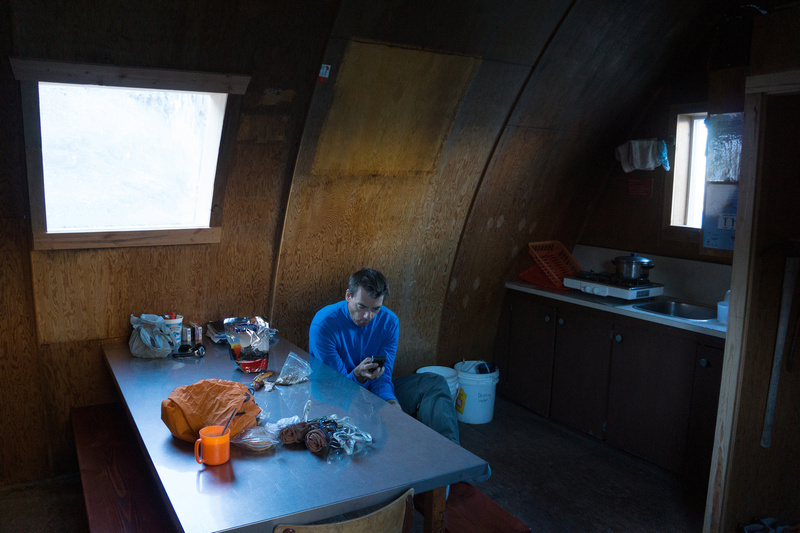 Inside the cozy - and empty - Hind Hut. We woke at 05:00 and choked down some coffee and breakfast before heading out in the darkness with full packs and no idea where the approach trail was! 😉 Once we were halfway to the ridge I finally located the beaten trail (we were too far climbers left) and we followed that trail via headlamp to the ridge. What followed was the most delightful climb of my life. 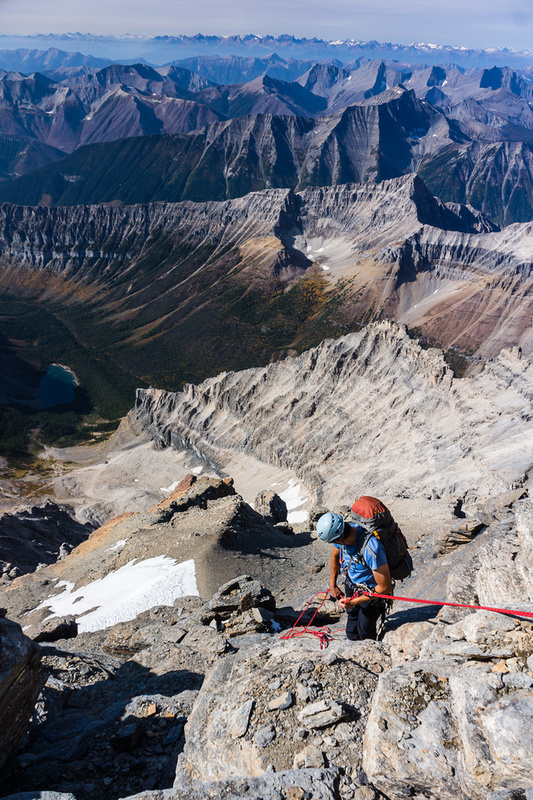 Under a brilliant rising sun and a clear, calm fall day we tackled the NE ridge head on. Up to the red band we found the route fairly benign – maybe moderate to difficult scrambling. 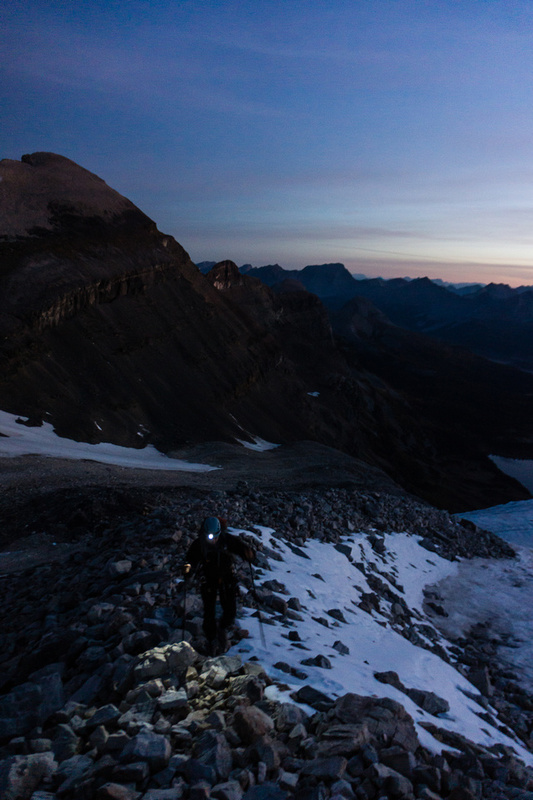 Kev climbing via headlamp on the lower north ridge. The lower north ridge is scrambling. Lots of loose rock here though! Sunrise on The Marshall, Strom, Indian and Wedgewood. At the red band things got a bit more serious. Still mostly difficult scrambling I could see how any ice or snow could quickly make things very spicy on this steep section. 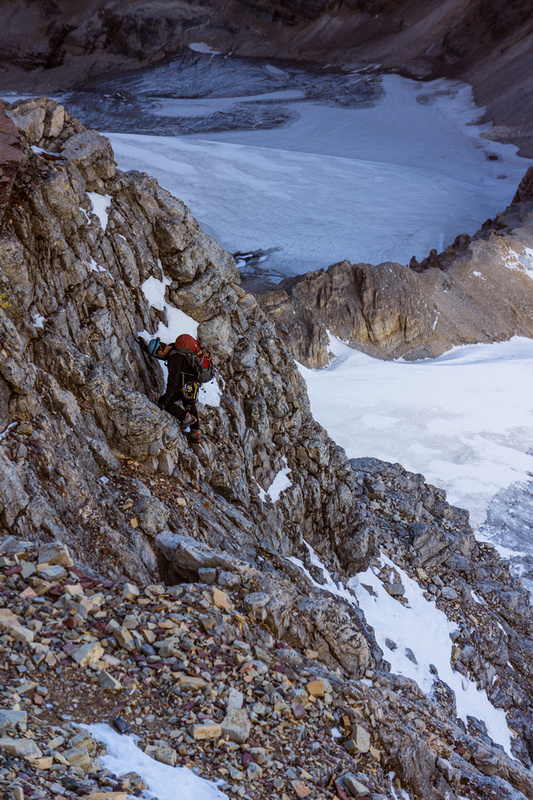 We made our way up the north face more than the ridge at first and in order to break through the red band and then traversed immediately climbers left, back onto the ridge where the climbing was exhilarating. Getting steeper just under the red band. Obvious signs that we’re entering the red band as Kev works his way up beneath me. 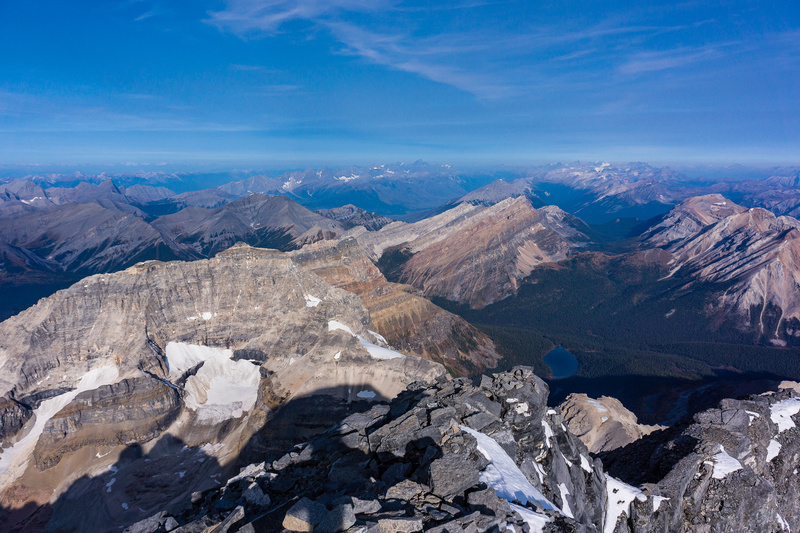 The east face exposure on our left took my breath away as I climbed higher and higher – I felt so alive, the exposure making it necessary to concentrate on nothing other than my immediate environment – the cool breeze on my skin, the call of a bird circling beneath and the still warmth of the sun on my face… awesome. 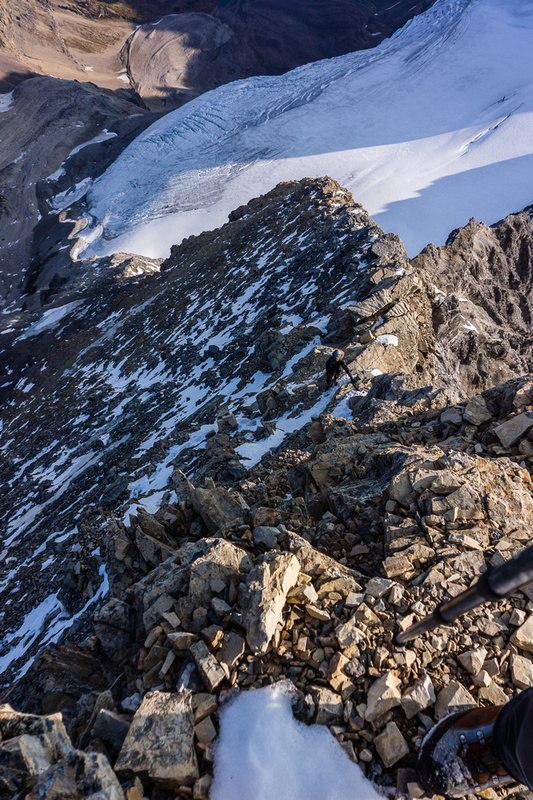 Kev coming up to the red band on steeper – but firmer, terrain climber’s right off the ridge proper. 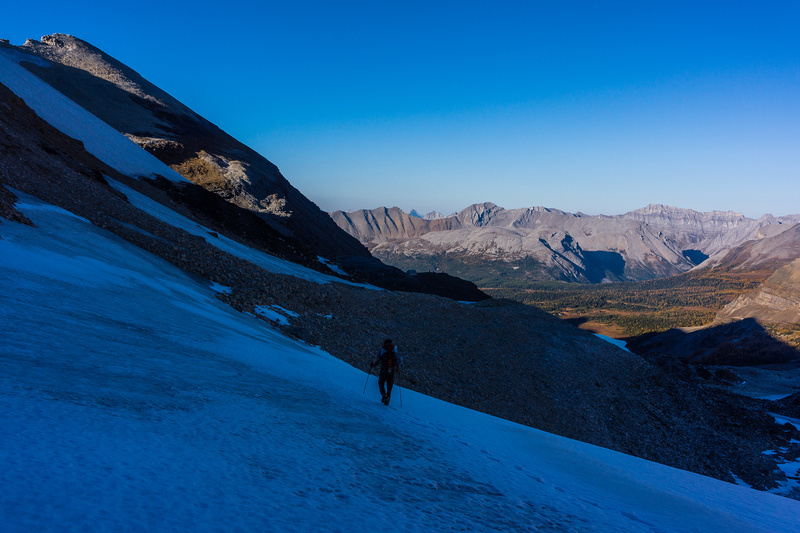 Right after the red band we traversed climber’s left (trail / cairns) to tackle the NE ridge head-on. This led to the most fun and most exposed climbing of the day. 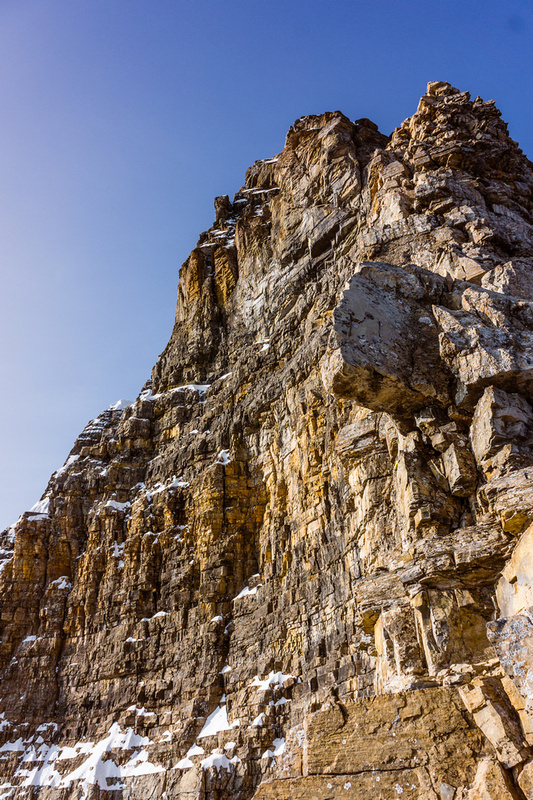 The east face of Assiniboine is steep and scary. Gloria and Eon at mid distance with Sir Douglas, Joffre and King George rising through forest fire smoke in the distance. The grey band came too quickly but I wasn’t even 100% sure I was in it until I was above it and looking over at the summit above. I still had some seriously exposed terrain left but it looked solid and fun. I think I may have found a way around the grey band 5.5 crux by traversing a slight overhang on climbers right before climbing through a nice chimney with good holds. 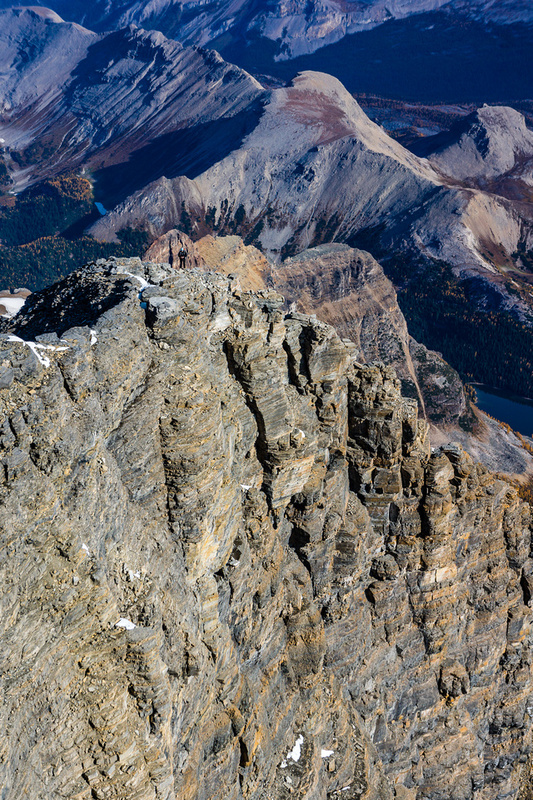 The spectacular east face of Assiniboine as seen from the NE ridge. Note the excellent, blocky climbing on the ridge. Another shot showing how steep and exposed the ridge is getting. 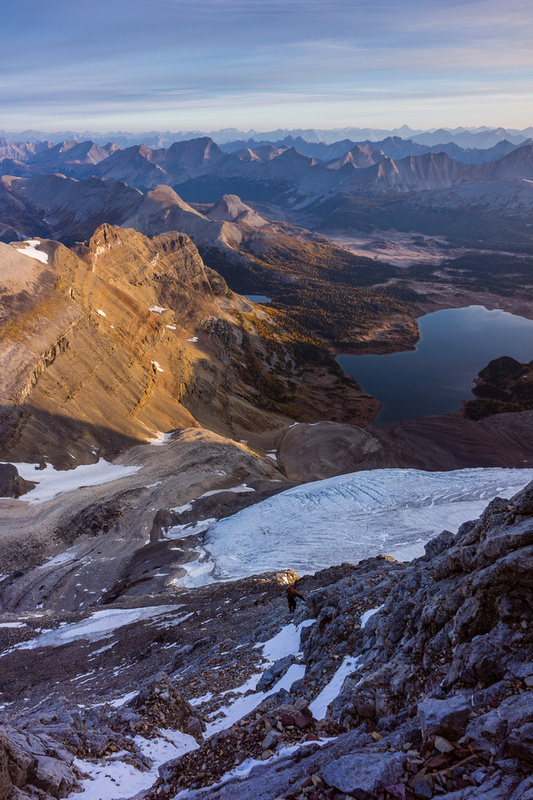 One of my favorite pano’s from all my climbs – looking across the east face / ridge of Assiniboine at a smoky morning sunrise. Kev was behind me and didn’t immediately find my alternate route. He wanted a belay up the other route but I convinced him to try mine and he solo’d it no problem. Kev doesn’t think we did anything harder than 5.4 so maybe we somehow avoided the 5.5 crux or our perfect conditions just made it seem easier. I don’t care either way. 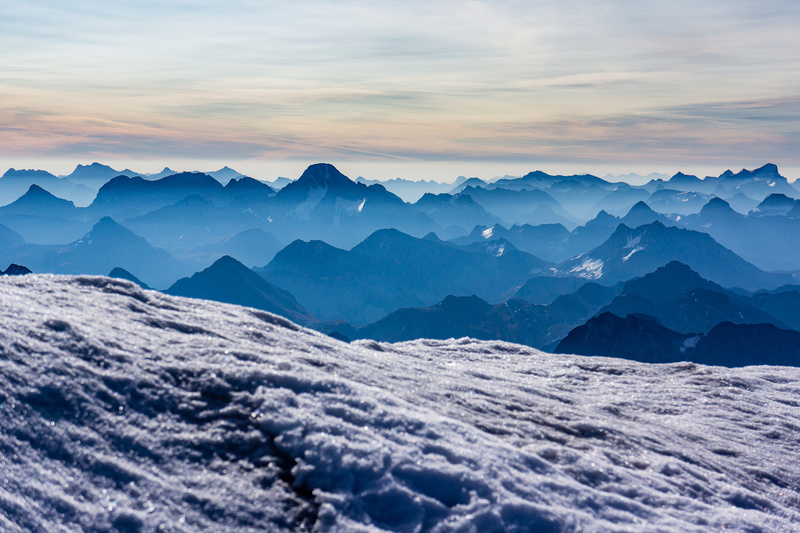 It was one of the best mornings of my life climbing that ridge in those delightful conditions. The climbing gets exposed and fun! 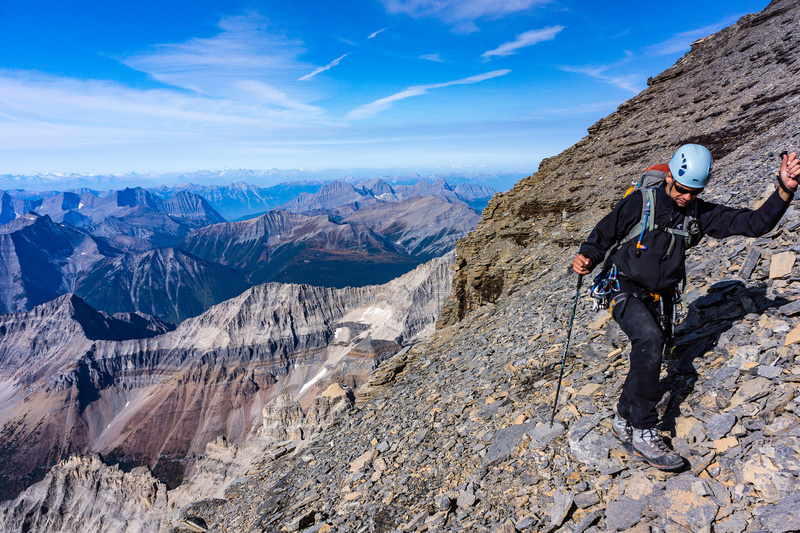 It took us just under 4 hours to climb Assiniboine – with our not-so-light alpine packs. We had perfect conditions. 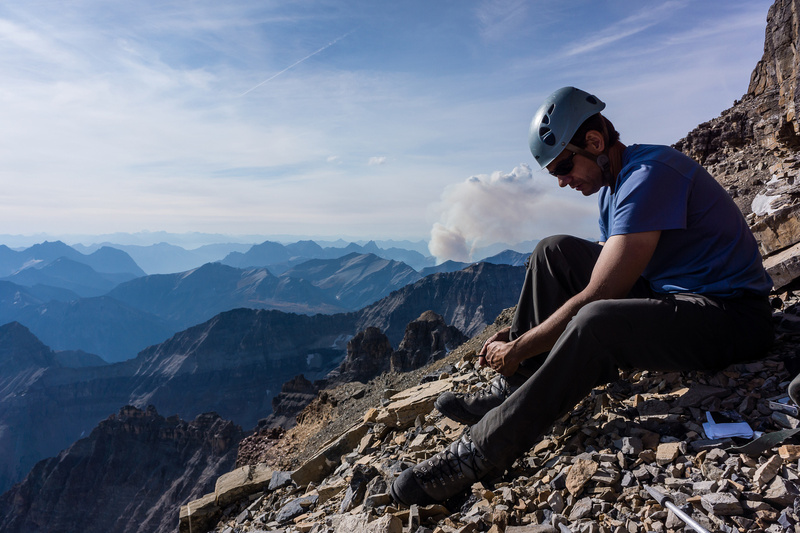 We spent almost an hour at the summit with absolutely no wind and no extra clothing – I climbed in a single layer merino long sleeve tee and was almost too warm. 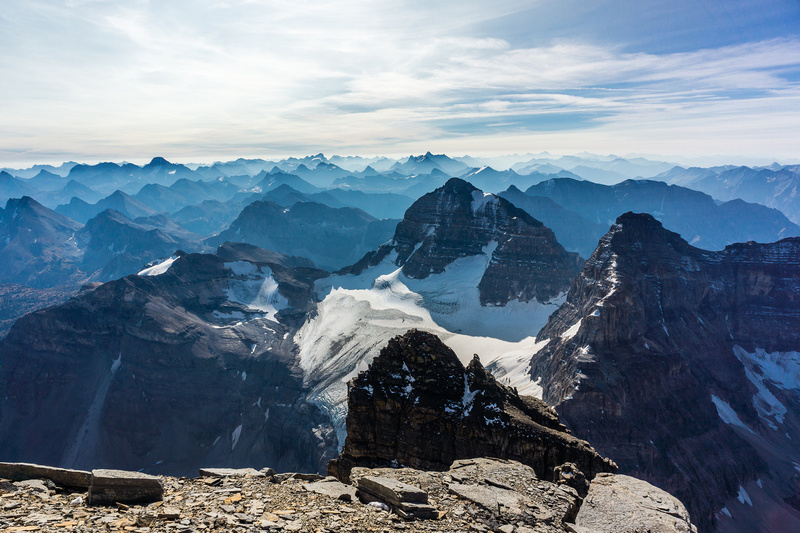 The summit of Mount Assiniboine is finally in reach after dreaming of it for many years. 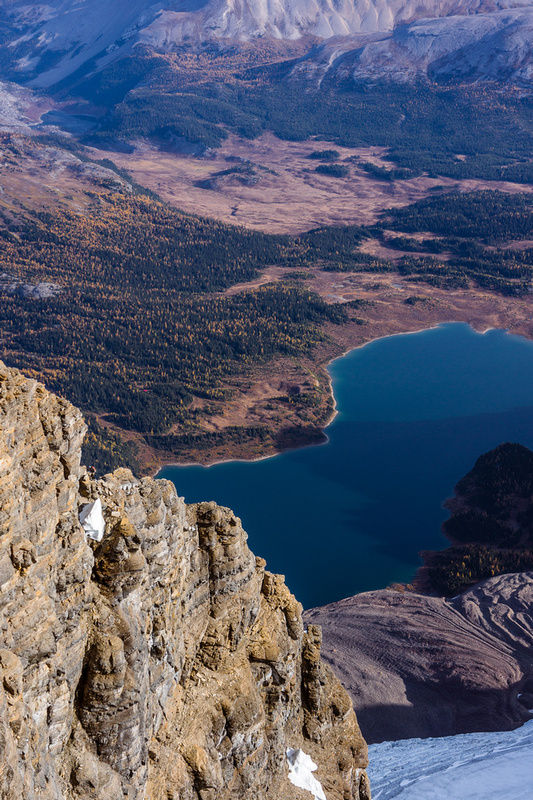 Fantastic exposure down the east face with Lake Magog far below. Find Kev working his way up through the grey band. The final few steps to the summit of the “BIG A”! The views in all directions were mind blowing and we were enjoying it all by ourselves. 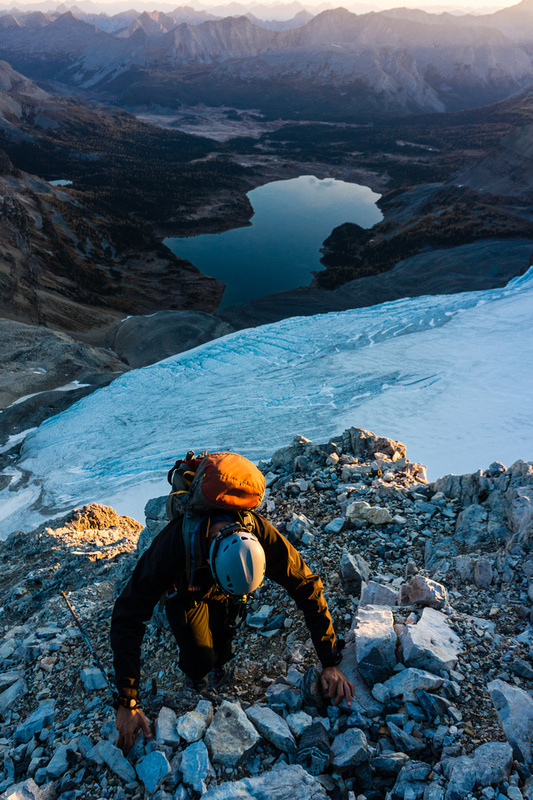 No snow or ice impeded our efforts on the ascent – what little there was could be easily avoided. 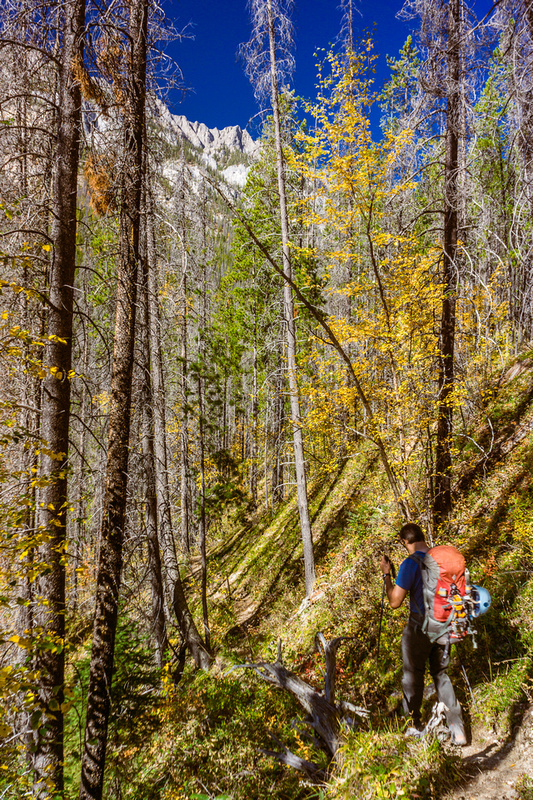 We were so incredibly lucky to enjoy such a grand summit on an amazing fall day late in the climbing season. I’ll never forget it. A smoky morning haze to the south. Nothing higher than us. Sir Douglas on the left, Joffre at center and King George at right. 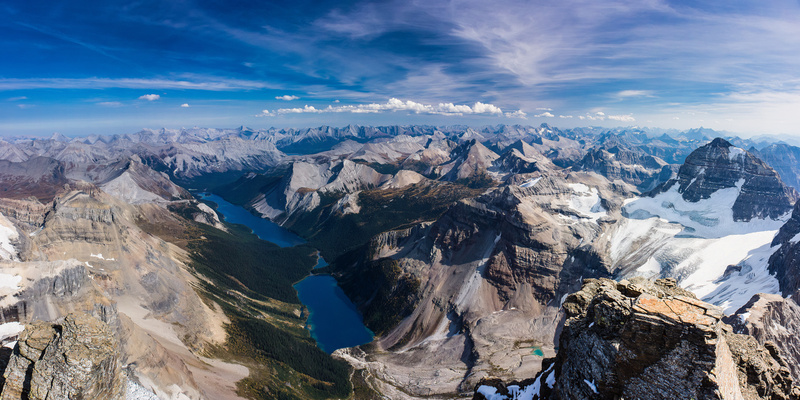 Views over the core Assiniboine area include L to R, Wedgewood Lake, Ferro Pass, Simpson Ridge / Peak, Nestor Peak, Fatigue, Golden, The Nub, Nasswald, Wonder, The Cave, Allenby, Lake Magog, Cautley, Naiset, The Towers, Wonder, Terrapin, Magog and many others further in the distance. 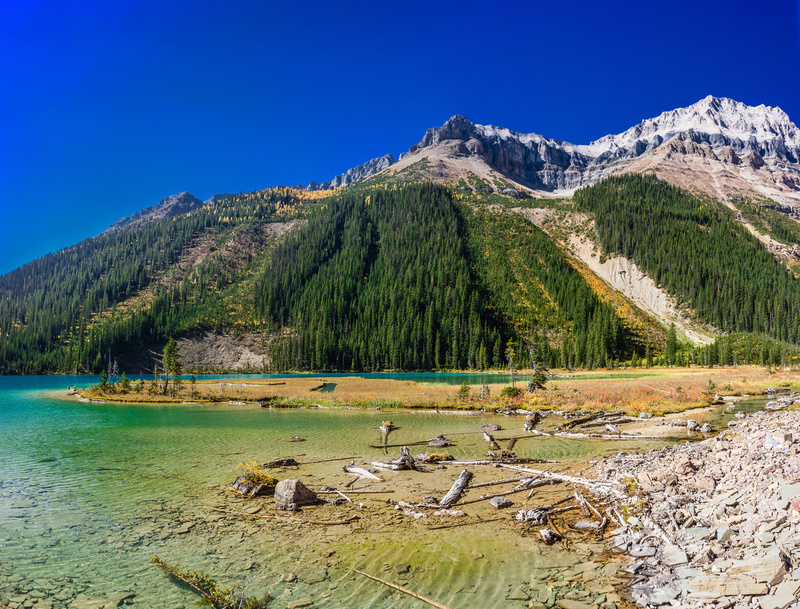 Views over Gloria Lake, Terrapin Lake and Marvel Lake towards Cone Mountain with many Kananaskis Peaks beyond. 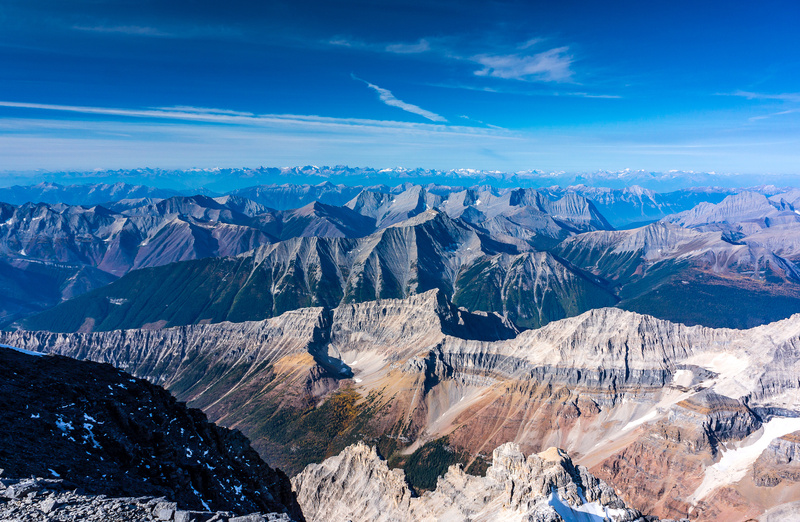 Mount Gloria at right with Marvel, Byng, Currie, Morrison and Turner beyond at mid right. Terrapin, The Towers, Naiset, Wonder and Cautley at mid left. 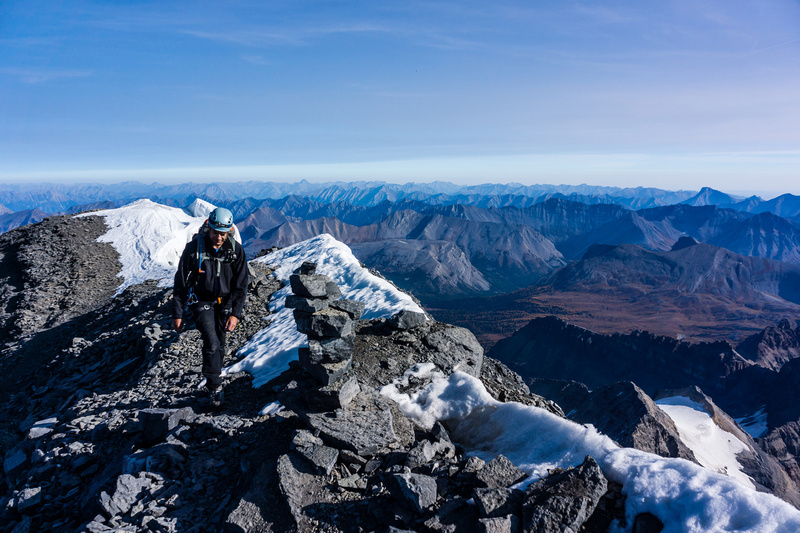 After snapping many photographs of familiar and unfamiliar peaks all around the “big A”, we turned our attention to our next objective – Lunette Peak. This would prove to be a much harder and longer day than we were expecting at this point. 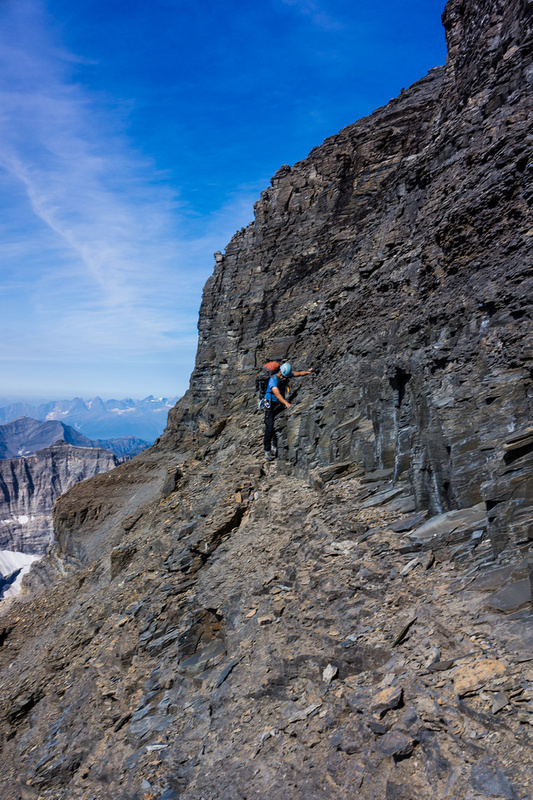 As it turned out, climbing the northeast ridge of Assiniboine is much more straightforward and even ‘easy’ in good conditions, than descending the SW face with a side trip up Lunette, especially if you are descending it ‘blind’ – i.e. not ascending it first. 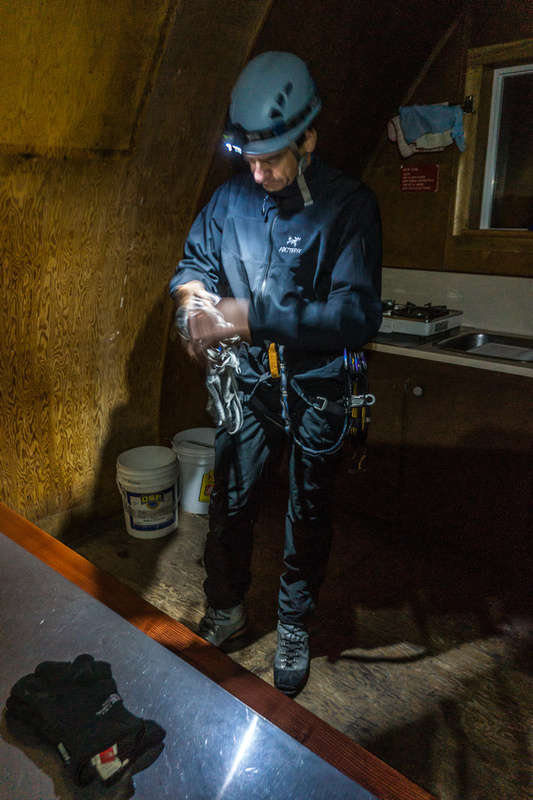 Kev gets ready for our climb in the Hind Hut. 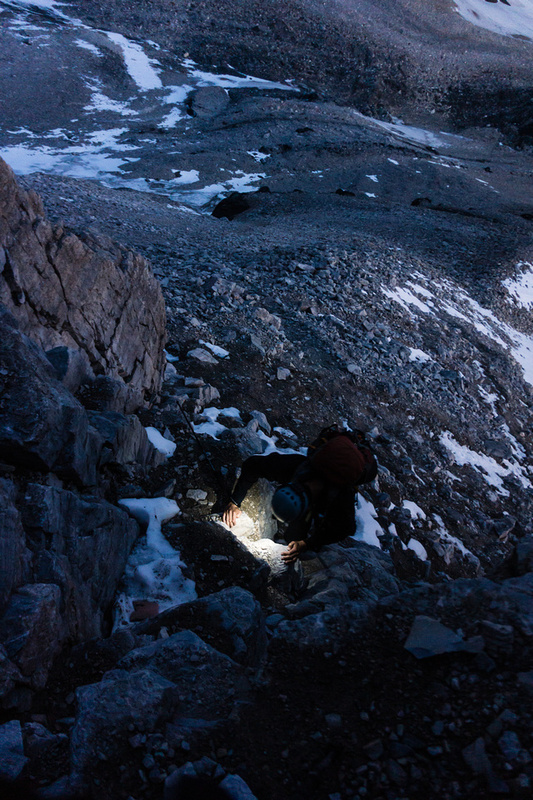 Kev climbing via headlamp on the lower ridge. Looking up the northeast ridge - it looks steep! Alpine glow over The Marshall, Mount Strom the Hind Hut and Wedgwood (L to R). Climbing the lower ridge beneath the red band. Sunrise over the Assiniboine area. You can start to see the red band now, on the upper part of this photo. Looking over Lake Magog as the sun continues to rise. Kev on the lower north ridge with Sunburst, The Nub, Golden, Nasswald, Wonder and Cave Mountain. 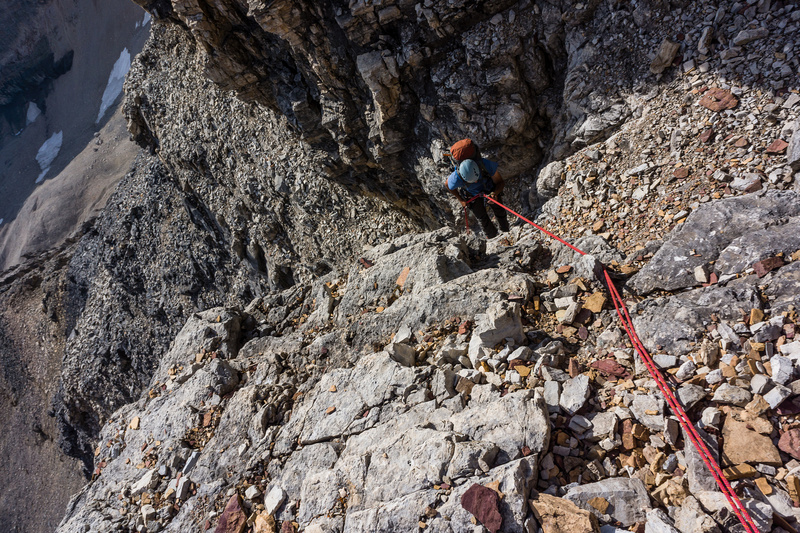 Climbing to the red band on the north ridge of Assiniboine. 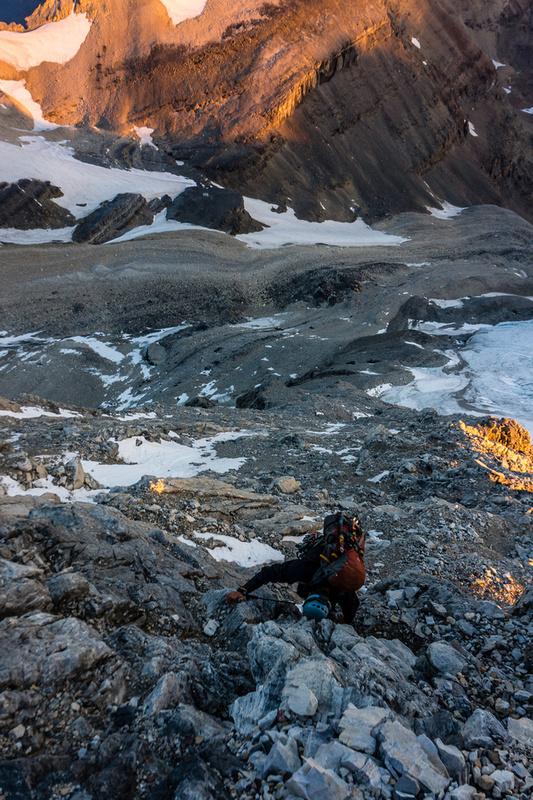 Climbing through the red band - the north ridge steepens here. Views include The Marshall, Strom, Indian, Nestor, Wedgewood, Sunburst, The Nub and Lake Magog. Lots of rappel stations start showing up around the red band. 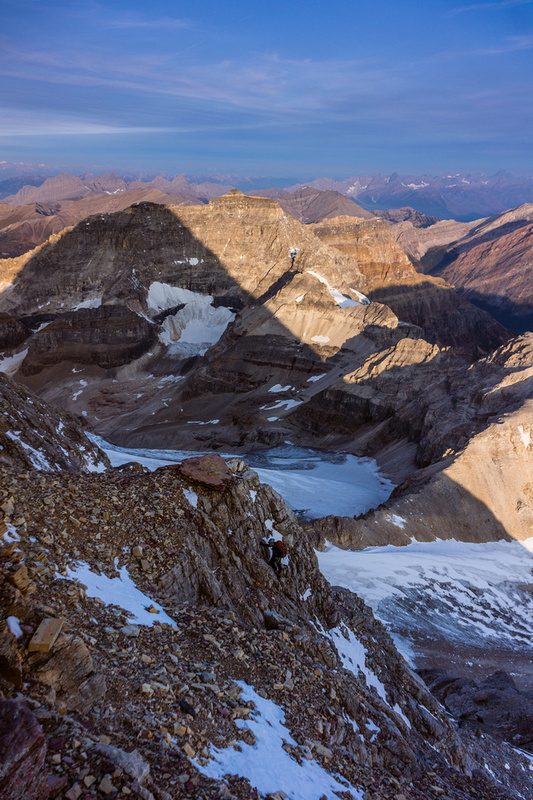 Right after the red band we traversed climber's left (trail / cairns) to tackle the NE ridge head-on. This led to the most fun and most exposed climbing of the day. 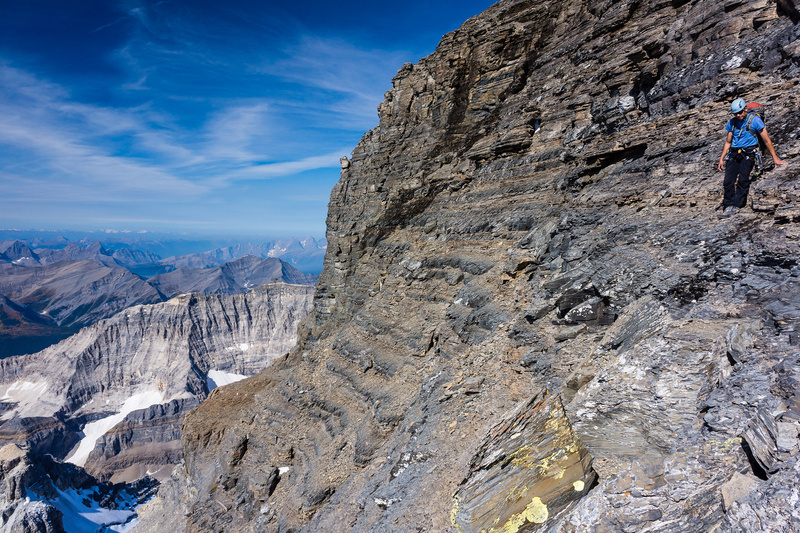 The spectacular east face of Assiniboine as seen from the NE ridge. Mount Gloria at center with Lake Gloria at right and Terrapin much smaller just above it. Looking back at Kev clearing the red band. Climbing the north ridge with the east face at left. Spectacular views across the east face. Lakes Gloria and Marvel on the bottom left. Forest fire smoke from the USA lingers over the ocean of peaks in the distance. Getting much higher than all the surrounding peaks now. 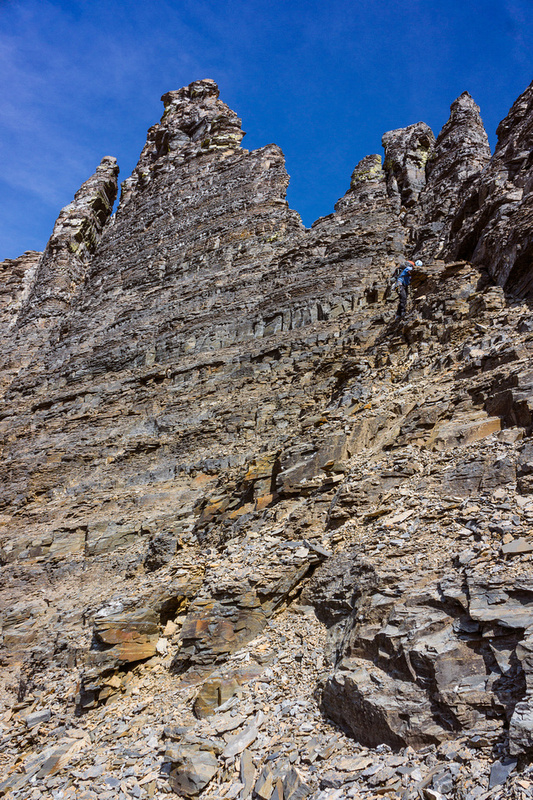 Kev climbs the north ridge of Assiniboine. 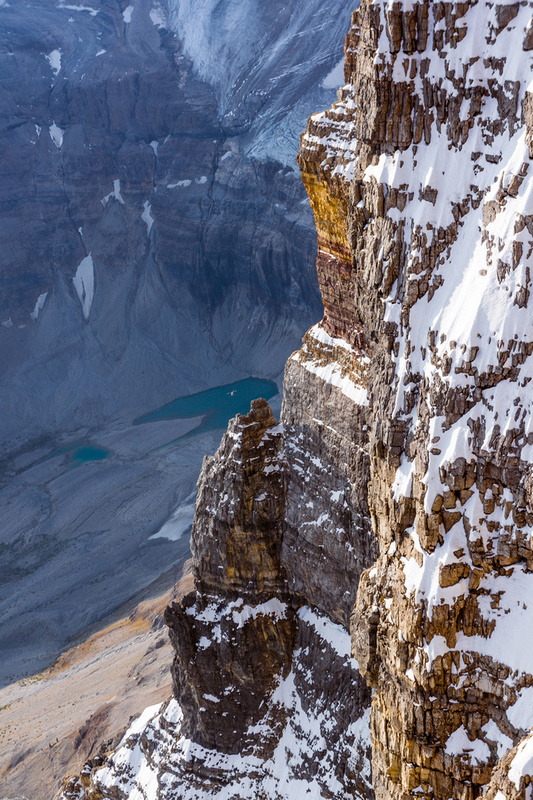 Looking down over the east face of Assiniboine. 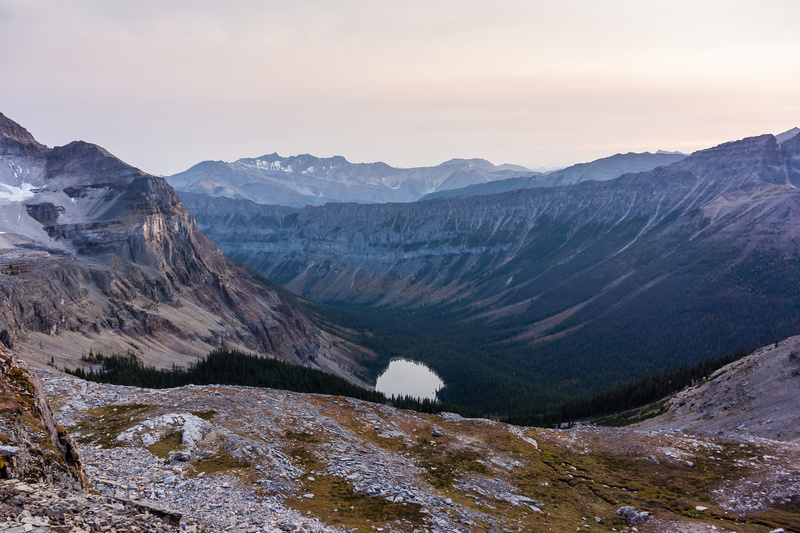 One of my favorite pano's from all my climbs - looking across the east face / ridge of Assiniboine at a smoky morning sunrise. I think the grey band crux is just above here where the ridge steepens considerably. I went right of that bulge and found a way around it up a narrow gully. 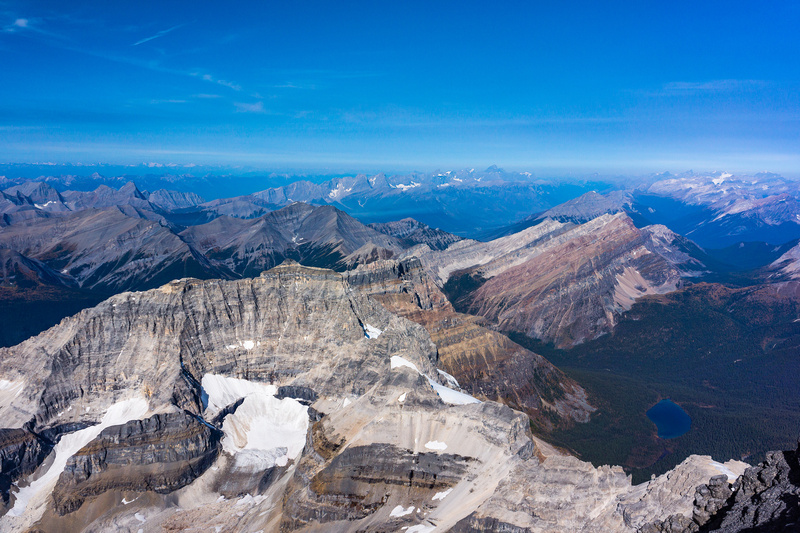 The core Assiniboine area including Wedgewood and Magog Lake, Indian, Nestor, Nub, Cave and Cautley. Kev is tiny on the north ridge. 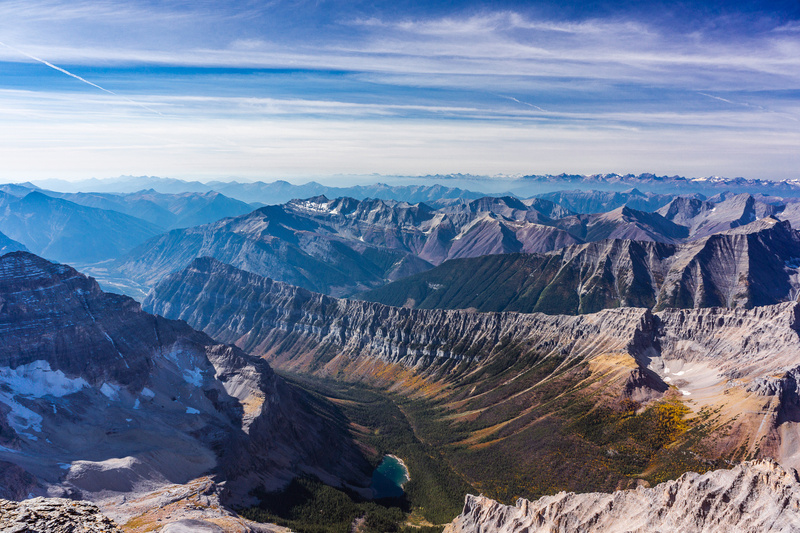 Looking over the Wonder Pass area, including Terrapin, The Towers, Wonder Peak and Mount Cautley. Kev tops out on the ridge in this view from the false summit - barely visible though in the huge terrain. 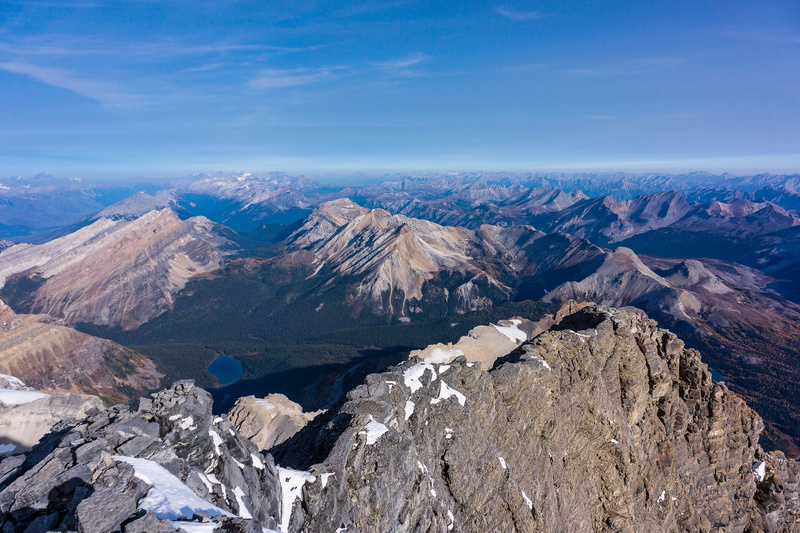 Looking over The Marshall and Watson towards Octopus, Indian, Nestor and Simpson Ridge. Ferro Pass. Octopus and Simpson Ridge at left, Wonder and Terrapin at right. Lots of space up here! View from the false summit looking north and east. The final few steps to the summit of the "BIG A"! Joffre at left and King George at right. Sir Douglas at center left, Joffre at right. 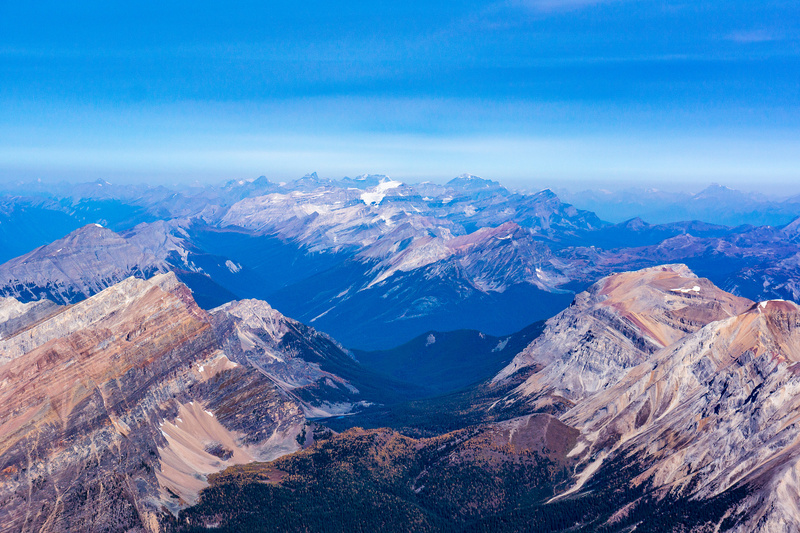 Looking east over Cone towards Nestor, Goat, Lougheed's four summits and Sparrowhawk. 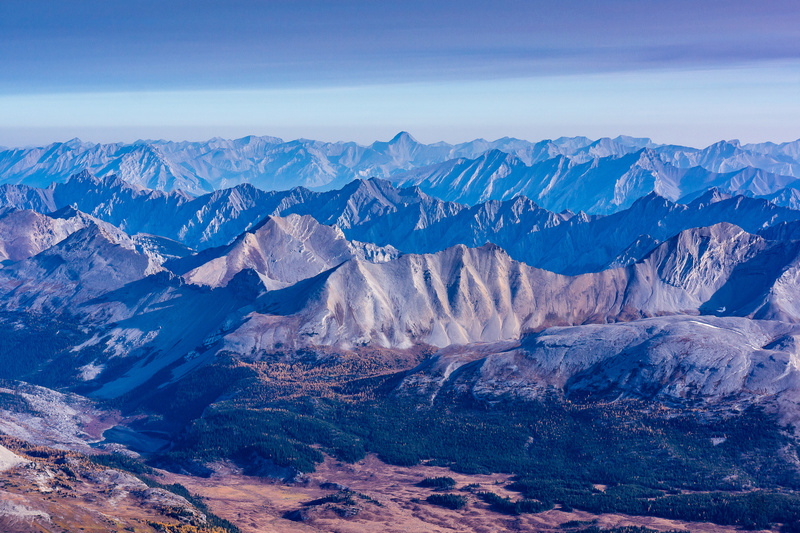 Cave, Og and Allenby with the Sundance Range and even Mount Aylmer visible. Looking over Magog, Terrapin and The Towers to Wonder, Cautley and Turbulent towards Kananaskis. 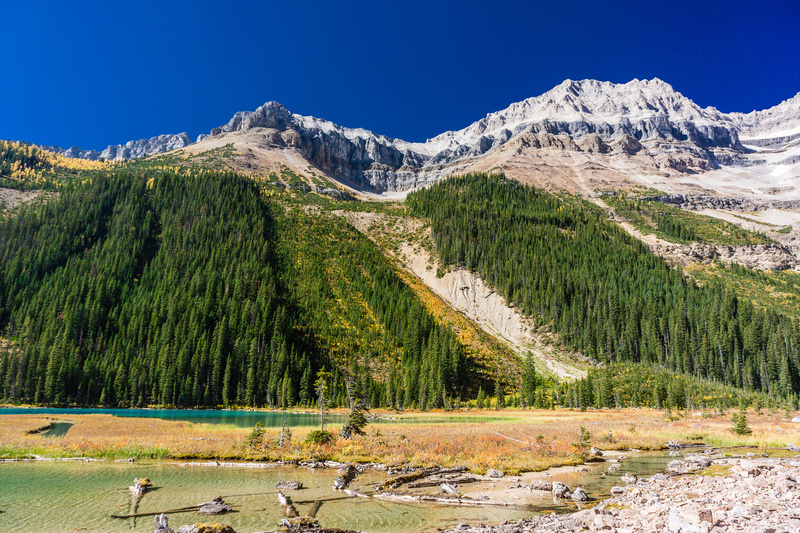 The Lake Magog area with Kananaskis peaks in the distance. The Simpson Ridge runs from Nub Peak at center over Nestor and Simpson Peak to the ridge at left. More stunning views of the core Assiniboine area and Lake Magog. The false summit affords great views of Lake Magog - note the bright red roof of Assiniboine Lodge just right of center top? Mount Docking with the Mitchell Range, Harkin and Doer in the distance. 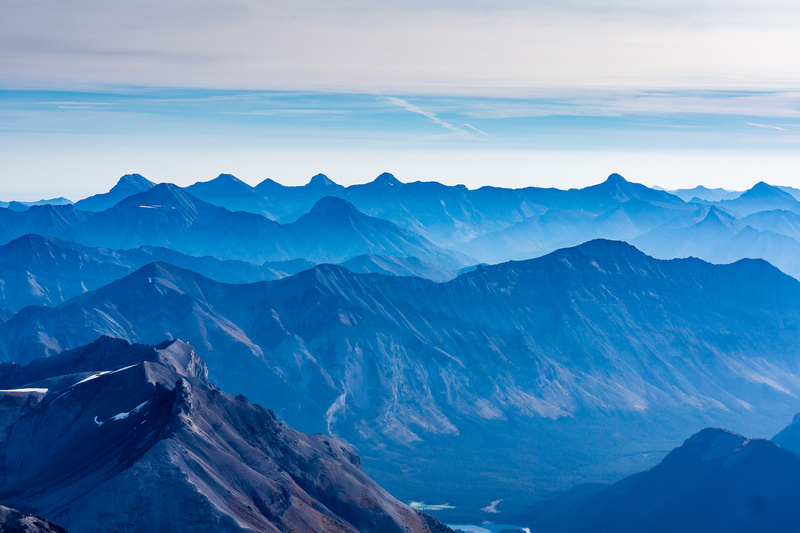 The Purcell Mountains rise to the west over the Columbia River Valley. Spot Kev on the north ridge. Spot Kev on the north ridge with The Nub at mid-left. Views over Mount Eon include Joffre and King George. Ferro Pass separates Indian Peak and the lengthy Simpson Ridge. Nub Peak with Nasswald, Golden and Fatigue in the background. Kev comes up the summit ridge. Spectacular views down on Aye, Eon and Gloria. 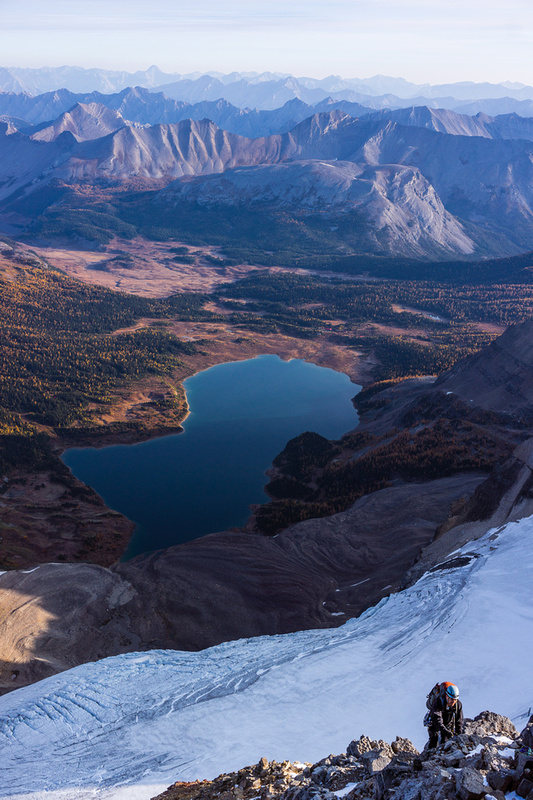 Great views down Gloria and Marvel Lakes with Eon and Aye to the right. Lunette is at lower right. Looking over The Marshall and our approach route at lower left. Kev on the summit ridge. 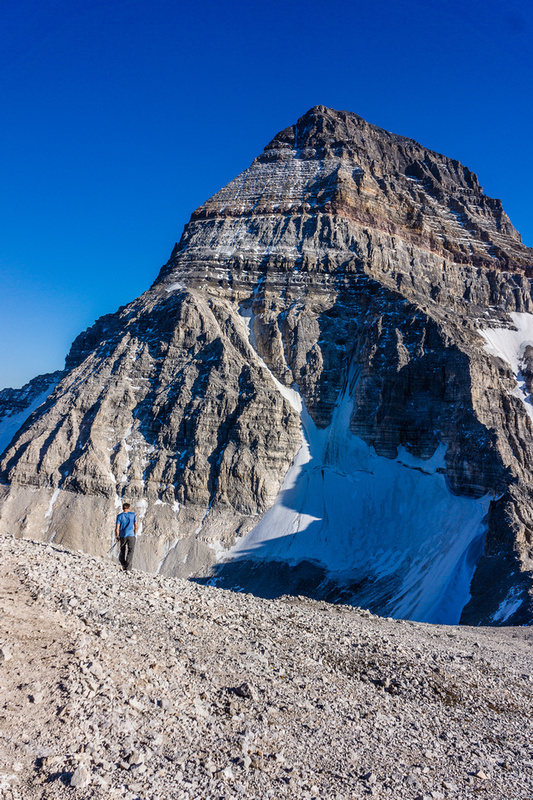 Kev approaches the summit of Mount Assiniboine. 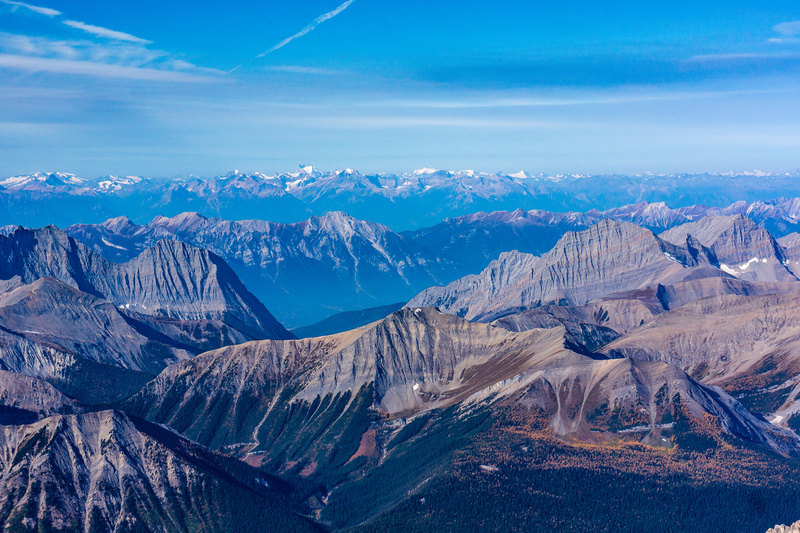 The Marshall, Watson, Indian and Simpson Ridge at right. 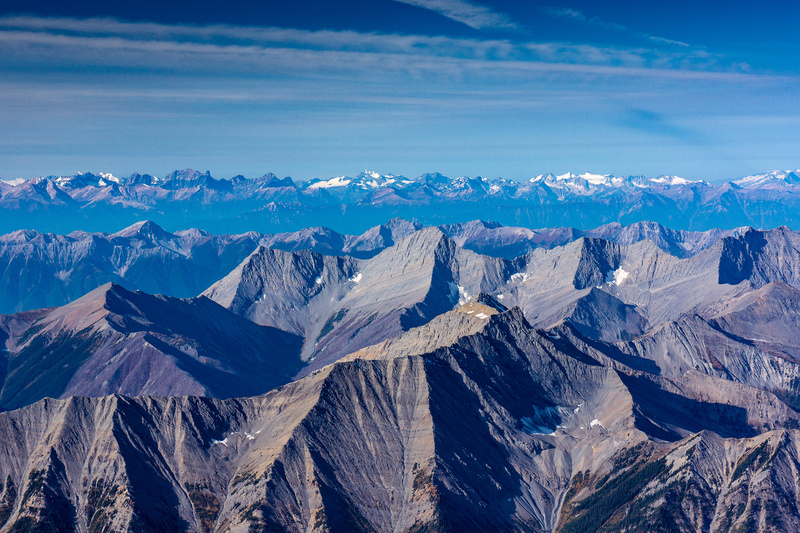 Looking over Mount Sam and the Mitchell Range to the distant Bugaboos. Looking over Ferro Pass with Indian Peak at left and Simpson Ridge at right. Mount Temple beyond. 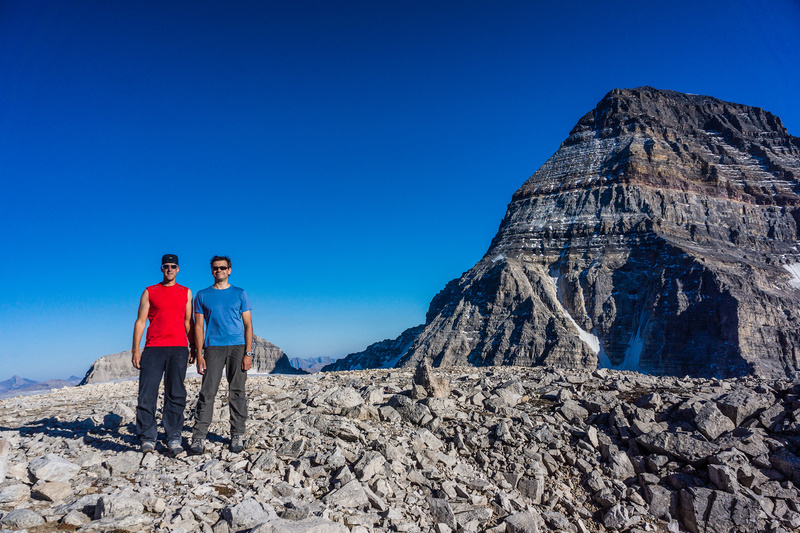 Vern and Kev on the summit of Mount Assiniboine. 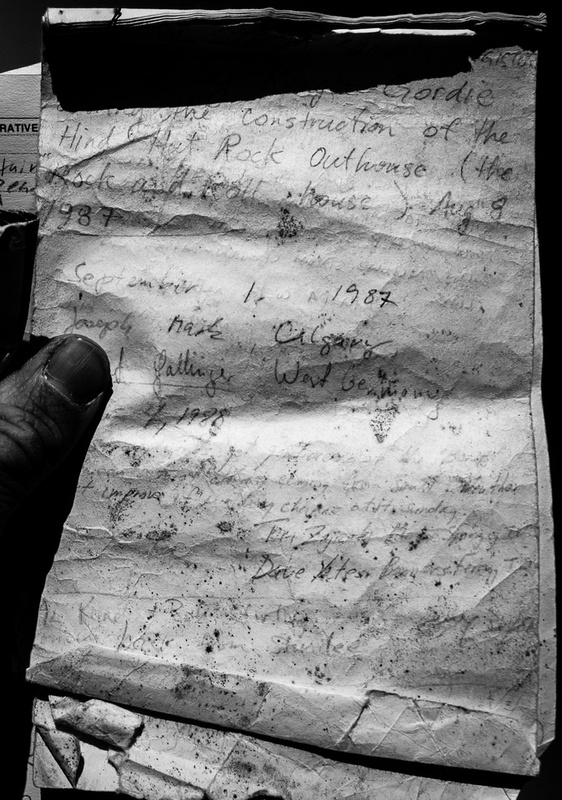 The summit register is falling apart - but I never thought I'd even get the opportunity to see this, much less sign it. 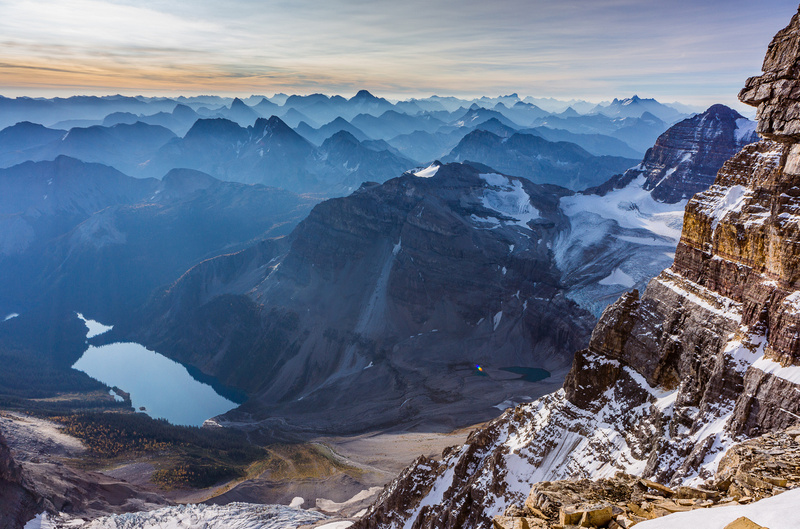 Amazing summit view over Wonder Pass, Marvel and Gloria Lakes. The Marshall isn't a small peak either. 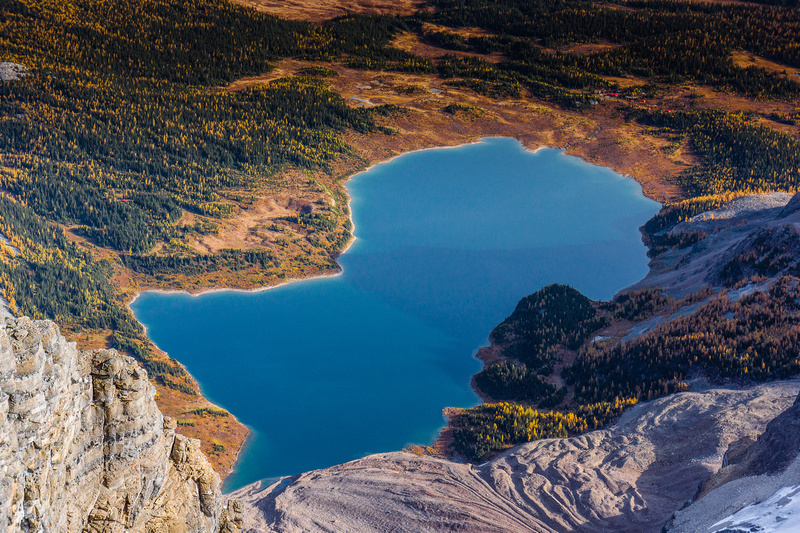 Marvel, Wonder and Terrapin Lakes. Looking east over Wonder Meadow. 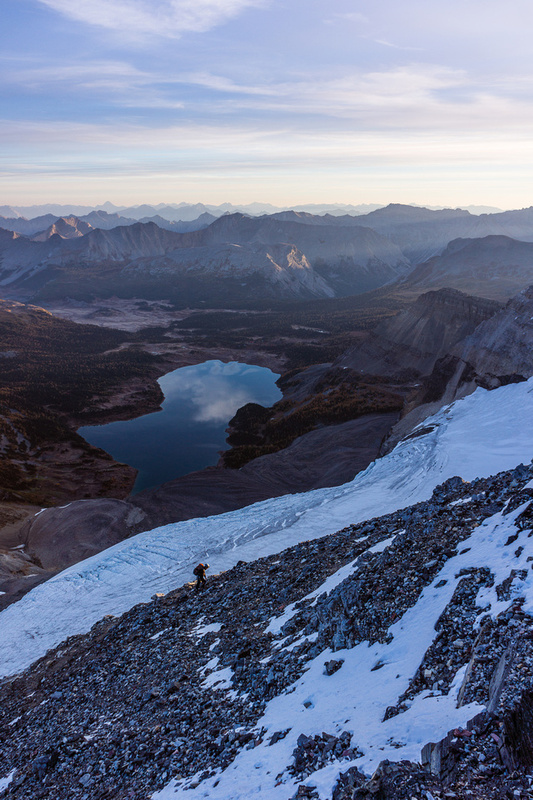 After enjoying our 4 hour ascent of the north ridge on Assiniboine we were feeling like we might just make it down to Lunette lake before dark. The only problem? Well, as it turns out – the SW face of the big ‘A’ is not quite as trivial as some might lead you to believe, especially if you didn’t ascend that way! 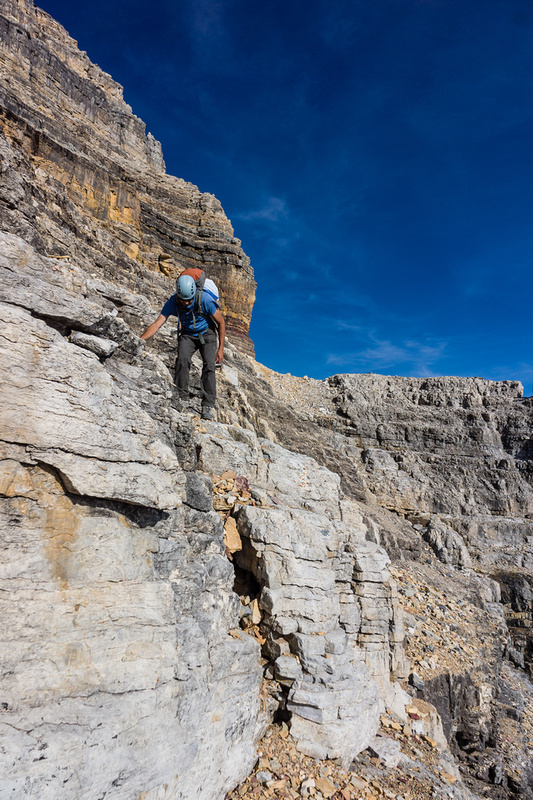 While nobody claims it’s easy, there are some trip reports on the internet of folks so-called scrambling the SW face. I re-read these trip reports after descending it myself and have concluded that these were all free solo climbs and not really scrambling at all. 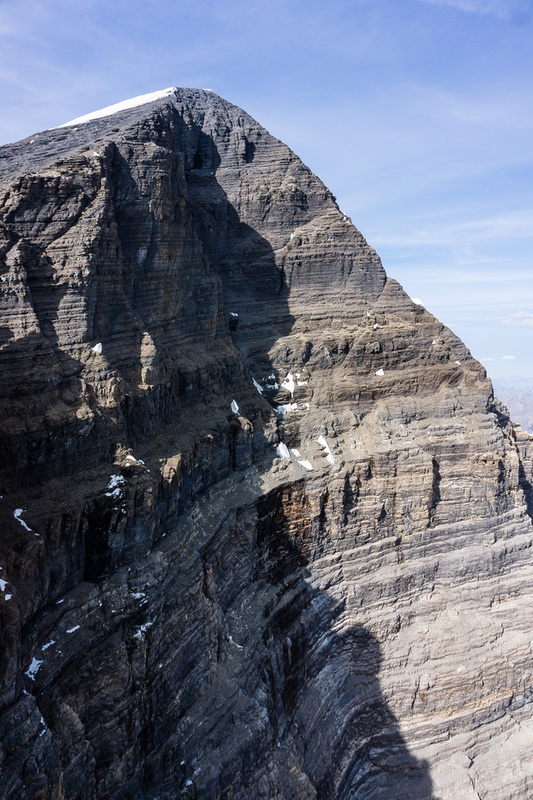 I think people should not be misled into thinking the SW face of Assiniboine offers an ‘easy’ route to the summit – in my opinion it has more objective hazard than the North Ridge route due to loose rock, tough route finding and snow / ice on route. You’ve been warned. Kev on the first rappel down the SW face. 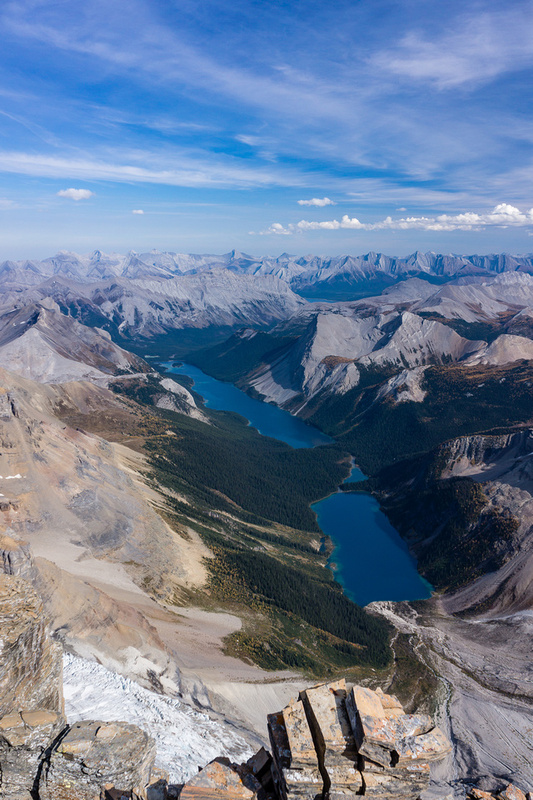 Stunning views over Lunette Lake and the Assiniboine Creek exit valley. 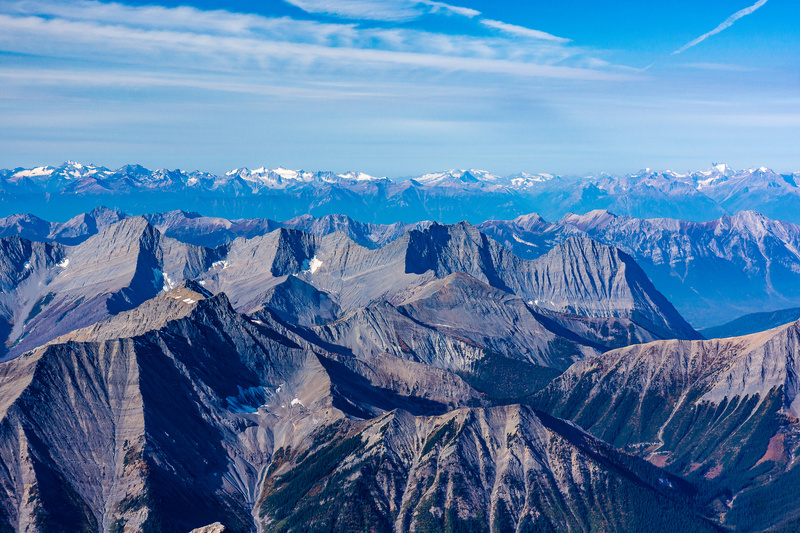 Peaks in the distance include the Mitchell Range with the Purcells and Bugaboos in the far distance here. The shortest term I can use to describe the SW face is “harrowing”. A few more? “Loose“, “Exposed“, “Loose“… It was quite nasty. By the time we finally got low enough to re-ascend Lunette we both knew that we weren’t getting back quite as quickly as we thought. We had already rapped twice just to get here and although there were some cairns (thank goodness), they didn’t avoid some pretty serious terrain. 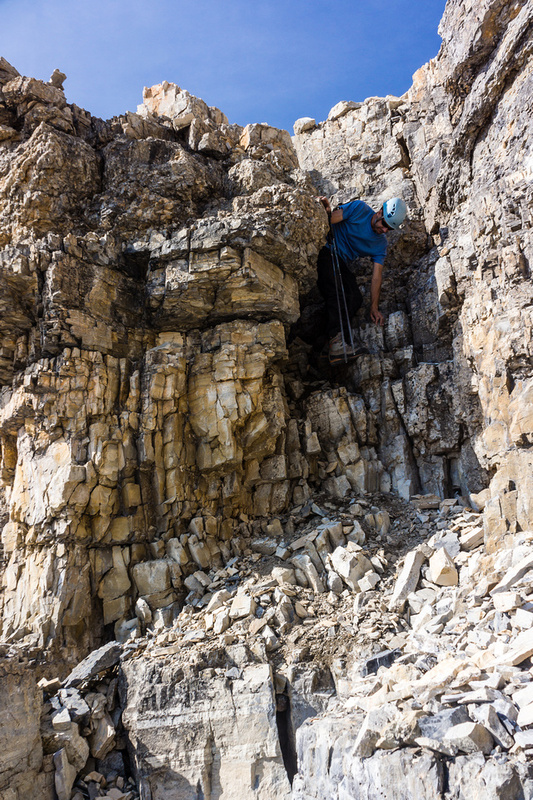 Kev does his best to stick to the SW face of Assiniboine! On the second rap the terrain was so bloody loose I knocked a pretty big rock onto the rap route while setting up. The rocks crashed onto the coils of rope I’d thrown down and I was shocked to find the rope cut clean through at the ends when I rapped down!! If that rock fell while I was on rappel I wouldn’t be here right now. Very scary stuff. It was so loose I knocked pretty big rocks down just walking PAST them. I carry some good bruises from this still. Kev works his way down along the gully separating Assiniboine and Lunette. There was running water on route, thanks to melting snow. Finding the ‘scramble’ route up Lunette wasn’t trivial either. We started up climbers right of the gully separating Assiniboine and Lunette. 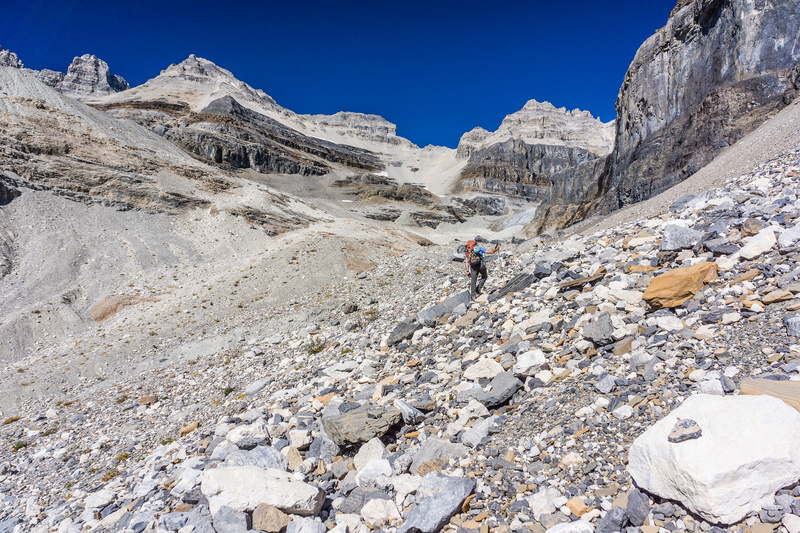 Kev suggested we traverse a small scree ledge and there were some cairns so we followed those around the west face of Lunette. 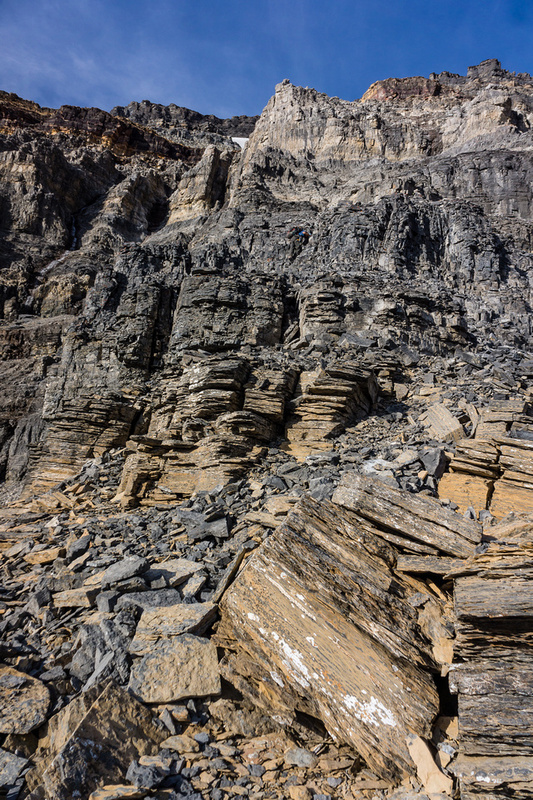 There were a few breaks in the cliffs but nothing resembling scrambling so we kept traversing climbers right. Eventually we started giving up. Kev on a shoulder of Lunette Peak underneath it’s summit, Assiniboine’s SW face rising behind him to the right. In an effort to save some energy we had left our heavy packs and even climbing gear back at the point where we started up Lunette. 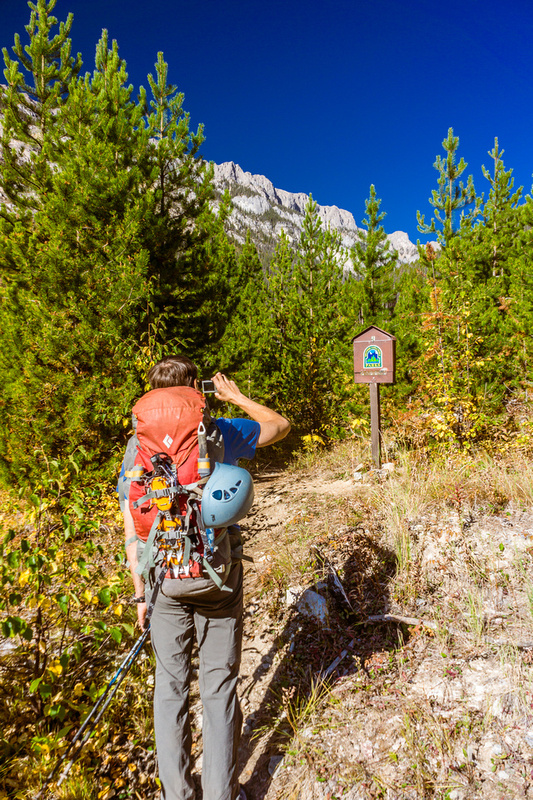 We didn’t think it would take long and we were sick of lugging those dang packs around! This was starting to feel like a mistake though – we needed to rappel every route I could see up… Finally I decided to traverse all the way right, pretty much as far right as possible before cliffing out. It worked. Barely. 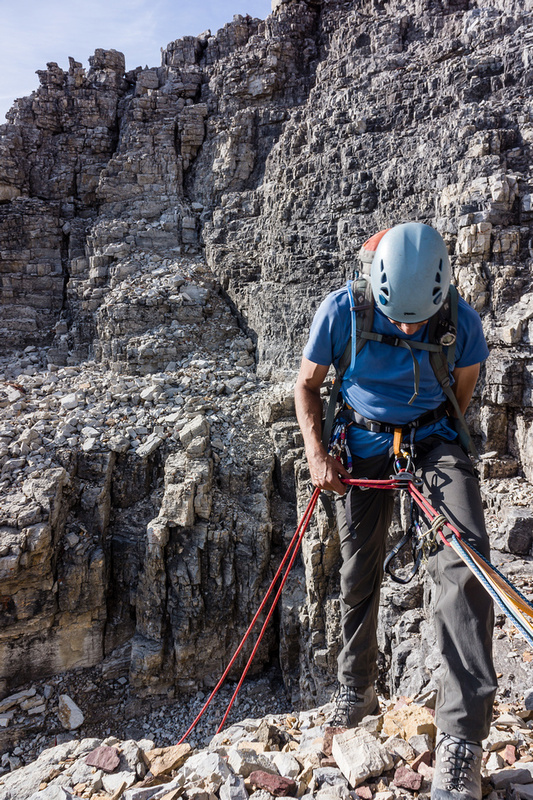 We had to ascend a tight chimney before traversing climbers left across some exposed terrain and another chimney. This gully has a huge chock stone in it and Kev went under it while I found a route around it on climbers right. A short exposed scramble and we were on top of our second 11000er of the day! 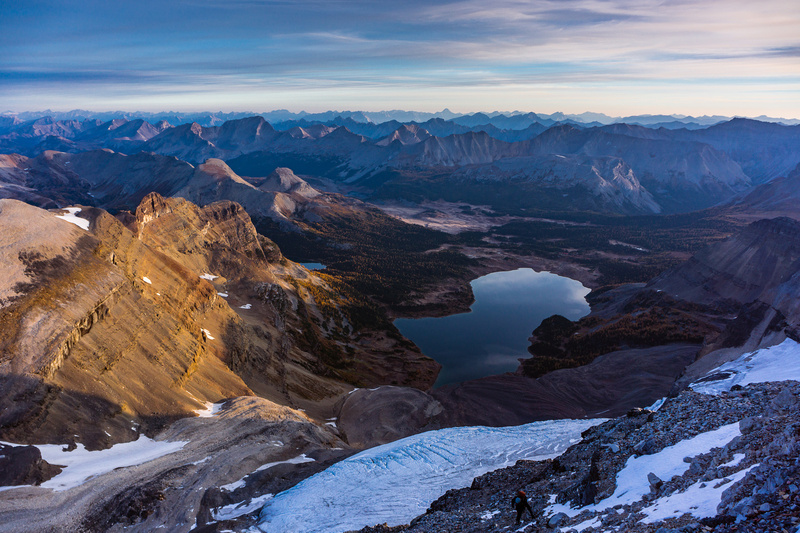 Amazing views again – including the east face of Assiniboine and Marvel and Gloria Lakes. Eon and Aye were also amazing from this vantage. 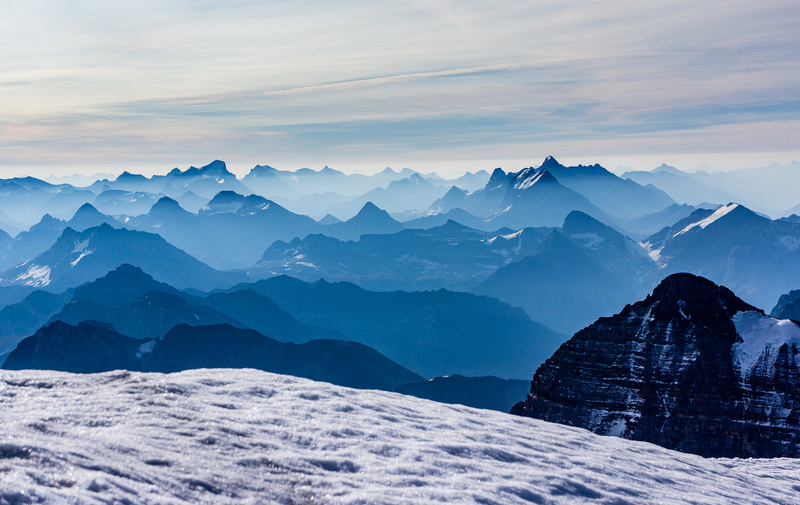 Incredible scenery from the summit of Lunette. 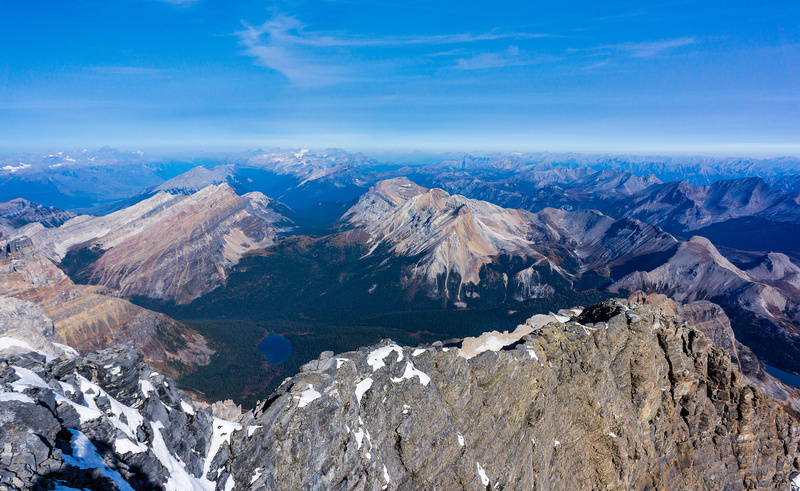 The views down Gloria, Terrapin and Marvel Lakes are better from Lunette than from Assiniboine. A massive rock is pushed up the mountain by the mighty Kev Barton!!! 🙂 Actually he just came from underneath this chockstone that’s wedged in a gully just before the summit of Lunette. We had a long day still ahead of us descending the rest of the SW face and hiking back to the truck – not to mention the drive back. 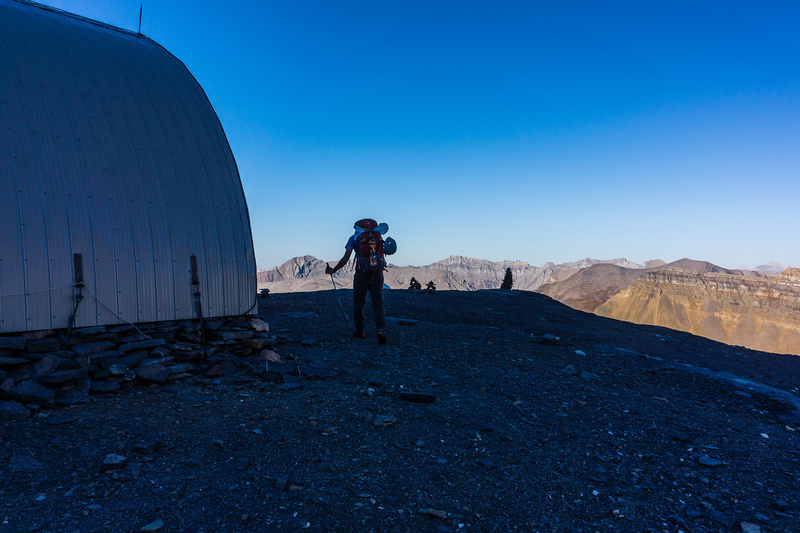 After a brief summit break we headed back down Lunette to our waiting gear. The down-climbing wasn’t terrible but I got lucky finding that route because there was no evidence of prior parties on it and lots of rappel stations in other locations on Lunette. 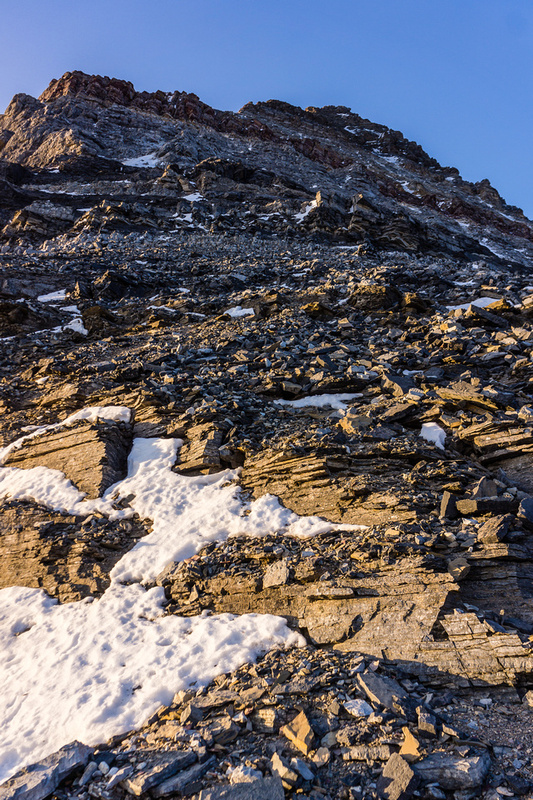 Like all the down climbing on the SW face of Assiniboine, it was very, very loose. 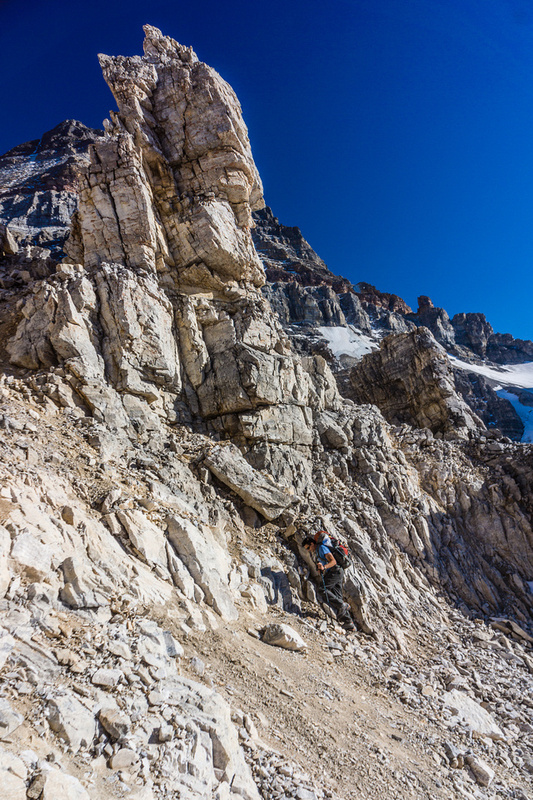 The key on Lunette Peak and the SW face of Assiniboine is a small climbing party and plenty of patience to work your way down. 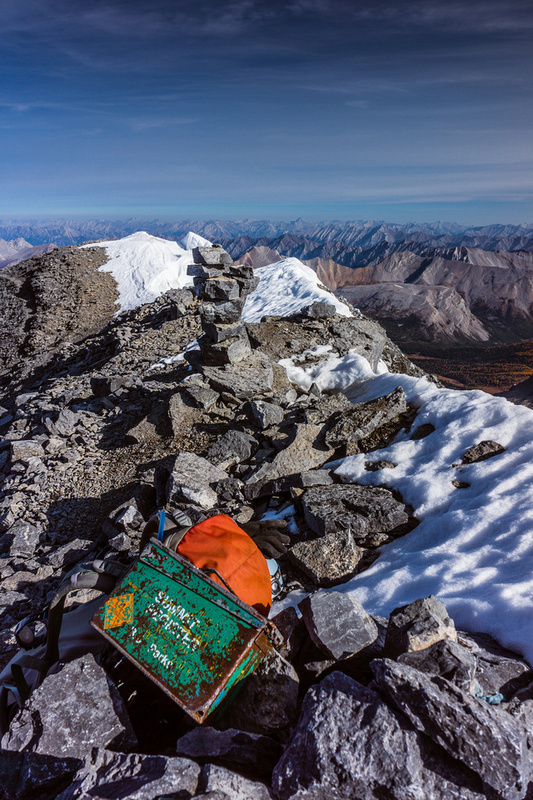 There are cairns and markings but they don’t guarantee the best or easiest routes. 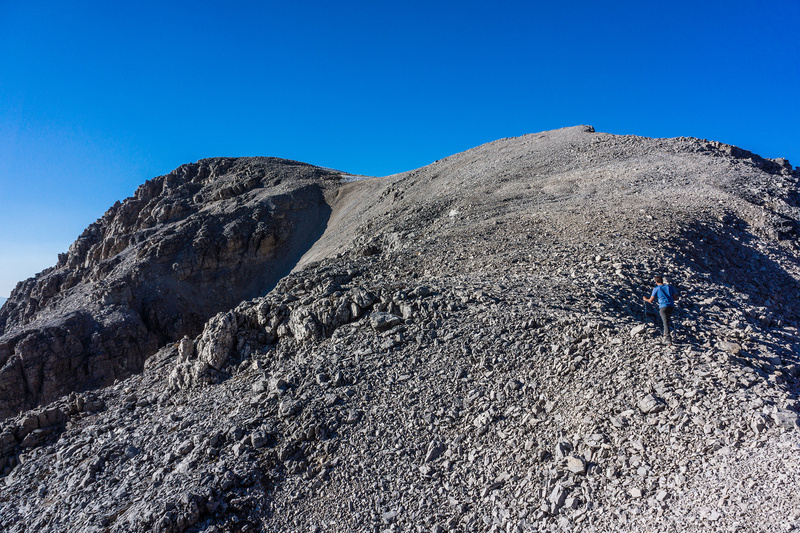 We found our own route up Lunette Peak and it wasn’t marked by any previous parties. 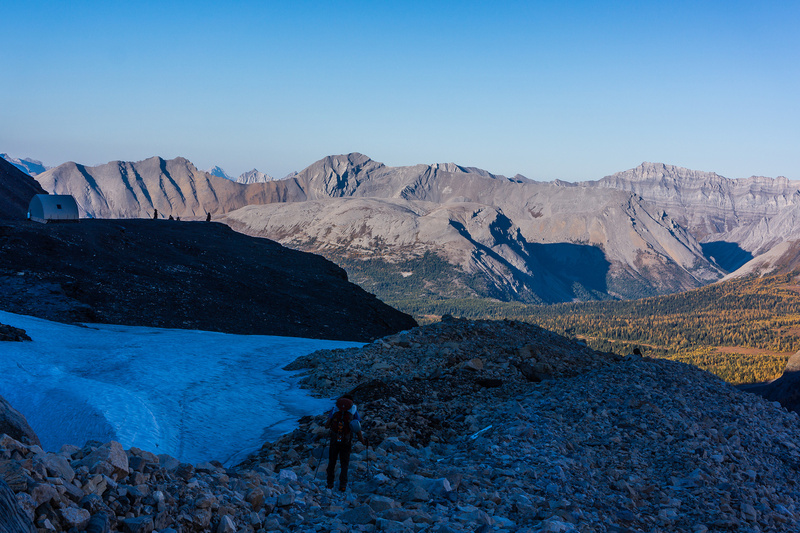 We struggled slowly down the massive SW face inching ever so slowly towards Lunette lake and freedom. But freedom didn’t come easily for us. 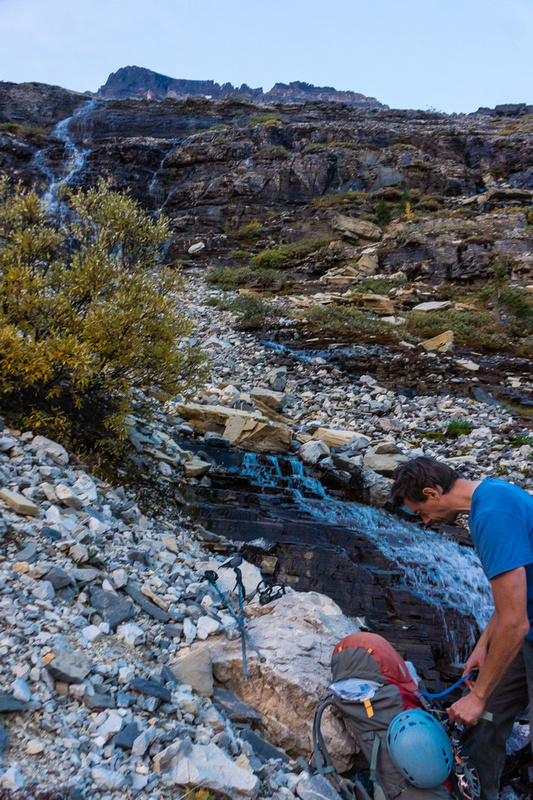 We rapped a third time and still had to find routes down a seemingly endless line of cliff bands and loose gullies. 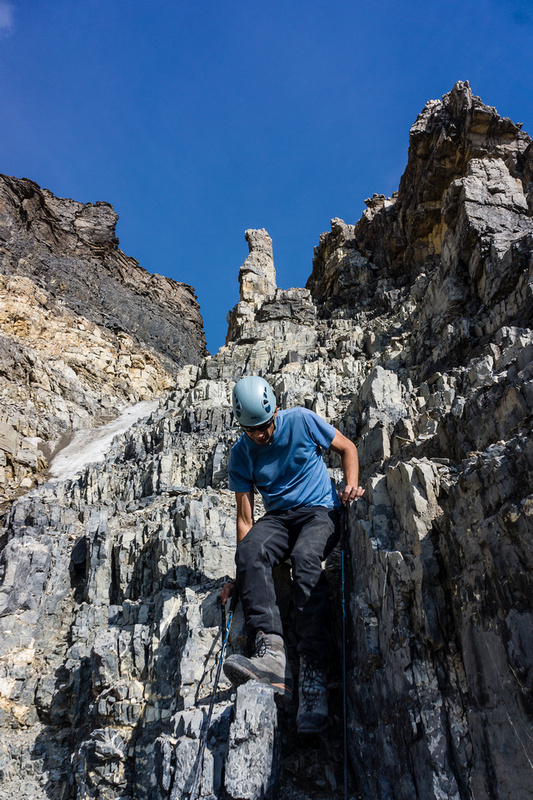 We were thankful for cairns, orange flagging and even red paint on the rocks but even with all these route markers it was hard to navigate such a loose and complicated route that we didn’t ascend. IMHO unless you are chasing the 11000ers I wouldn’t bother with Lunette. 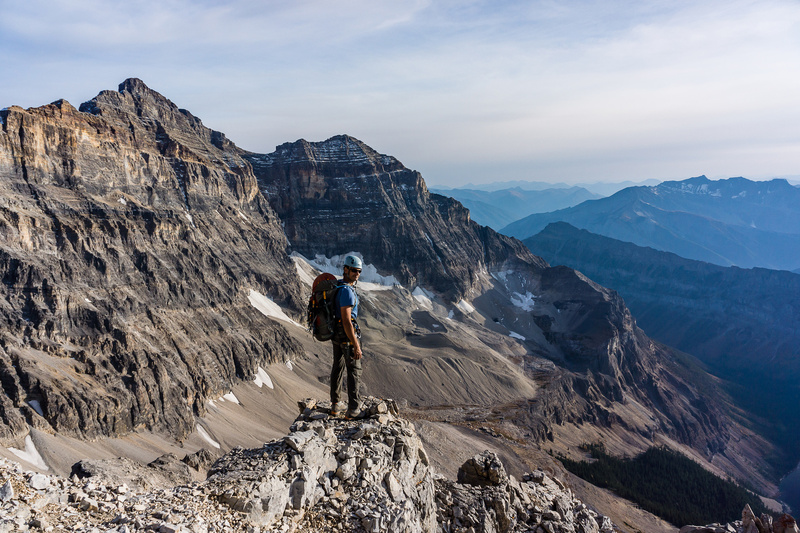 It’s views are nothing compared to Assiniboine and the ridge route is so much better than the manky crud on the SW face that I would suggest avoiding this face all together if possible. 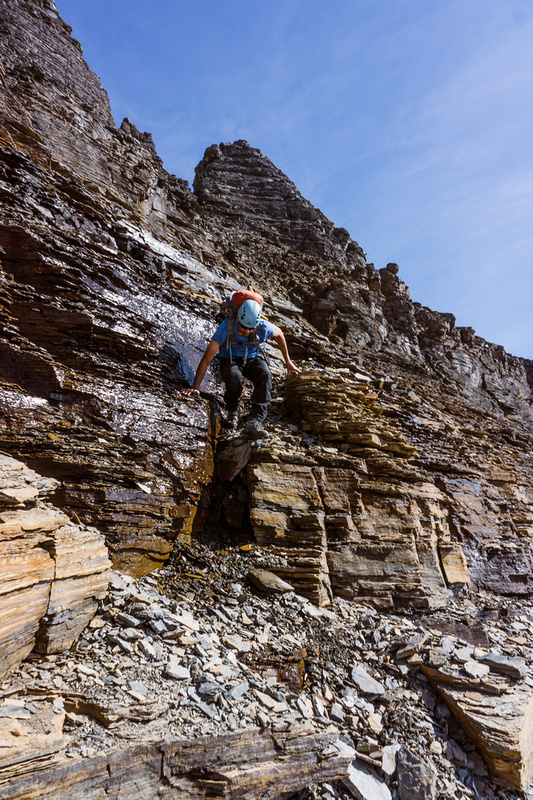 It’s certainly easier to descend it if you scramble up it too, but you’ll need at least one or two raps anyway on descent. It’s not the ‘scramble’ that I’ve read it is. I’ve done many mangy, nasty scramble routes in my hundreds of peaks but this one takes the cake. The shadows are slowly getting longer but we’re way below Aye and Eon finally! 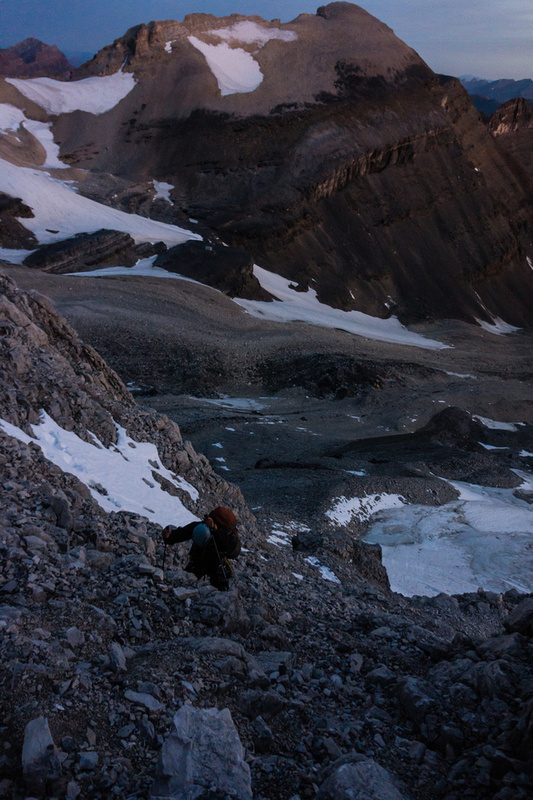 After hours and hours of stressful and painfully slow down climbing we were finally in the last exit gully before the lake. Right? Wrong! As the sun set and we strapped on our headlamps we still weren’t even at the lake yet! Wow. 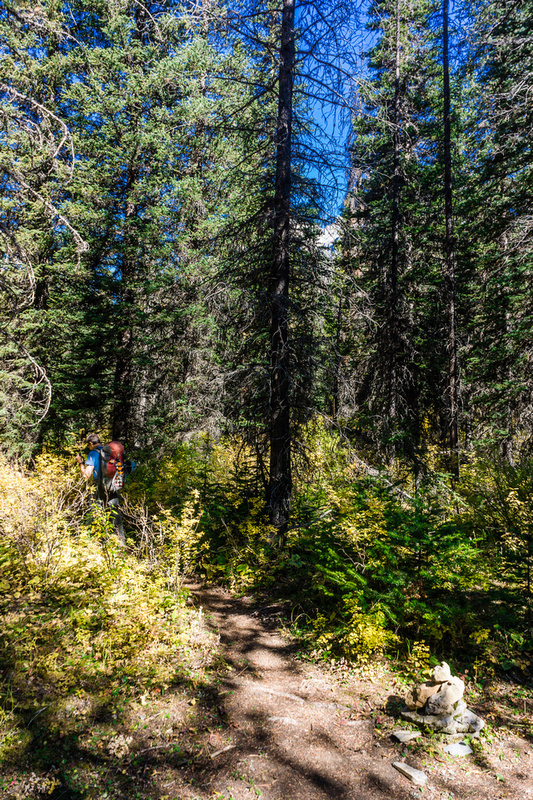 What followed was a nasty bushwhack in the dark – no trail that we could find! We tried desperately to get to the lake but even started to run into cliff bands in the forest! 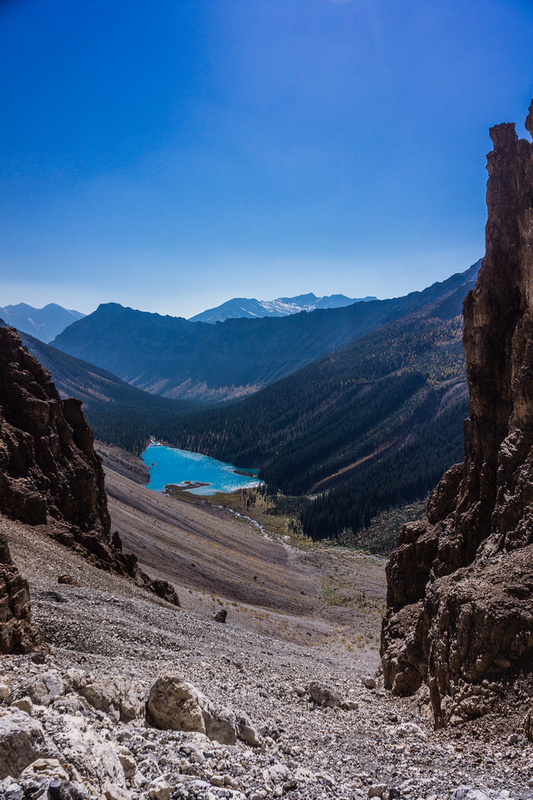 Finally we had a stroke of genius / luck and broke onto a hard scree slope on the south side of the lake that ran through the cliffs all the way to the lakeshore. We had to guess at the route by now, because it was pitch black out by this point in our day. At this point we are almost home-free right? Wrong! A few more cliff bands on the SW face yet and then a few MORE to reach the lake since we couldn’t find a trail in the pitch dark. We thought about an hour or so to the lake from here but it’s hours away yet – a very foreshortened view. It’s much darker than this photo makes it appear here. 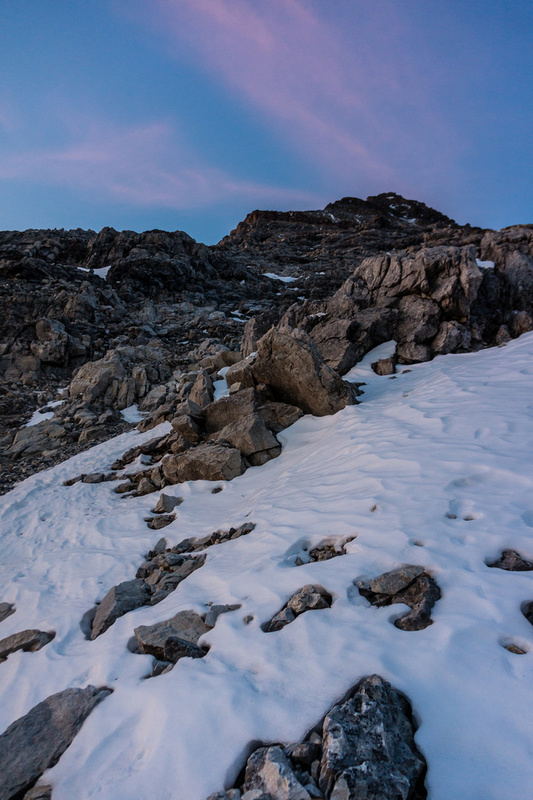 I have no more photos after this one – a glance back at the massive SW slopes of the big “A” and Lunette. FINALLY we reached the trail going around the climbers right of the lake. We started following cairns only to lose them again. 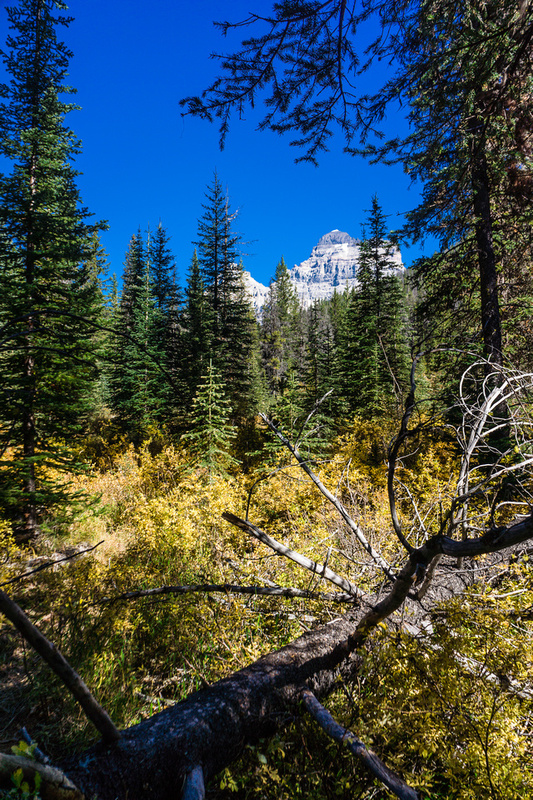 It was extremely frustrating to bushwhack around Lunette Lake when we knew there was a trail somewhere in all this mess. We eventually stumbled on the trail leading back to the truck and after 1.5 hours, at 23:00 we stumbled into the parking lot. 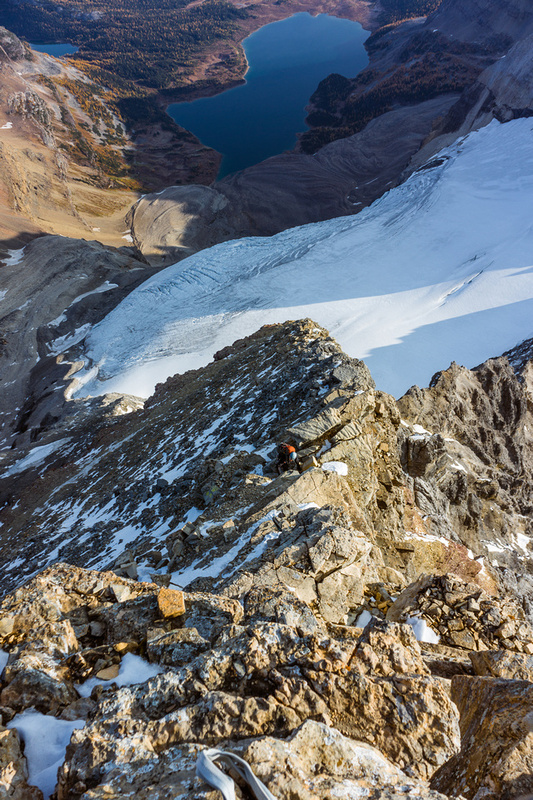 Descending the loose upper SW face of Mount Assiniboine. 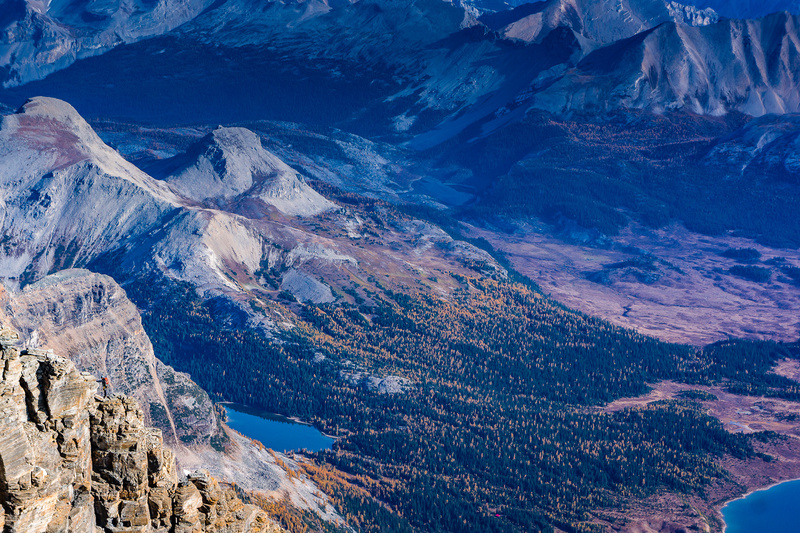 Intimidating views over Lunette Peak (looking much closer than it is!) with Eon and Aye towering next to it. Rapping the upper SW face. 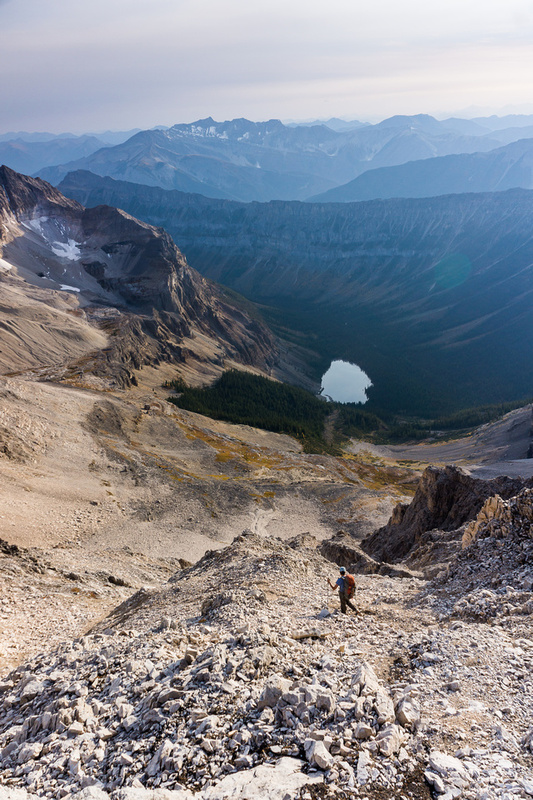 Great view down the SW face, looking at a very distant Lunette Lake and our exit valley. Lunette Lake and our exit valley are far below. 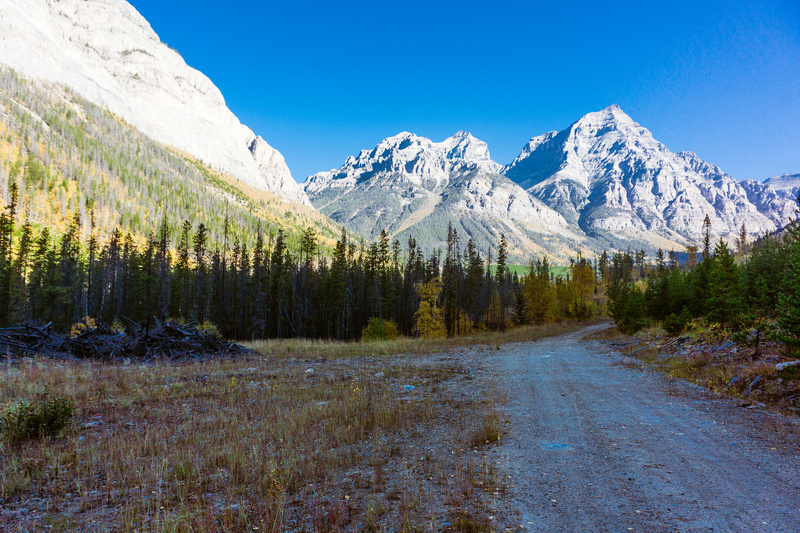 Stunning views down the Assiniboine Creek exit valley over the Mitchell Range to the Purcells. 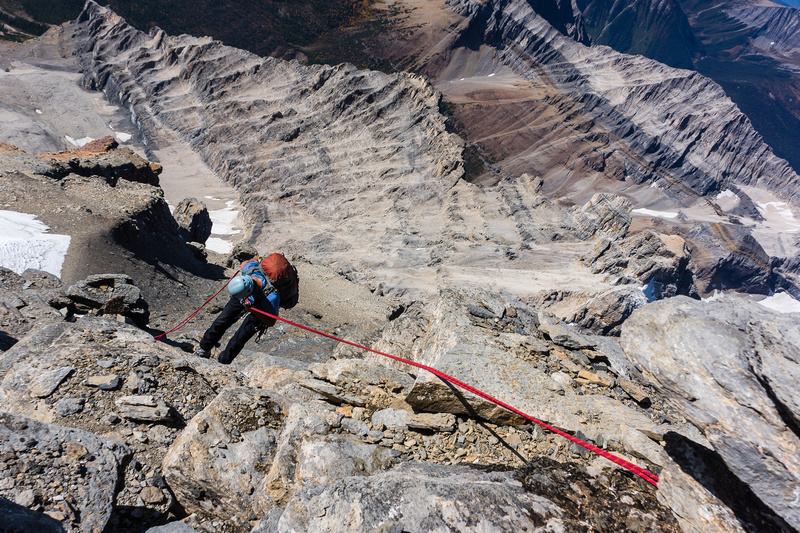 he terrain on the SW face is continuously threatening to kick you off - very careful downclimbing is necessary. More careful down climbing on dinner plate slate. 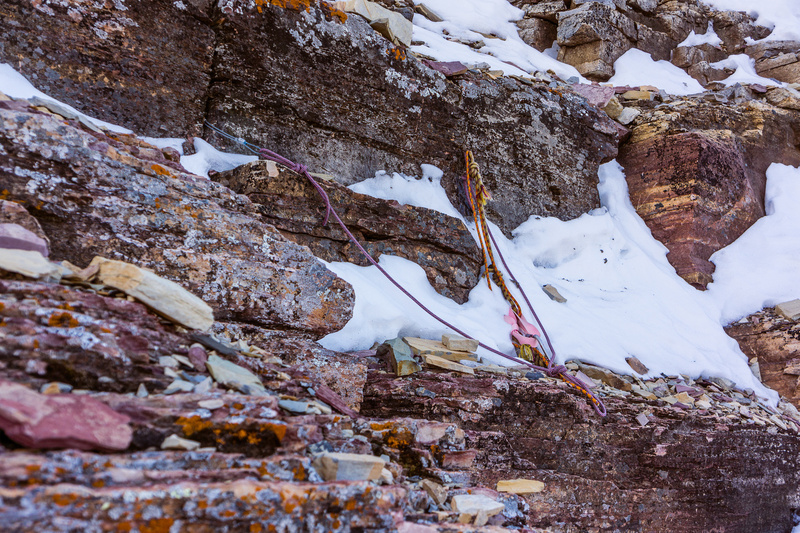 Little ledges are the key to working your way down the face, traversing back and forth breaks the many cliff bands. 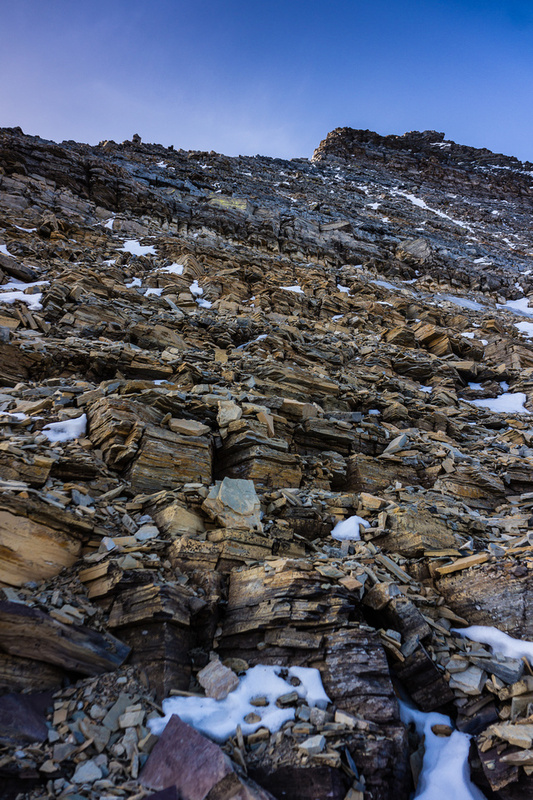 Looking back up at the summit of Lunette Peak. 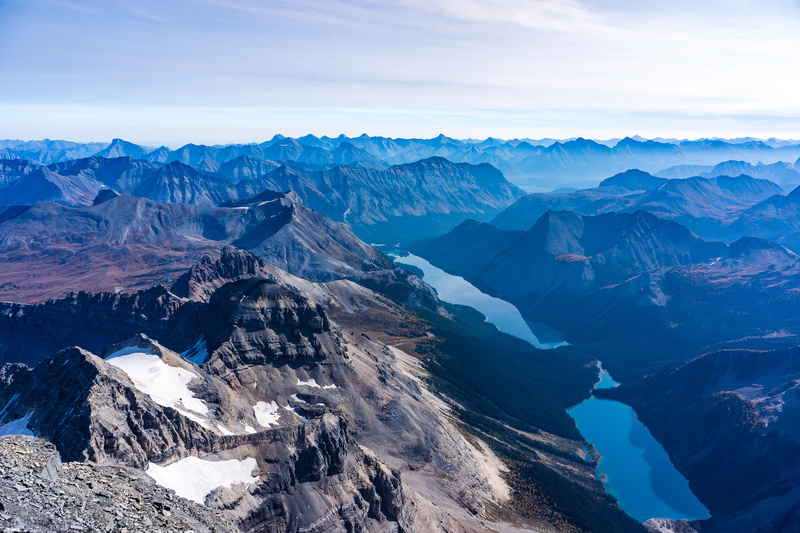 Gloria, Terrapin and Marvel Lake from the summit of Lunette Peak. Kev on the summit of Lunette Peak. 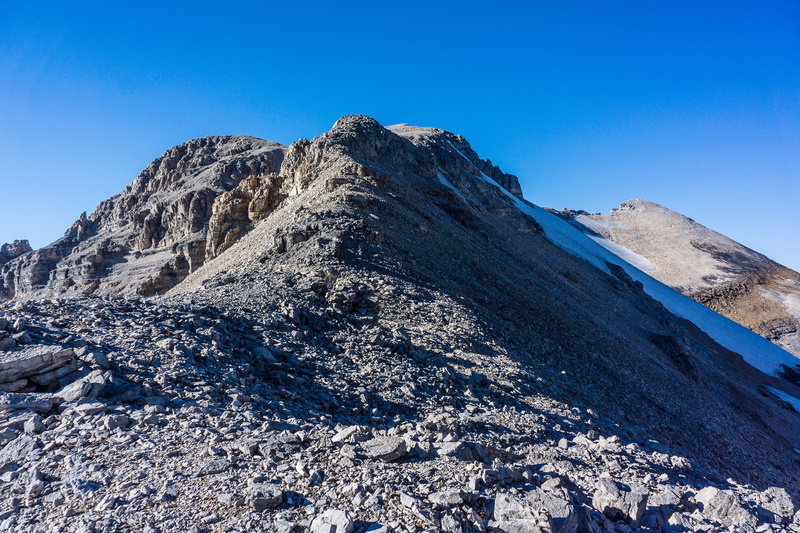 Views towards the east face of Eon from Lunette Peak. 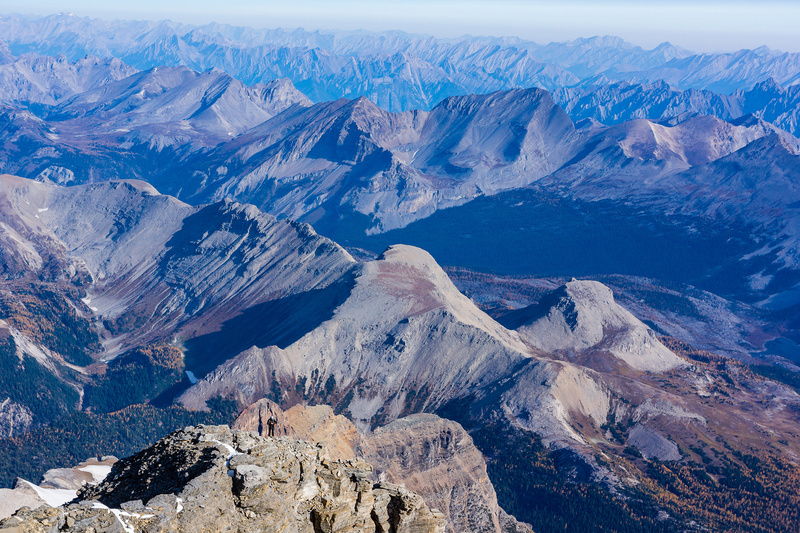 Incredible scenery from the summit of Lunette. 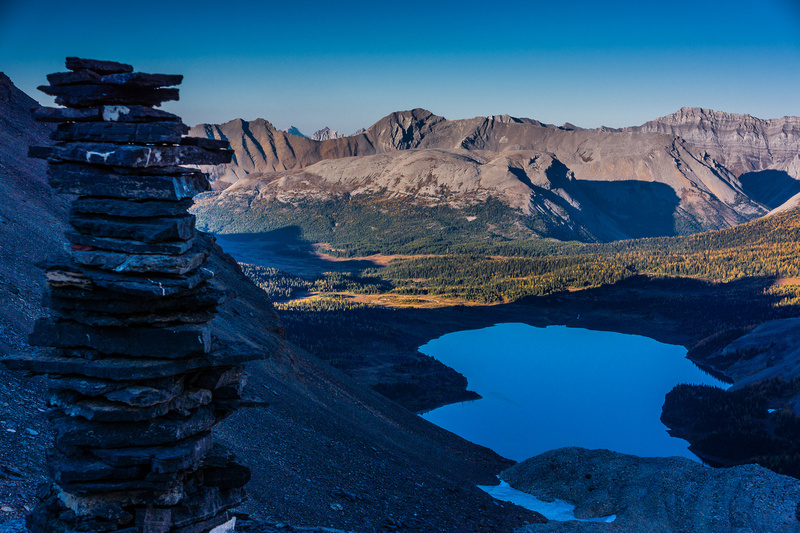 The views of Gloria and Marvel Lakes are better from Lunette than from Assiniboine. Vern on the summit of Lunette Peak. 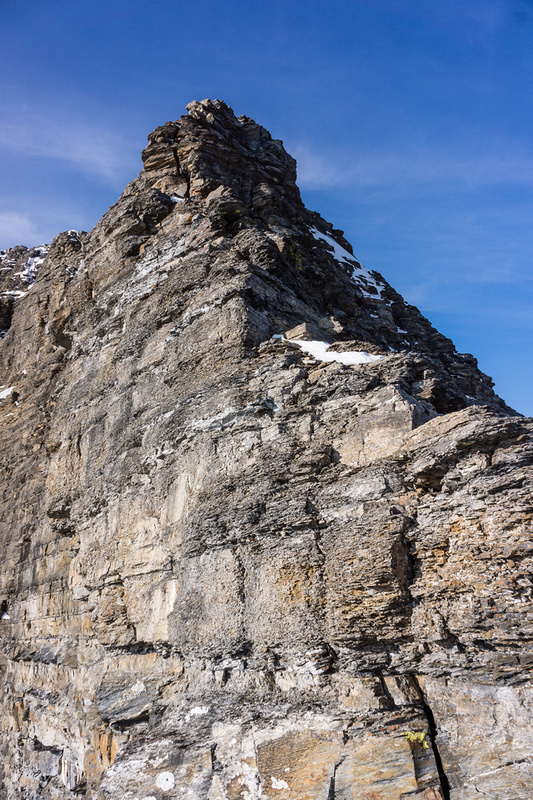 Assiniboine's SW face and east face to the right. We ducked under this chockstone descending from Lunette. 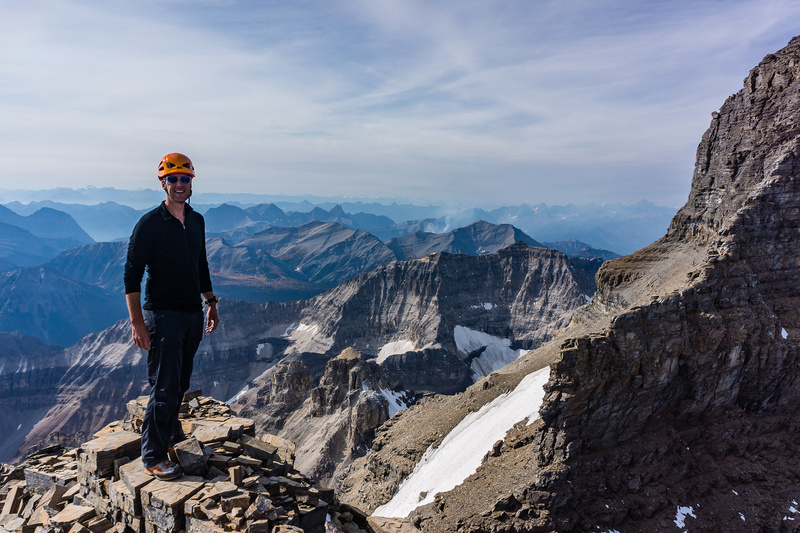 Kev on a shoulder of Lunette Peak underneath it's summit, Assiniboine's SW face rising behind him to the right. There are many of these small but extremely loose cliff bands to negotiate coming down Lunette. 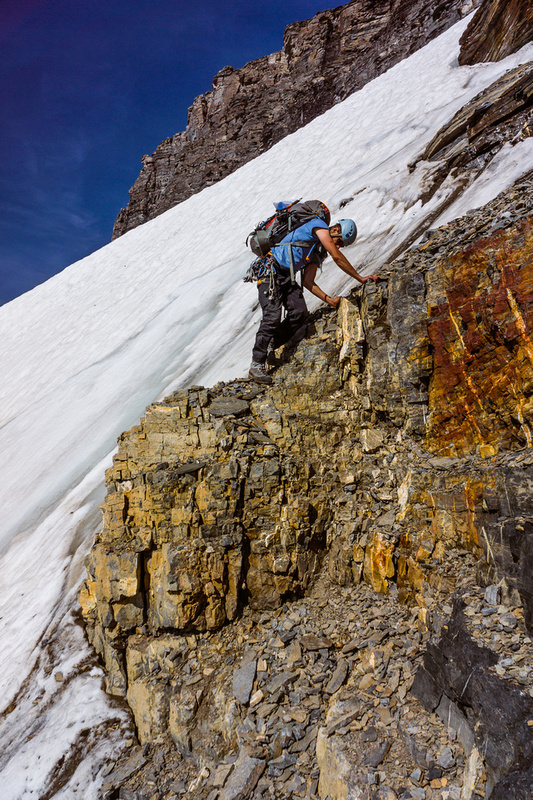 The key on Lunette Peak is a small climbing party and plenty of patience to work your way down. 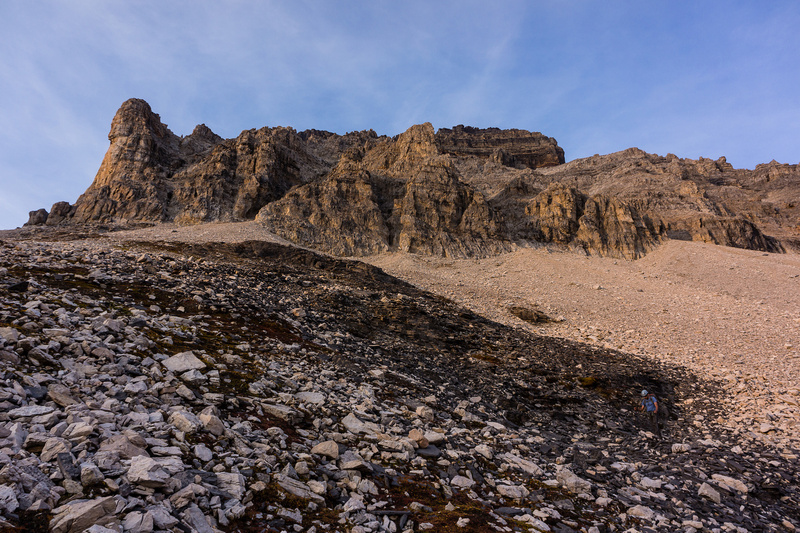 Traversing back to the SW face from Lunette. Kev descends the scree bench beneath Lunette's summit block - we're almost lower than Eon and Aye finally! Back at our packs after descending the summit block on Lunette, Kev adjusts his boots for the long and painful descent still ahead of us. 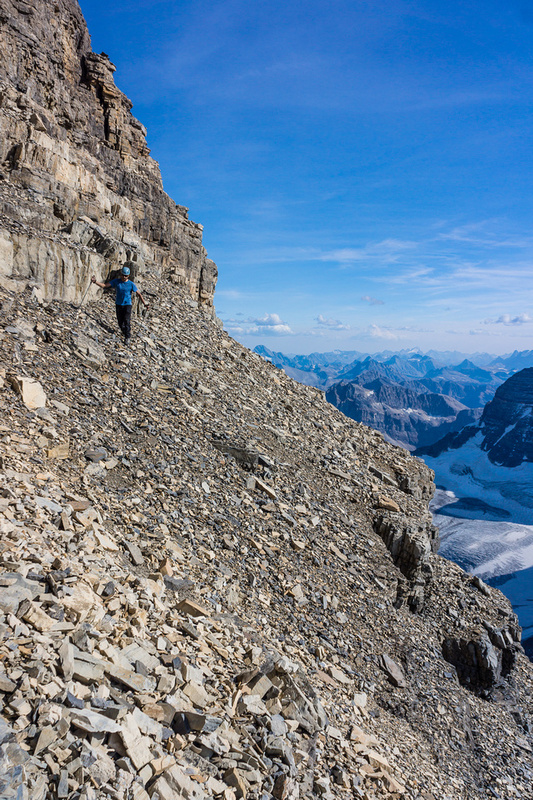 Kev descends beside the gully that separates Assiniboine and Lunette. We probably could have downclimbed the 5.2'ish terrain but at this point we just didn't feel like it anymore. 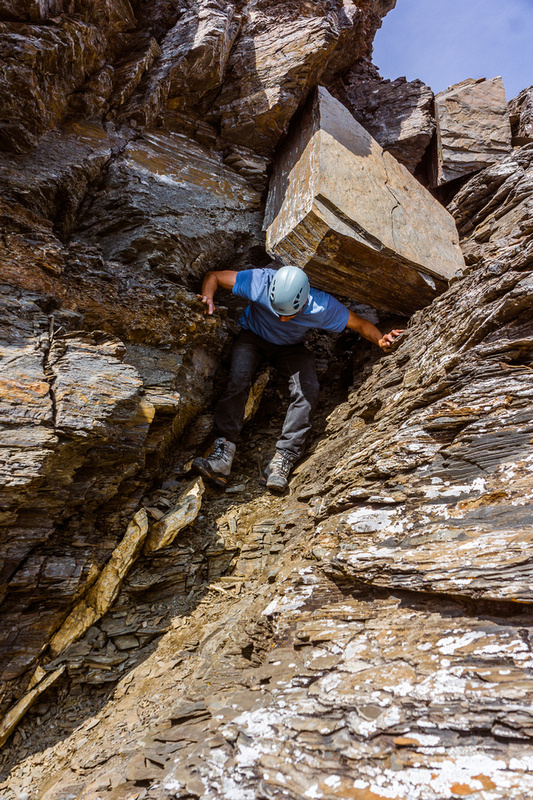 Kev descends under a steep and convoluted section of the SW face. Descending the neverending SW face. Our escape gully off the SW face. Looking back at Kev just past the escape gully. It's so much bigger than it looks from here! Interesting route finding by Kev! Why go over the cliffs when you can walk through them instead? Still an hour from Lunette Lake and darkness is growing. 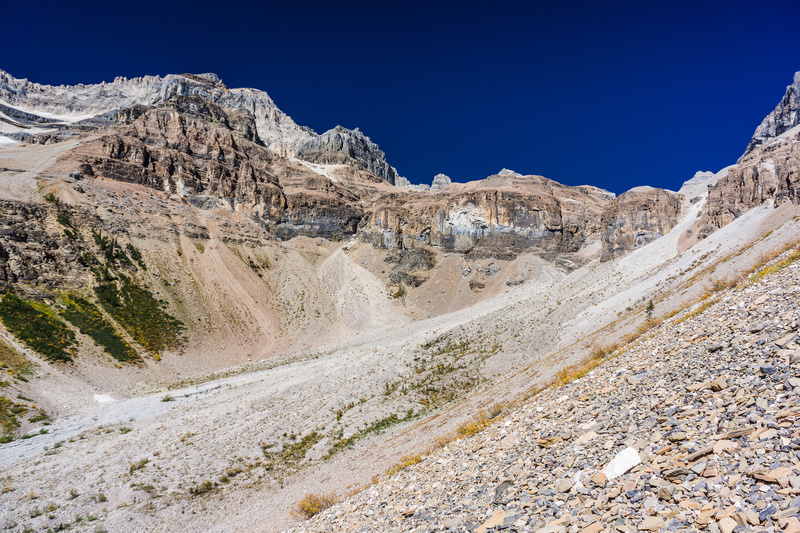 Finally off the SW face and descending lower scree slopes to Lunette Lake - much darker than this photo makes it appear. This stream was so refreshing and welcome! It's much darker than this photo makes it appear here. 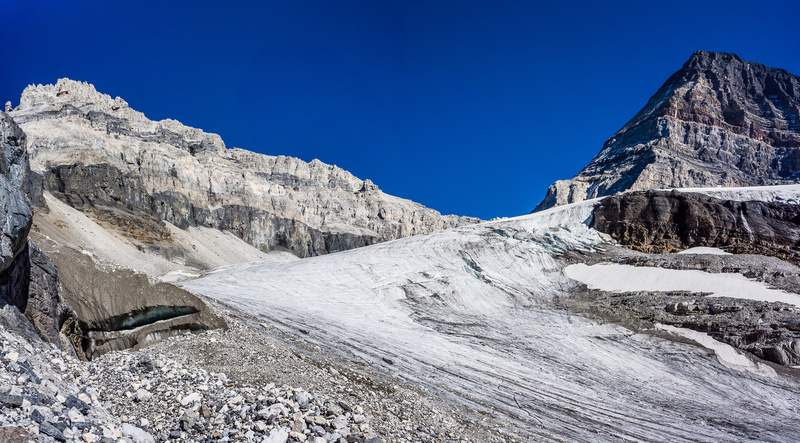 I have no more photos after this one - a glace back at the massive SW slopes of the big "A" and Lunette. On the way home at around 01:00 we had to slow down for a pack of wolves crossing highway 93. An amazing and rare sight! A great way to end an amazing trip – one I won’t soon be forgetting. It took us roughly 36 hours truck-to-truck for Strom, Assiniboine and Lunette. It felt very, very good to be off the SW face but I miss the ridge already. 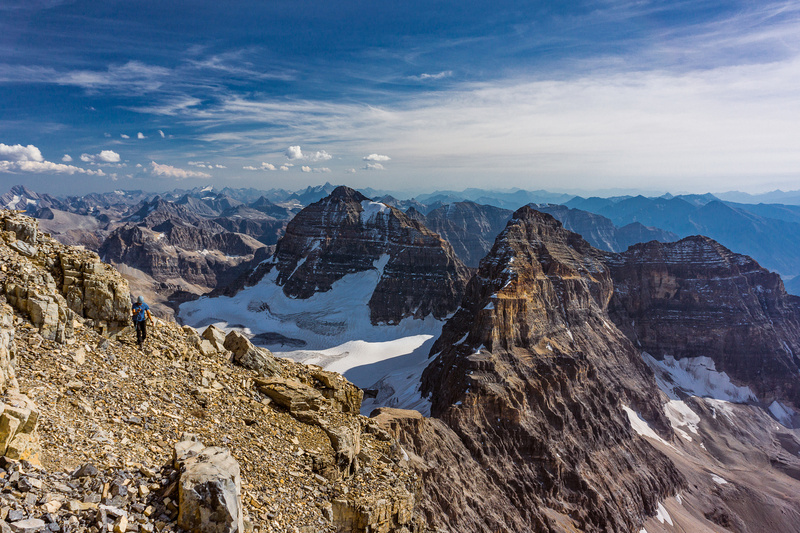 Assiniboine was a great climb with great company. I look forward to more of these pesky 11000ers – they sure bring out some fresh challenges compared with the scrambles that I’m used to.